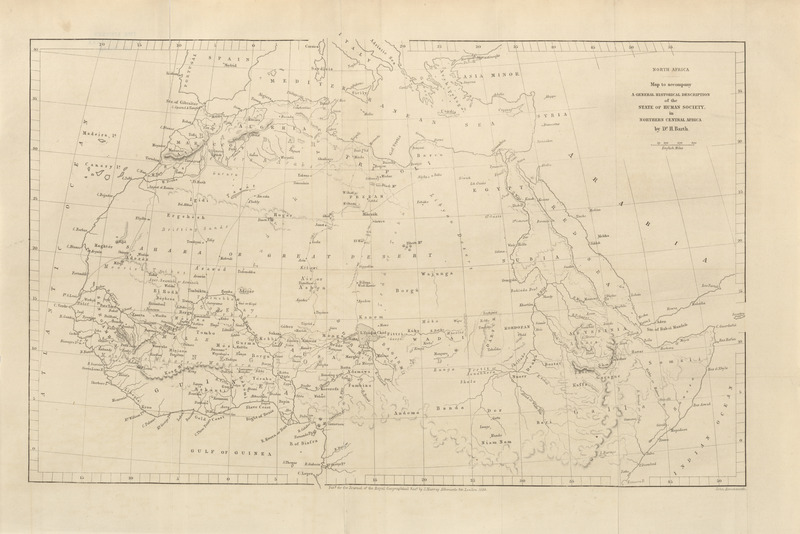 Egyptian Desert between Keneh and Suez, J. Wilkinson, 1831 (2.3MB) Notes on a part of the Eastern Desert of Upper Egypt, accompanied by a map. Communicated by J. Wilkinson, Esq. 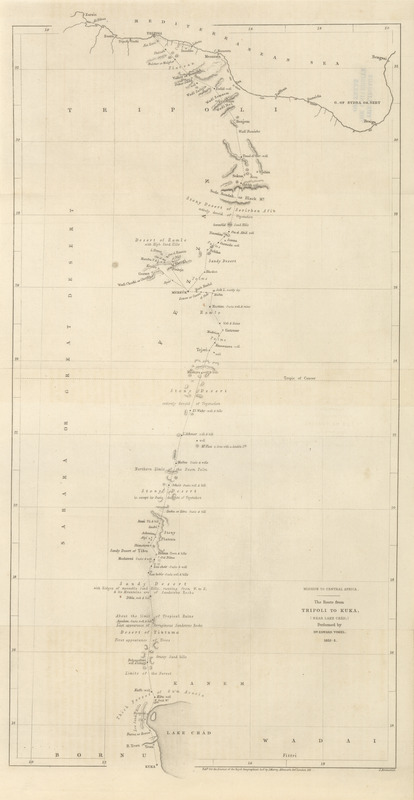 Some remarks relative to the geography of the Maldiva islands, and the navigable channels (at present known to Europeans) which separate the atolls from each other. 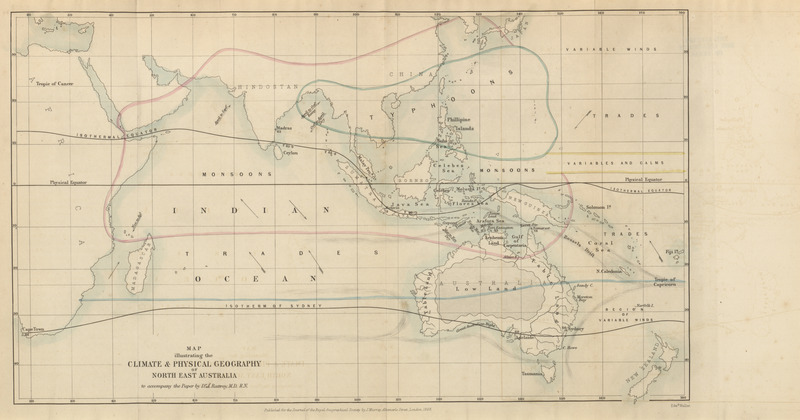 Communicated by James Horsburgh, Esq., hydrographer to the East India company. Account of the Cossyahs, and of a convalescent depot established in their country, 280 miles N.E. from Calcutta. Extracted from the private letters of an officer quartered there, and communicated by Lieutenant Murphy, R.E. 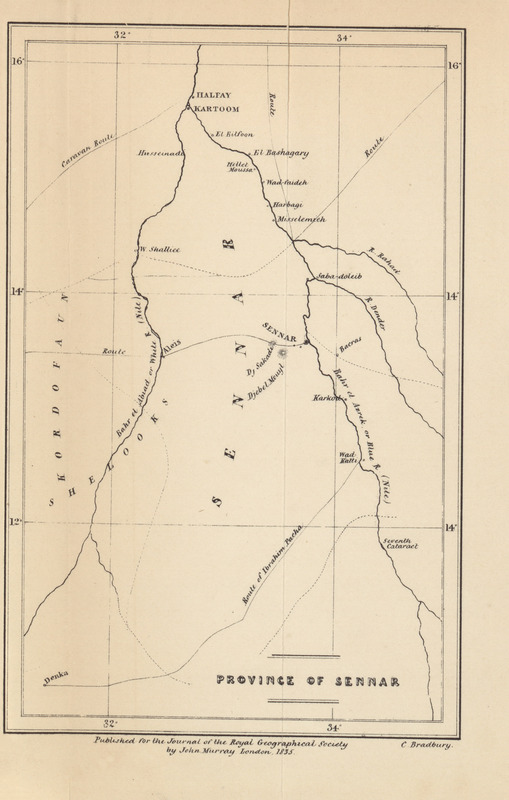 Journal of a voyage on the Bahr-Abiad or White Nile, with some general notes on that river, and some remarks on the District of Atbara, made in a tour from Hartoum. 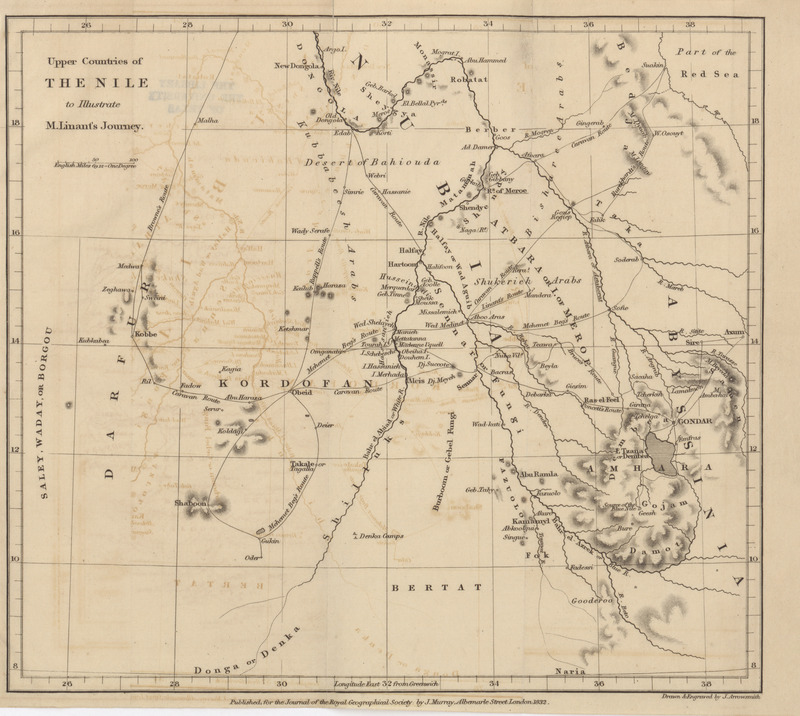 Translated and partially abridged from a report addressed by M. Adolphe Linant to W. M. Leake, Esq., Secretary of the Association for promoting the discovery of the interior parts of Africa. 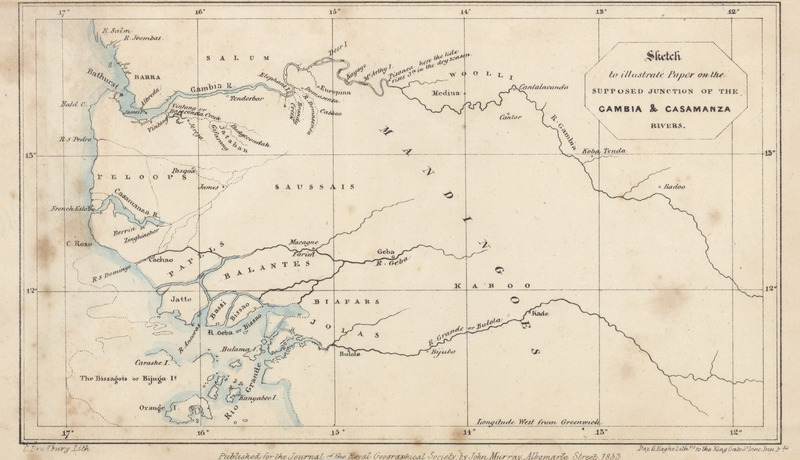 Supposed junction of the rivers Gambia and Casamanza, on the Western coast of Africa. By R.W. Hay, Esq. 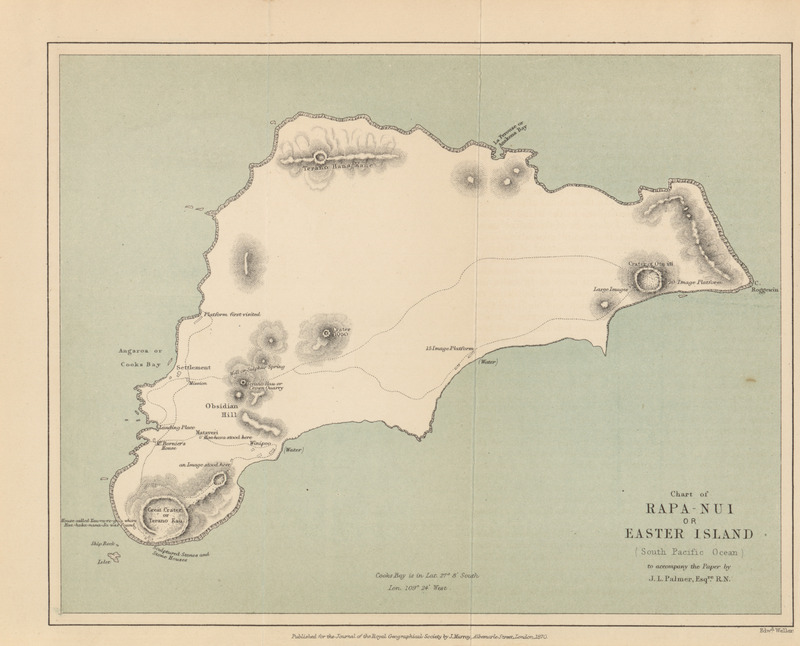 Account of East Falkland Island. By Woodbine Parish, Esq. 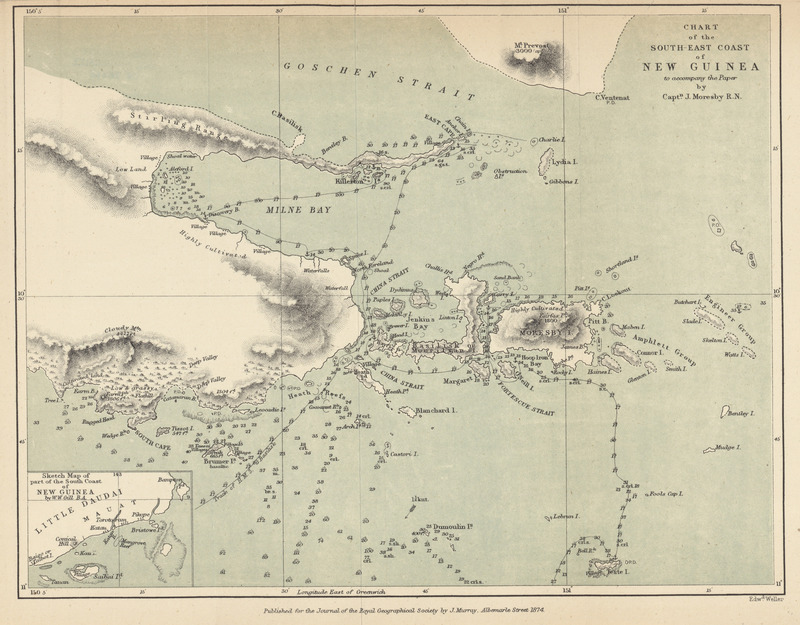 Remarks on the heavy swell along some of the West India islands, commonly called "Ground" or "North Sea"; and on the set and velocity of the tides, and the effects produced by their transporting power, among the Virgin Islands. 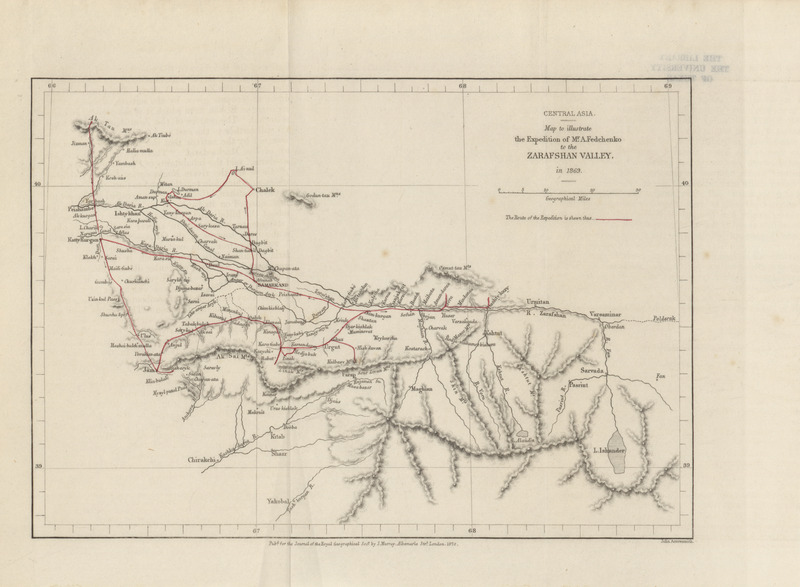 Extracts from private memoranda kept by Lord Prudhoe on a journey from Cairo to Sennar, in 1829; describing the Peninsula of Sennar. Notice on the Ruins of Berenice. By Lieutenant R. Wellsted, I.N. 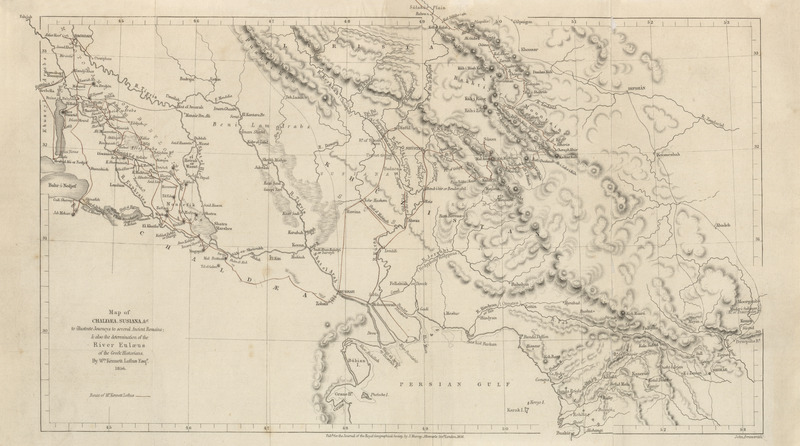 Extracts from notes made on a journey in Asia Minor in 1836. By W.F. Hamilton, Esq. A brief account of the late voyage of H.M.S. Terror. 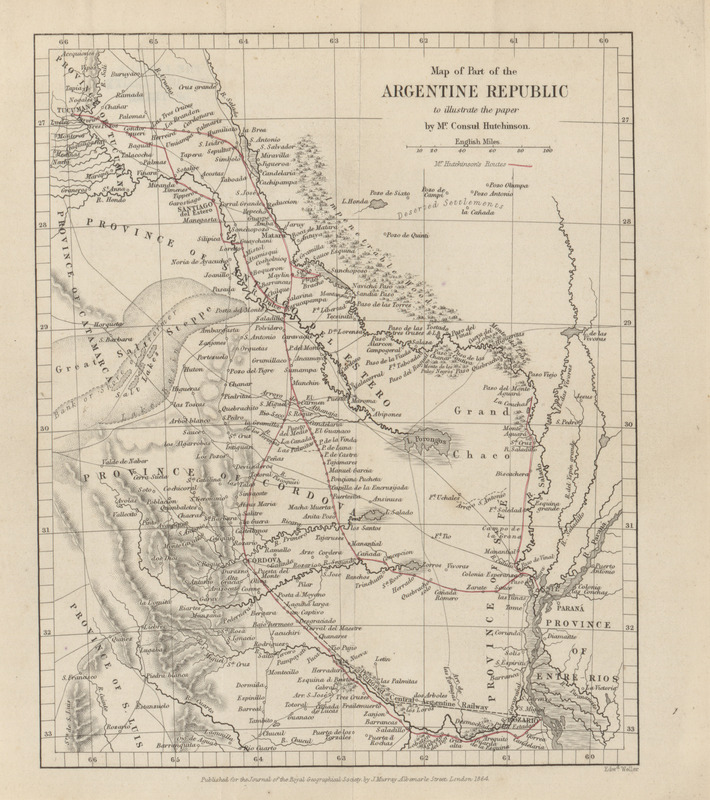 Notes on a journey from Tabriz, through Kurdistan, via Van, Bitlis, Se'ert, and Erbil, to Suleimaniyeh in July and August, 1836. By Lieutenant-Colonel J. Shiel. 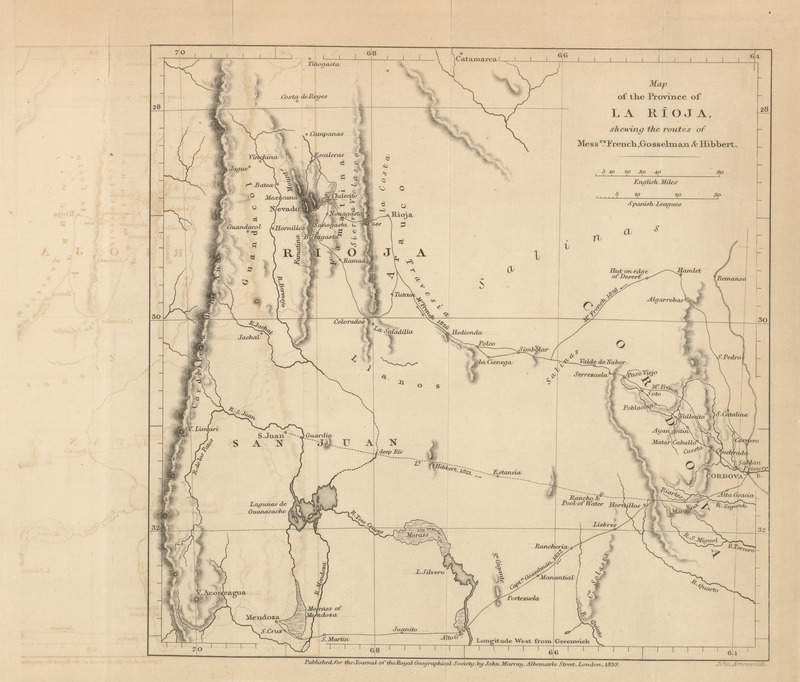 On the province of La Rioja, in South America, to accompany a map. By J.O. French. 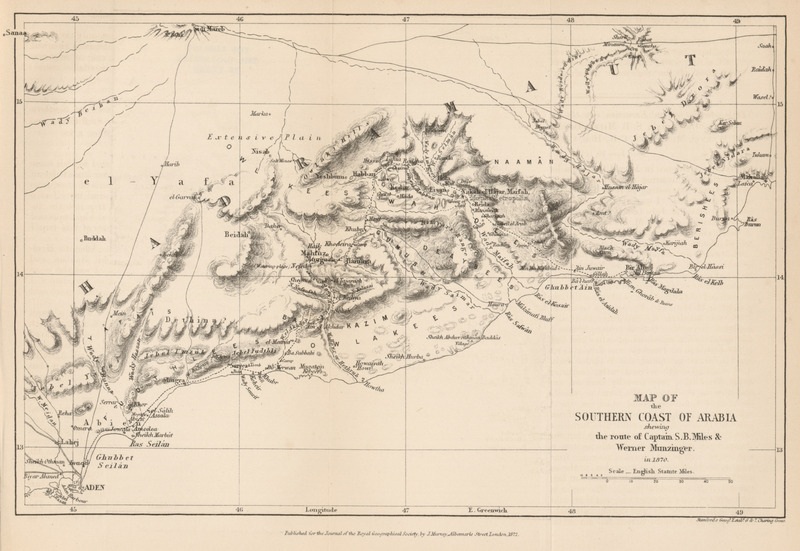 Central Kurdistan to illustrate Mr. Ainsworth's visit to the Chaldeans, 1840 (6.8MB) An account of a visit to the Chaldeans, inhabiting Central Kurdistan; and of an ascent of the peak of Rowandiz (Tur Sheikhiwa) in the summer of 1840. By William Ainsworth, Esq. 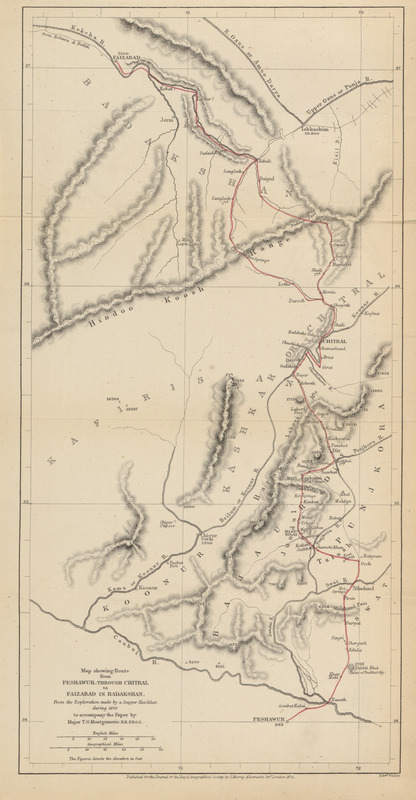 Routes in Kirman, Jebal, and Khorasan, in the years 1831 and 1832. By Richard Gibbons, a sergeant of the British Detachment serving in Persia. 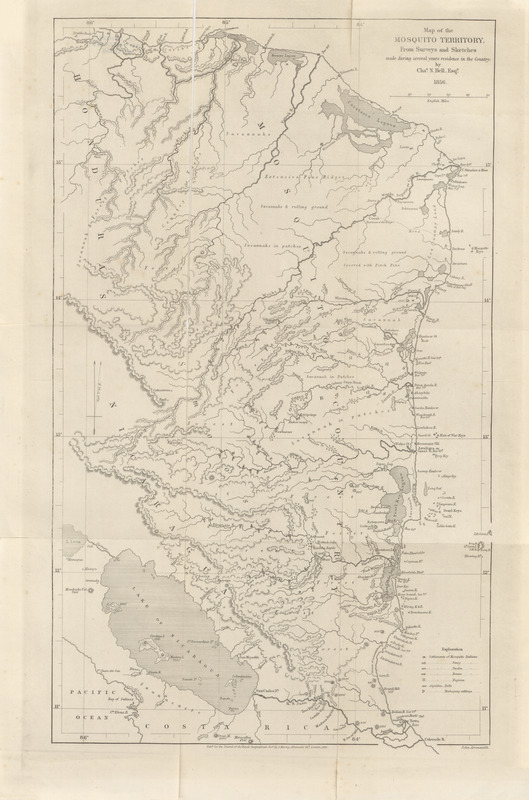 On Benin and the Upper Course of the River Quorra, or Niger. By Captain Becroft. Communicated by Robert Jamieson, Esq., of Liverpool. 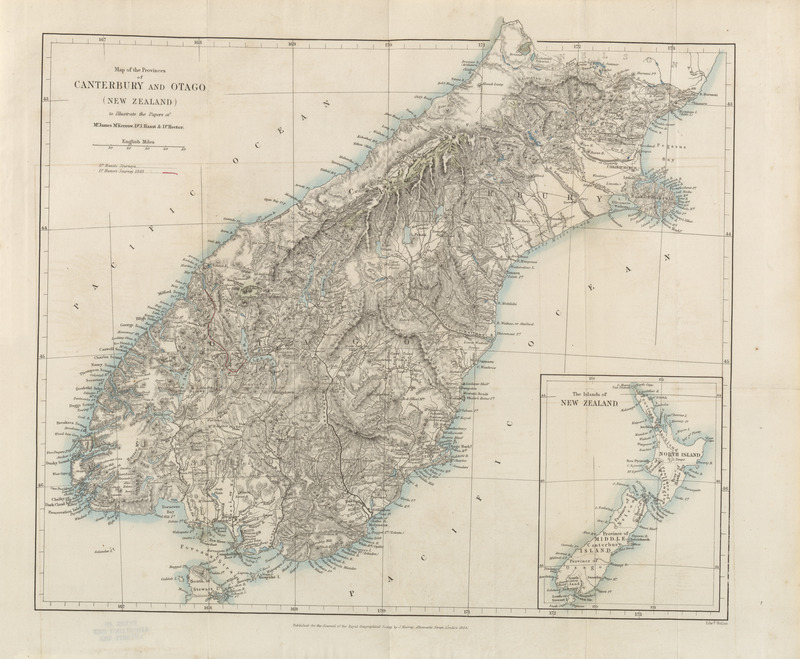 An account of the Chatham Islands. Communicated by Dr. Ernest Dieffenbach, M.D., Naturalist to the New Zealand company, a printed with its concurrence. 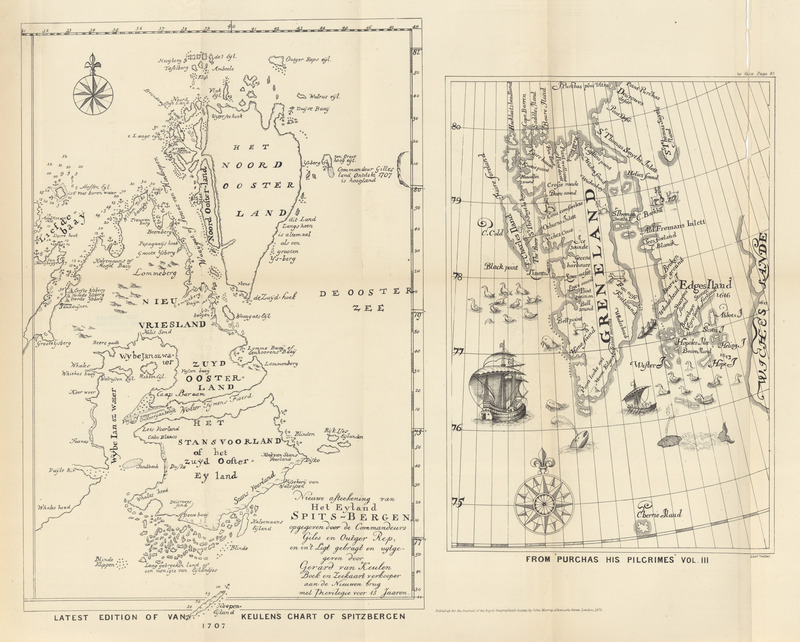 The voyages of Martin Frobisher. By A.B. Becher, Commander, R.N., of the Hydrographical Office, Admirality. 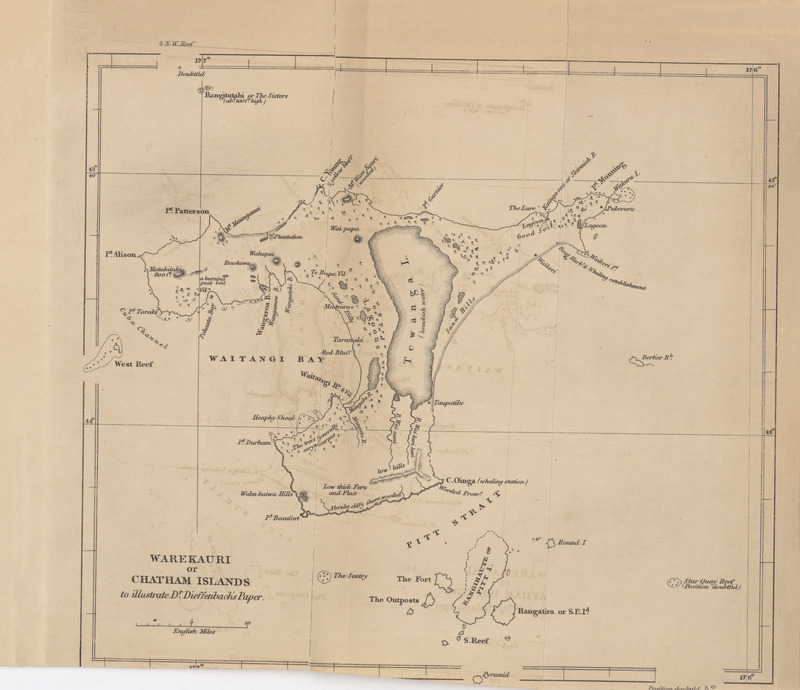 Appendix to Captain Becher's Paper.-Northumberland Inlet; an extract from the journal of a Whaling Voyage, by Mr. Wareham, Master of the Lord Gambier, of Hull. 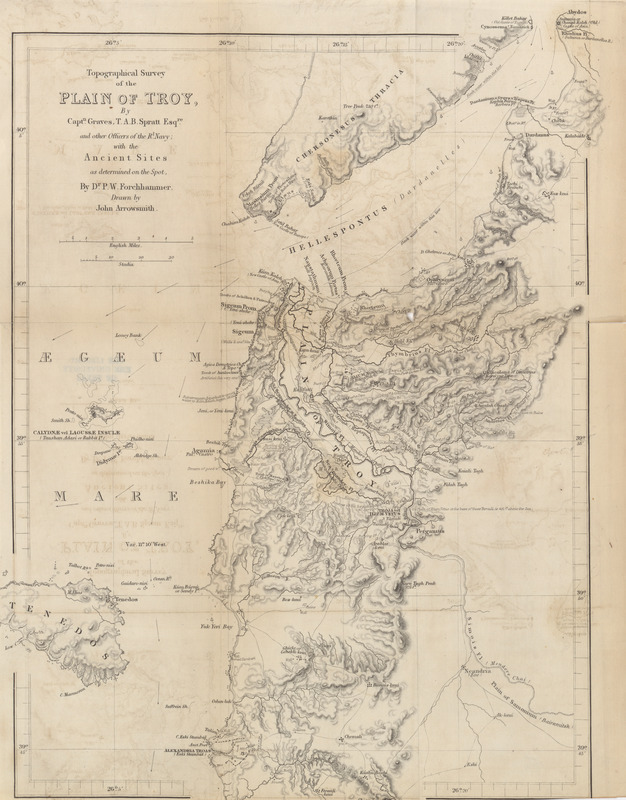 Observations on the topography of Troy. By Dr. P.W. Forchhammer. 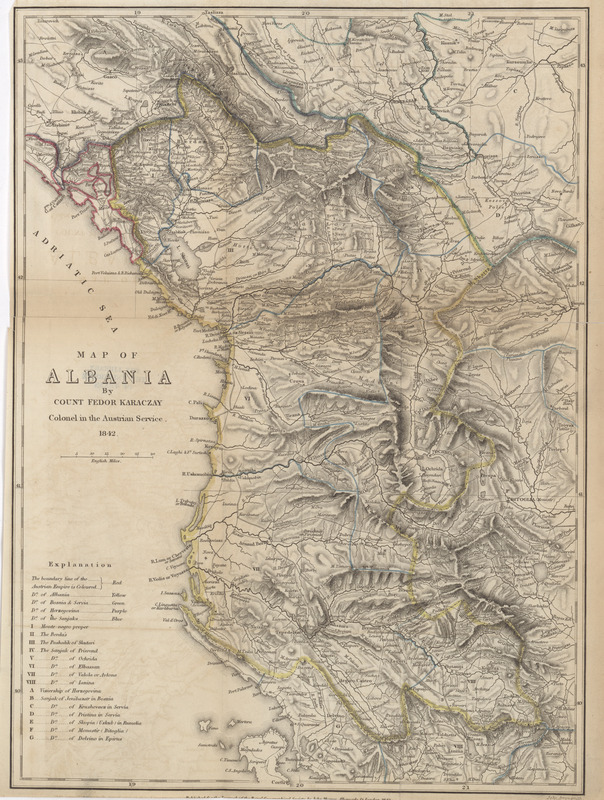 Geographical account of Albania, extracted from a manuscript of Count Karaczay. Remarks on Mr. Hoskyn's paper. By Colonel WM. Martin Leake, F.R.S. 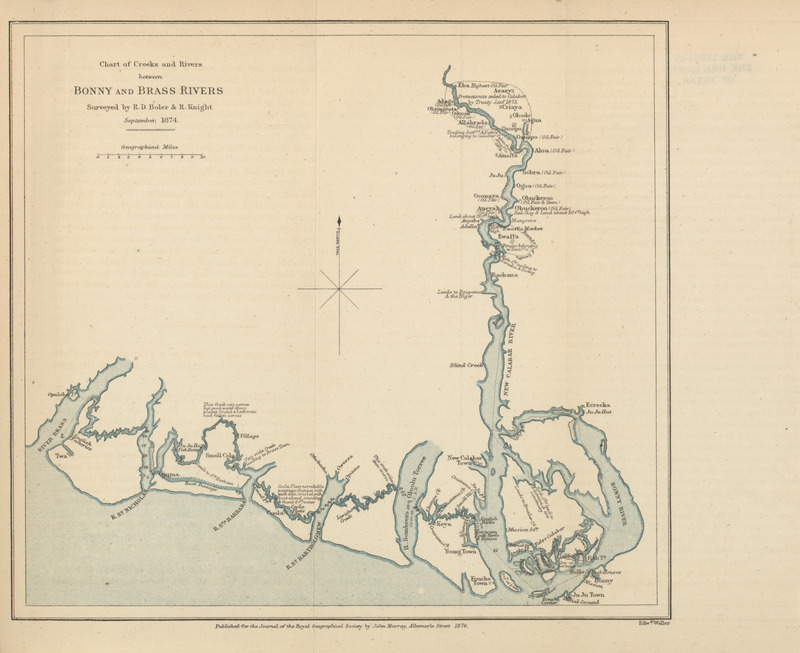 Expedition to the lower parts of the Barima and Guiana Rivers, in British Guiana. By the Chevalier R.H. Schomburgk. Communicated by the Colonial Office. 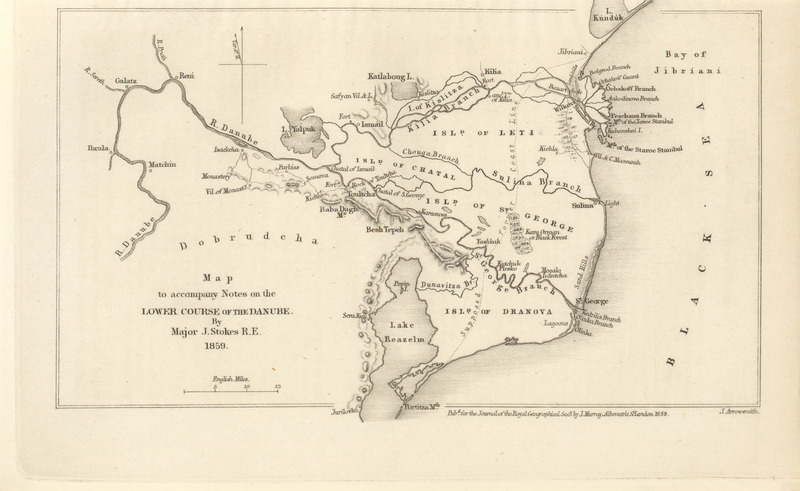 Visit to the sources of the Takutu, in British Guiana, in the year 1842. By Robert Schomburgk, K.R.E. Baron C.A. 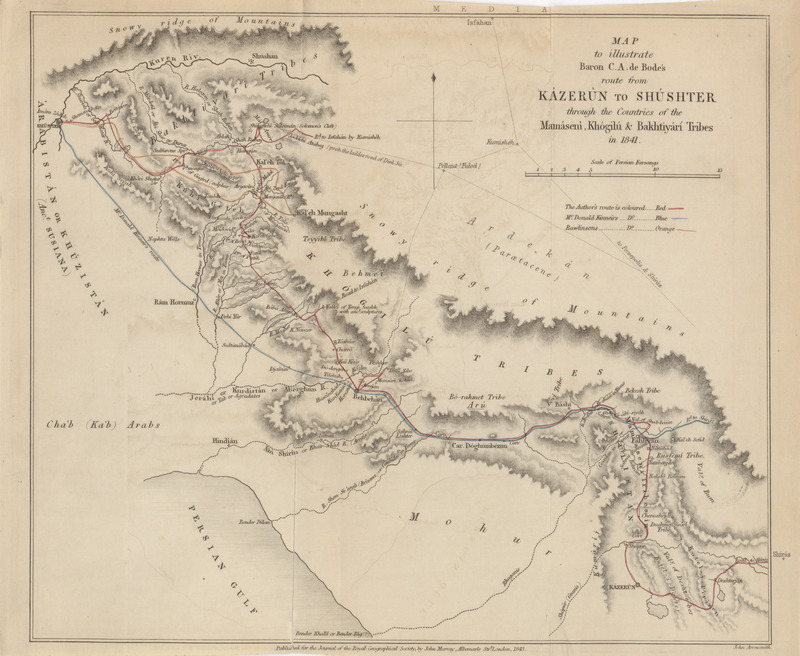 de Bode's route from Kazerun to Shushter through the countries Mamaseni, Khogilu and Bakhtiyari tribes, Clement Augustus de Bode 1841 (2.7MB) Extracts from a journal kept while traveling, in January, 1842, through the country of the Mamaseni and Khogilu (Bakhtiyari), situated between Kazerun and Behbehan. By Baron Clement Augustus de Bode. 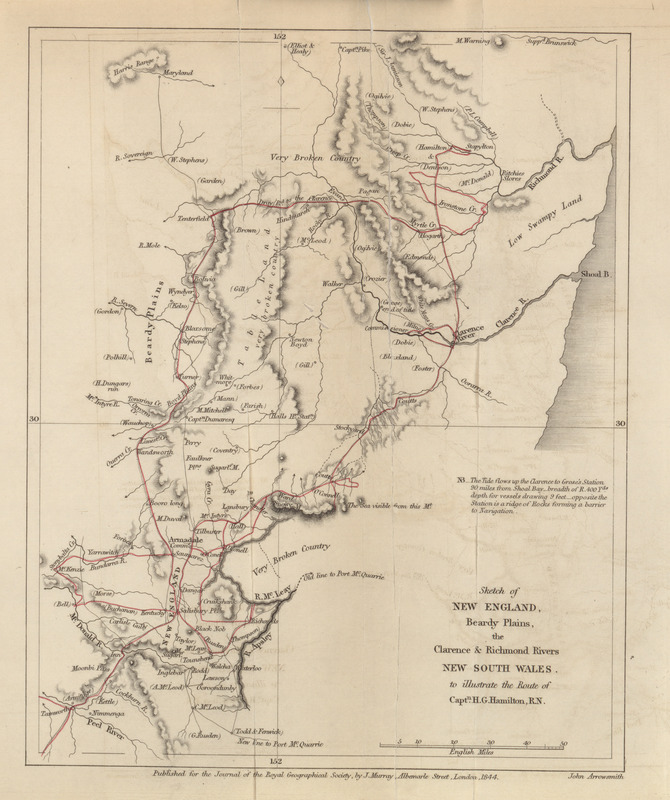 The country between Liverpool plains and Moreton Bay, in New South Wales. Extracts from two letters from Commander H.G. Hamilton, R.N., to W.R. Hamilton, Esq. 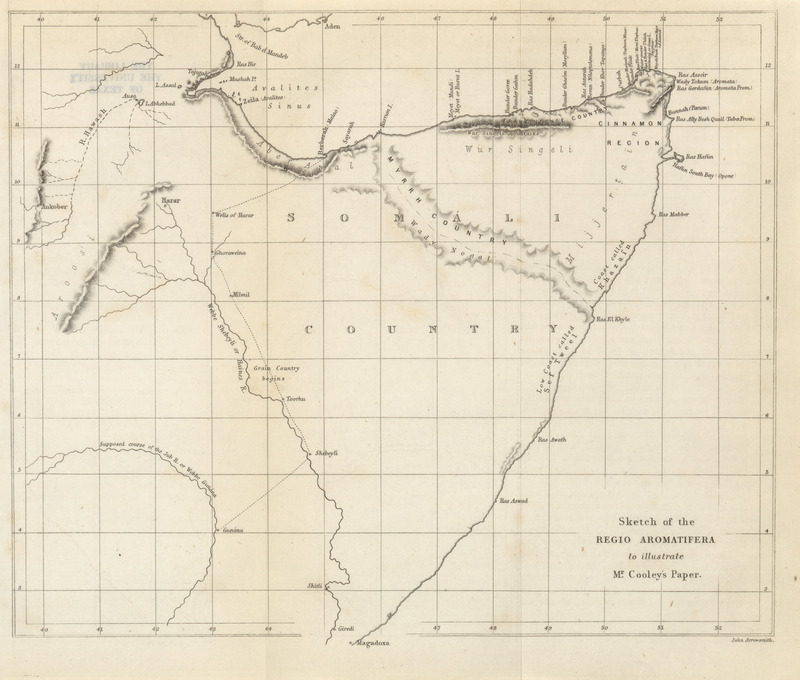 Countries South of Abyssinia by Dr. Beke, 1843 (1.1MB) On the countries South of Abyssinia. By Dr. Charles T. Beke. 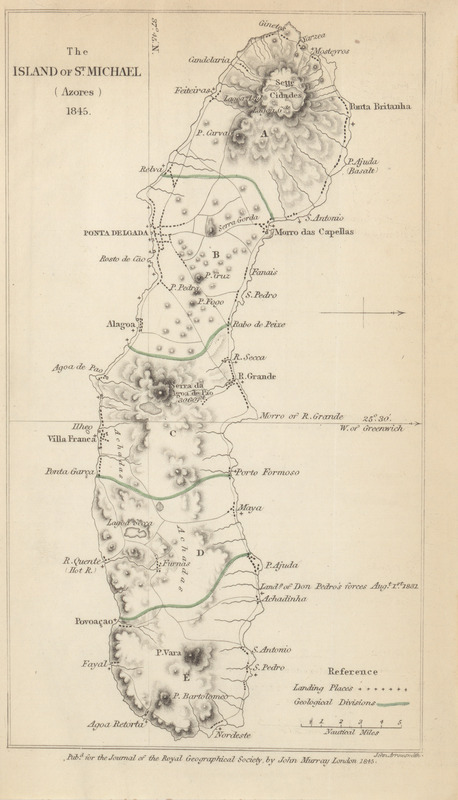 A description of the Island of St. Michael (Azores). By Mr. Consul Carew Hunt. 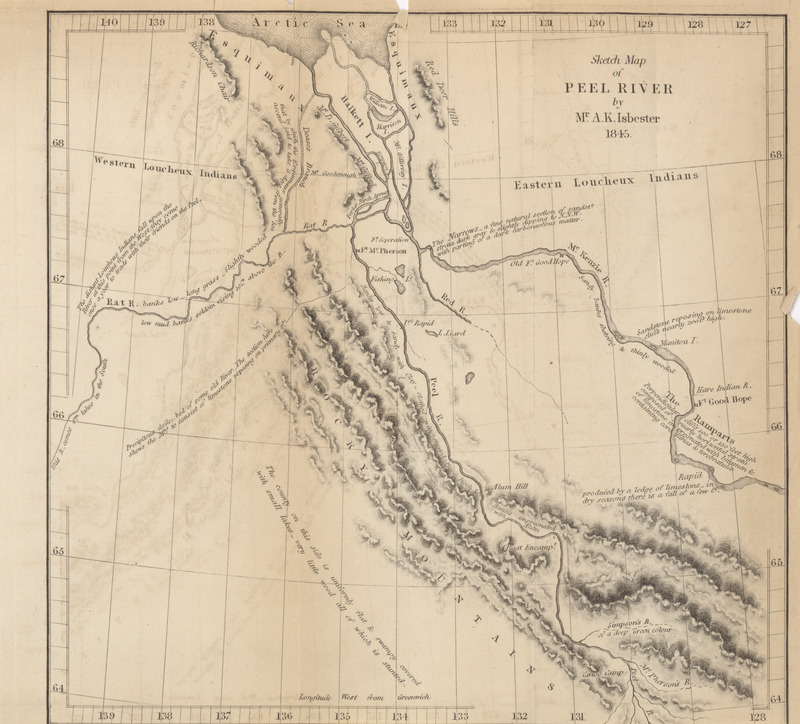 Some account of Peel River, North America. By Mr. A.K. Isbister, late H.H.B.C. 's Service. 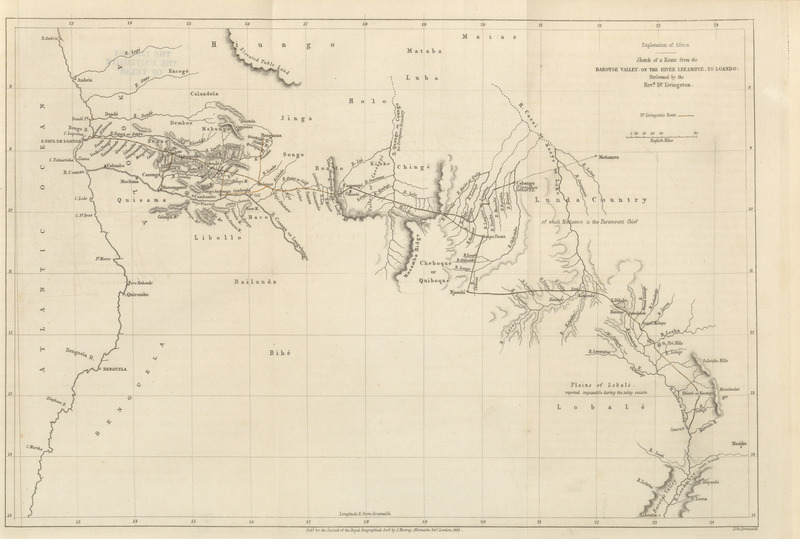 Addressed to the Secretary of the Royal Geographical Society. 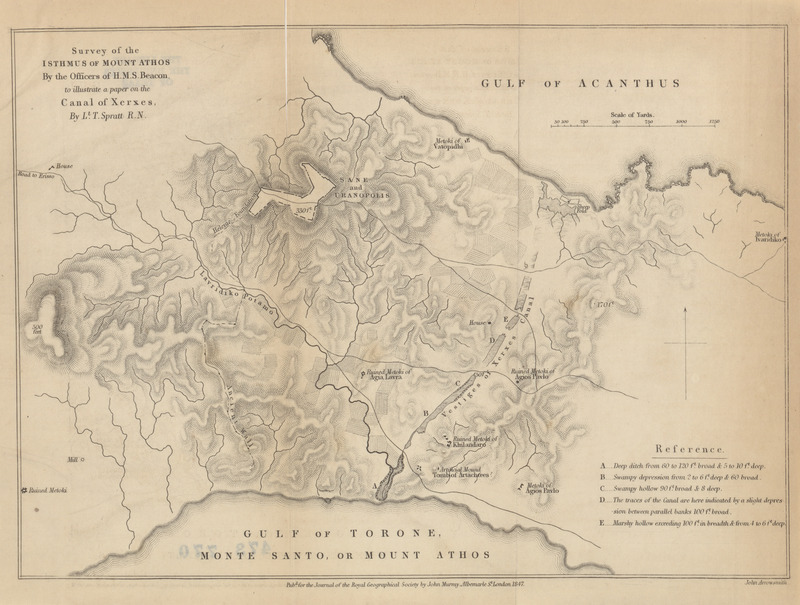 Remarks on the Lakes of Benzerta, in the Regency of Tunis, made in May, 1845, by Lieutenant Spratt, H.M.S. Beacon, F.G.S. Communicated by Commander Graves, F.R.G.S. 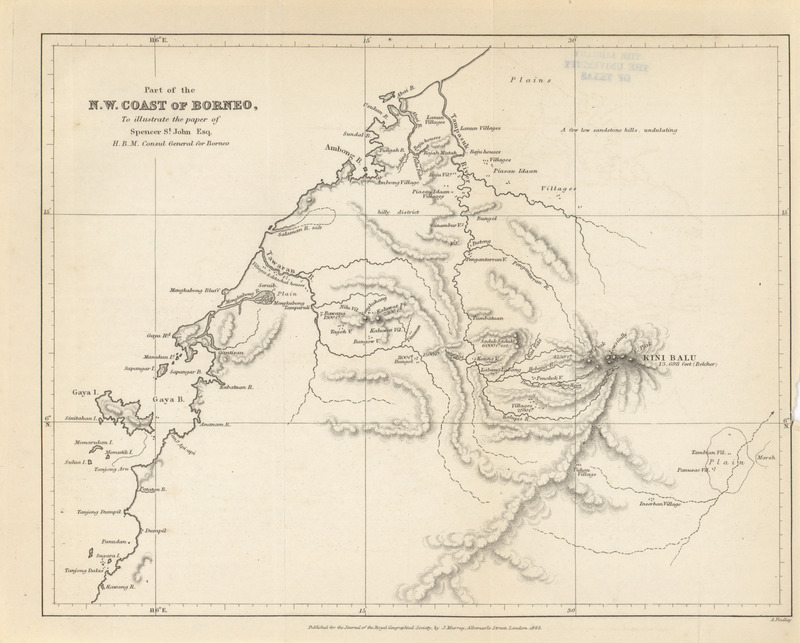 Dr. Leichardt's route from Moreton Bay to Port Essington, Ludwig Leichardt, 1846 (2.3MB) Account of Dr. Ludwig Leichardt's expedition from Moreton Bay to Port Essington, Australia. 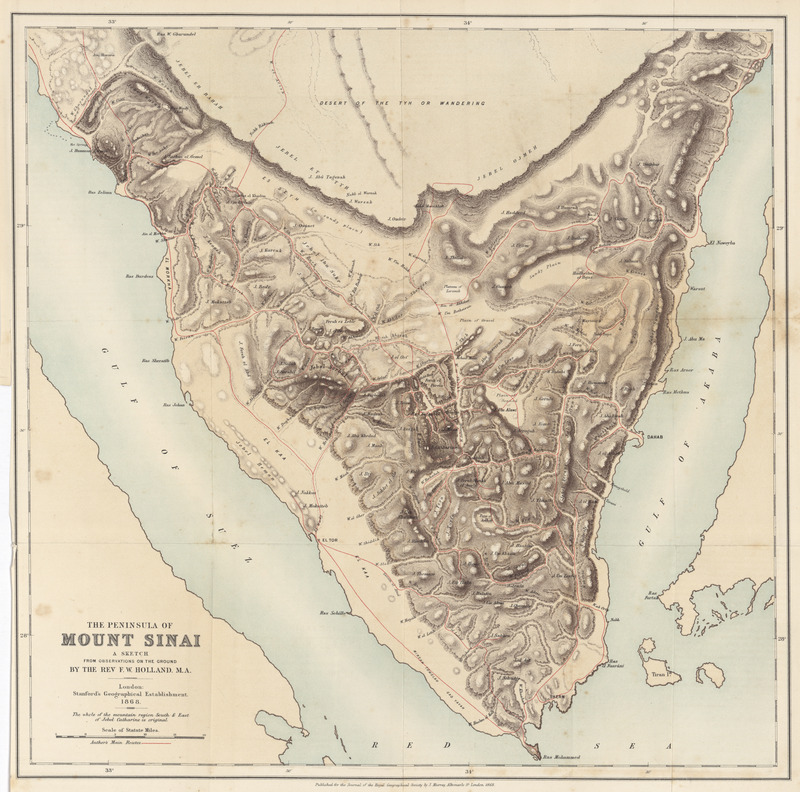 A short memoir of the proceedings of the honourable company's surveying Brig "Palinurus," during her late examination of the coast between Ras Morbat and Ras Seger, and between Ras Fartak and the ruins of Mesinah. By J.P. Saunders, Commander. 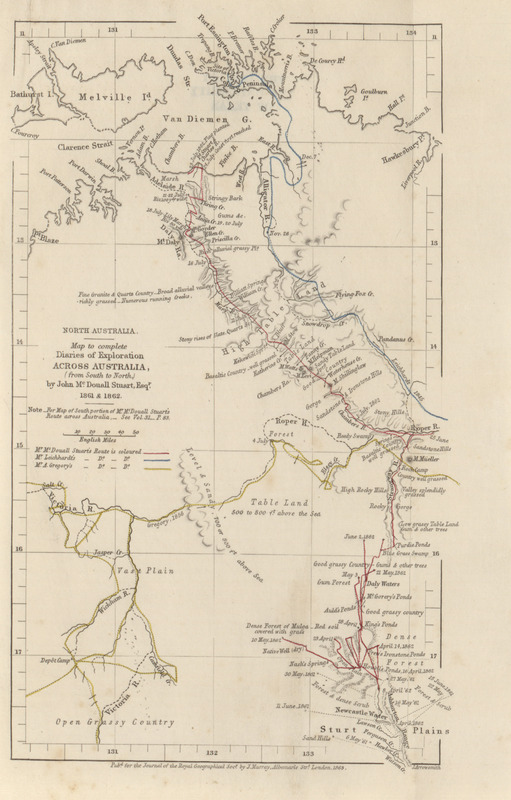 A condensed account of an exploration in the interior of Australia, by Captain Charles Sturt, in 1844 and 1845. 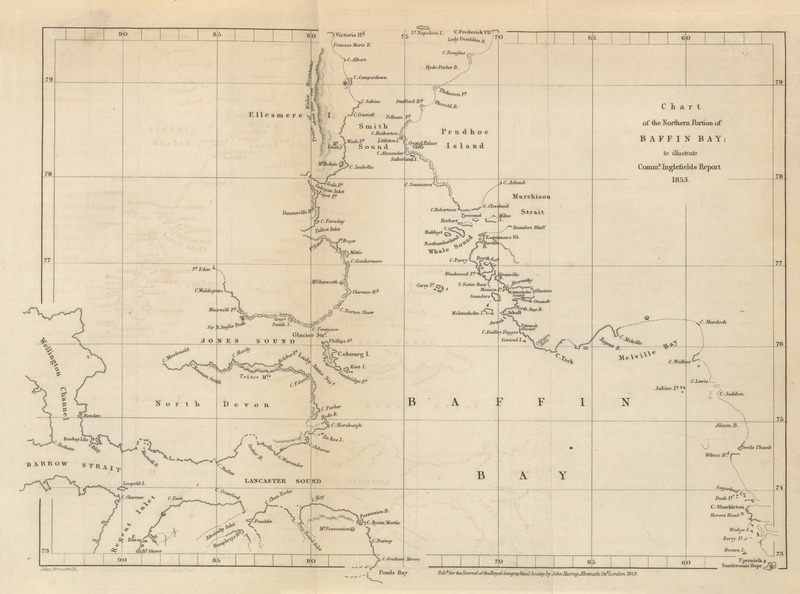 Extracted from his journal, and from papers transmitted to the Right Honorable the Secretary of State for the colonies, and by him communicated to the Royal Geographical Society. Read 8th and 22nd February, 1847. On the Yang-tsze-kiang. By the Right Honorable Lord Colchester and Captain Collinson, R.N. Read March 22nd, 1847. 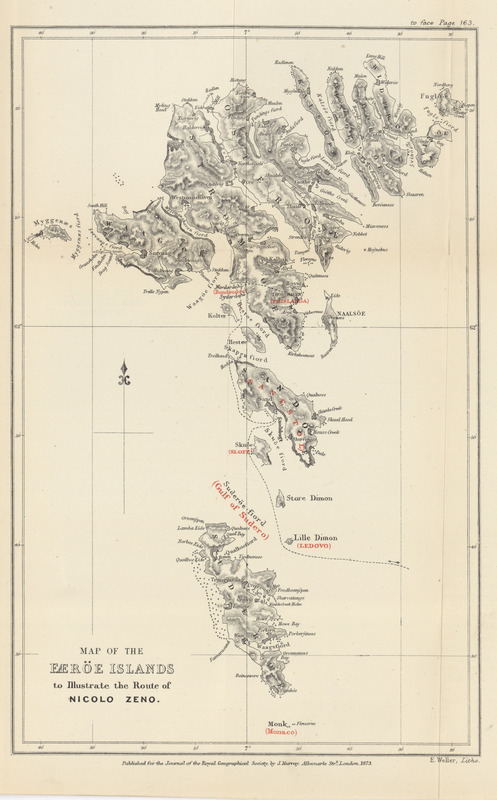 Isthmus of Mount Athos by the officers of H.M.S. 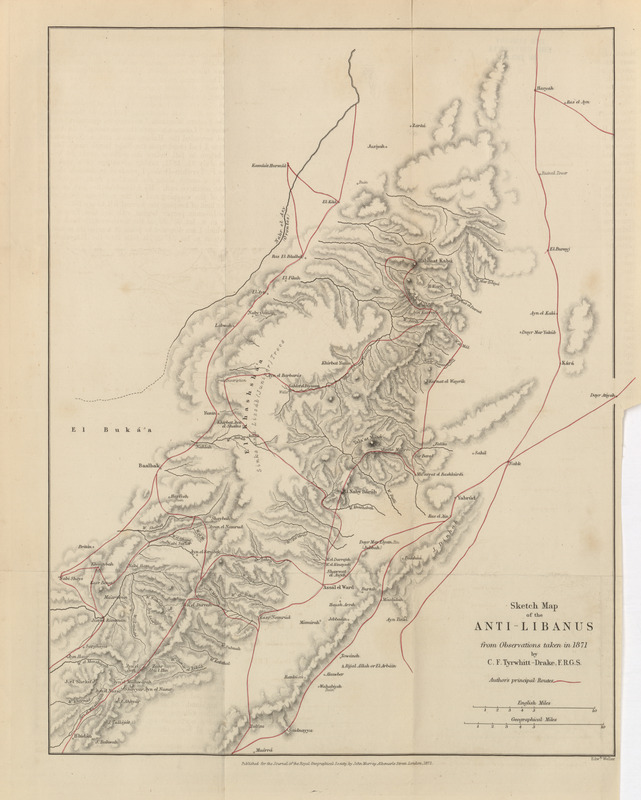 Beacon, to illustrate a paper on the Canal of Xerxes, Lt. Spratt R.N., 1847 (2.9MB) Remarks on the Isthmus of Mount Athos. By Lieut. T. Spratt, of H.M.S. "Beacon." Communicated by Commander Graves, F.G.R.S. Read March 9th, 1846. 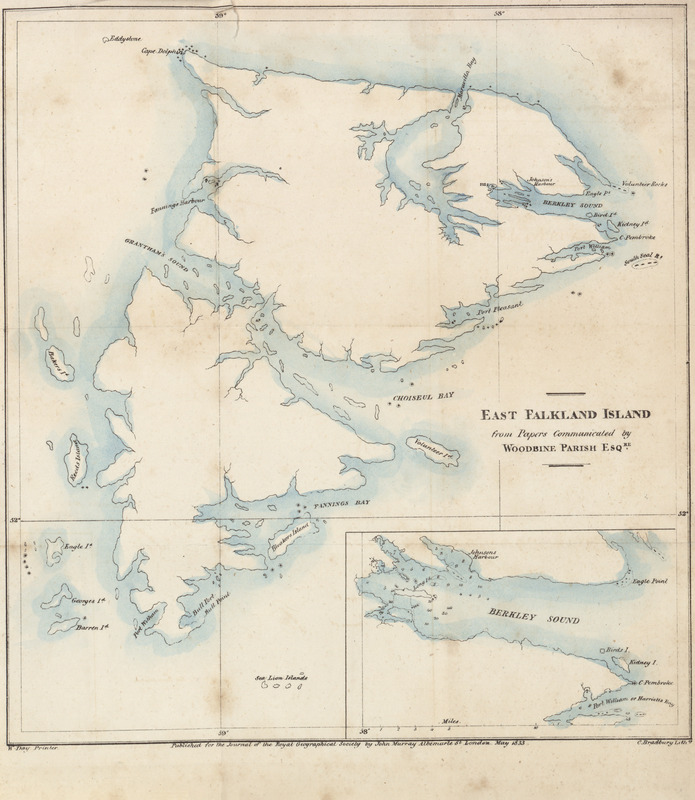 Report by Lieutenant Helpman, R.N., Commander of Colonial Schooner Champion, on an expedition to examine coal discovered on the Irwin River. On the Regio Cinnamomifera of the Ancients. By W. Desborough Cooley. (Communicated by Admiral Beaufort. Read April 23rd, 1849. 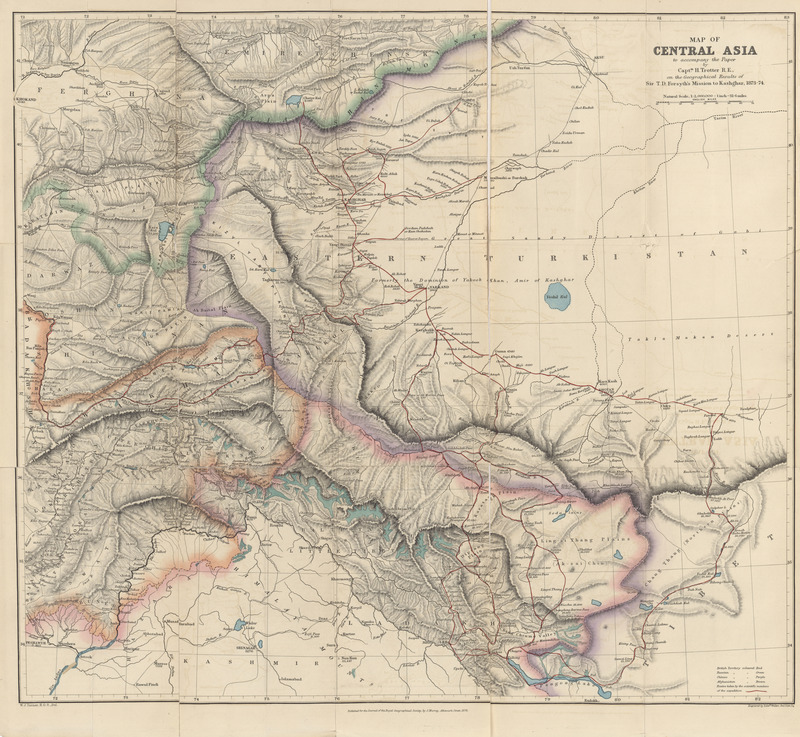 The Climatology of the Caucasus. By Professor Herman Abich. 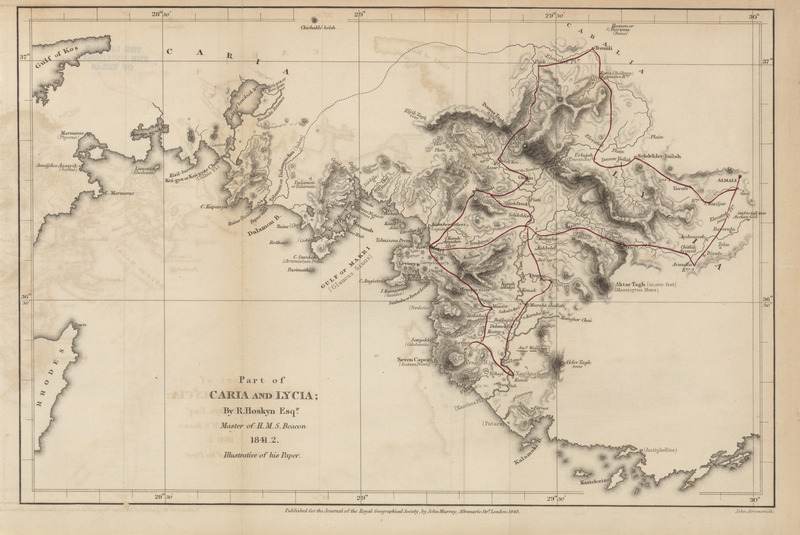 Expedition to the interior of S.W. Africa. By Francis Galton, Esq. F.R.G.S. Report on the return of Isabel from the Arctic regions. By Commander Ed. A. Inglefield, F.R.G.S. 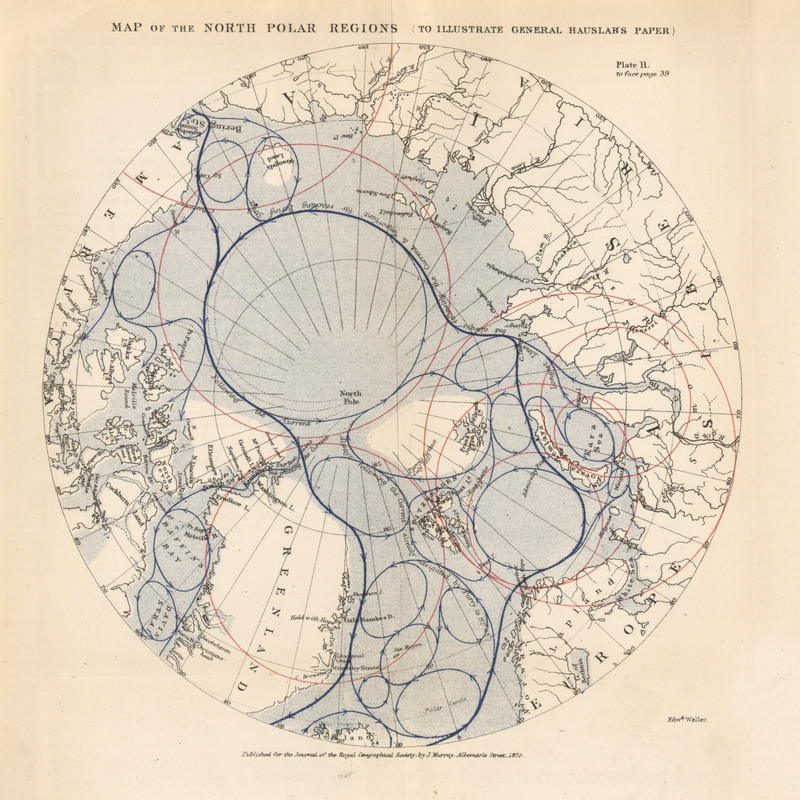 On the large Continental Ice of Greenland, and the origin of icebergs in the Arctic Seas. By Dr. H. Rink, of Copenhagen. 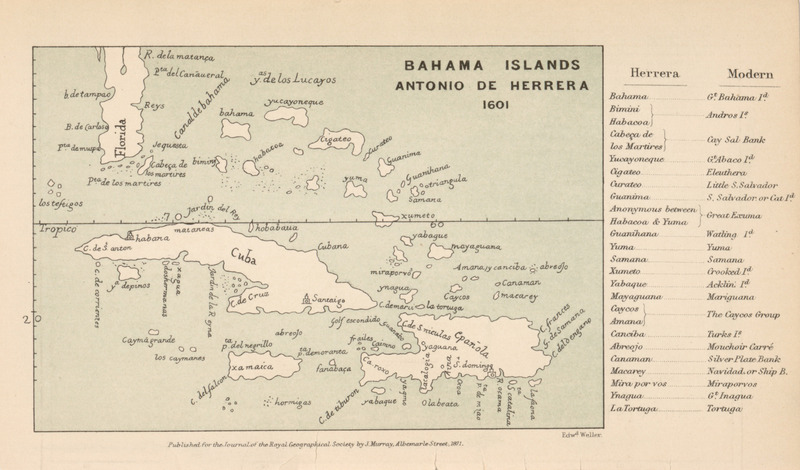 The peninsula and Bay of Samana, in the Dominican Republic. By Sir R. H. Schomburgk, H.B.M. Consul at the Dominican Republic, corresponding F.R.G.S. 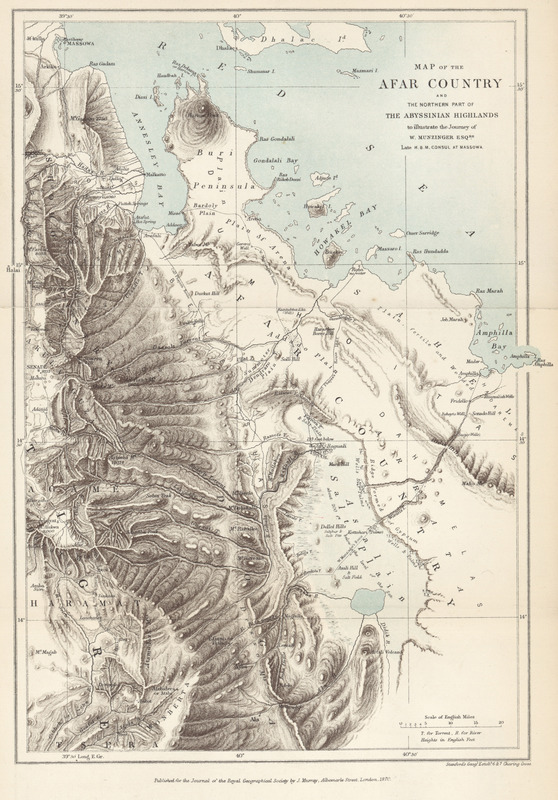 Notes on a journey into the Balkan, or Mount Haemus, in 1847. By Lieutenant-General A. Jochmus. 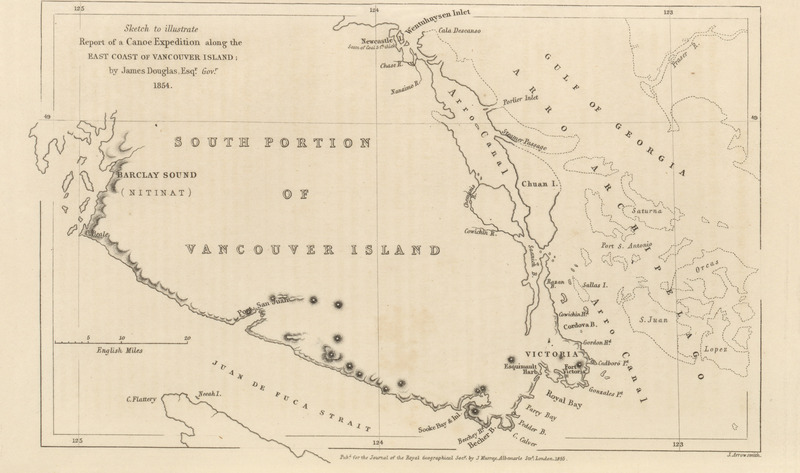 Report of a canoe expedition along the East coast of Vancouver Island. By James Douglas, Esq., Governor. Official report of the proceedings of the exploring party under Commander J.C. Prevost, of H.M.S. 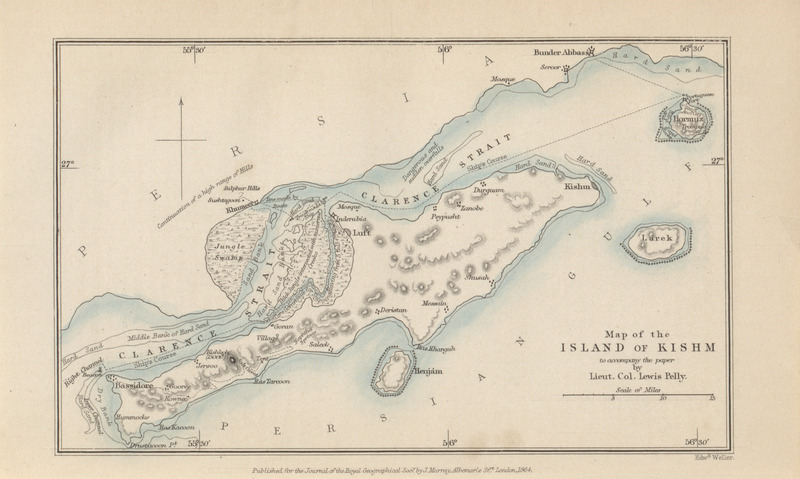 'Virago,' sent to cross the Isthmus of Darien. 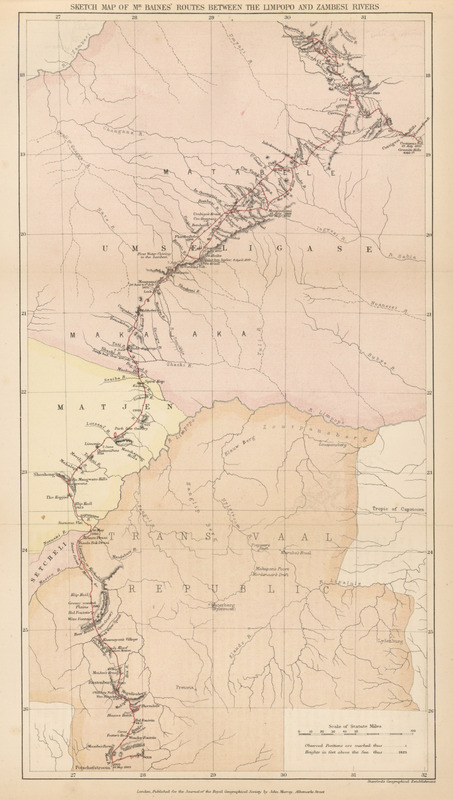 Report of a journey across the Andes, between Cochabamba and Chimore, to the Westward of the Traders' Route, with Remarks on the proposed communication between Bolivia and the Atlantic, via the Amazon. By J.A. Lloyd, Esq., F.R.G.S., H.B.M. Charge d'Affaires in Bolivia. 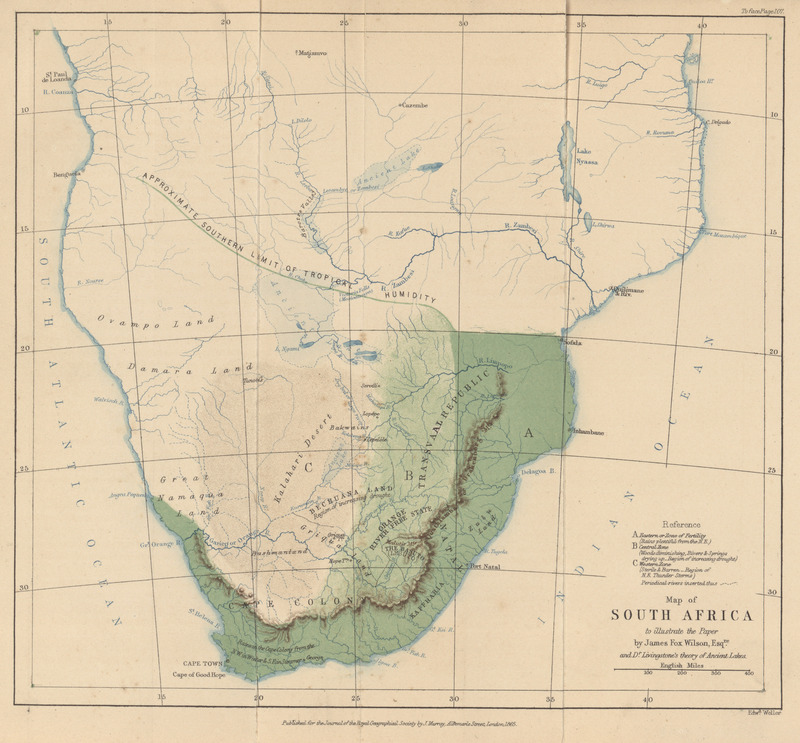 Explorations into the interior of South Africa. By Dr. David Livingston. 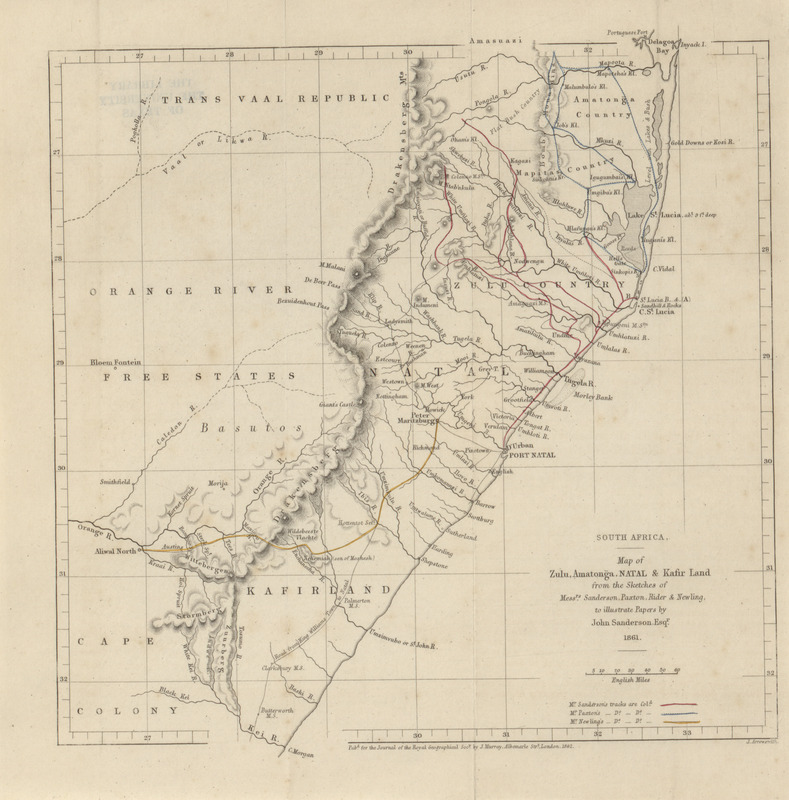 Explorations in South Africa, with route from Walfisch Bay to Lake Ngami, and ascent of the Tioge River. By Charles J. Andersson, Esq. 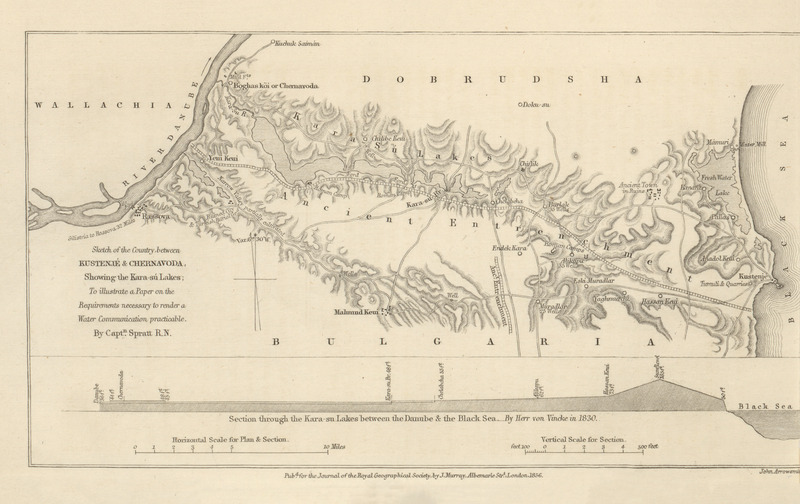 Summary of an exploring trip up the Rivers Kwora and Chadda (or Shadda) in 1854. By W.N. Baikie, M.D., R.N., F.R.G.S. Mission to Central Africa. By Ed. Vogel, Phil. 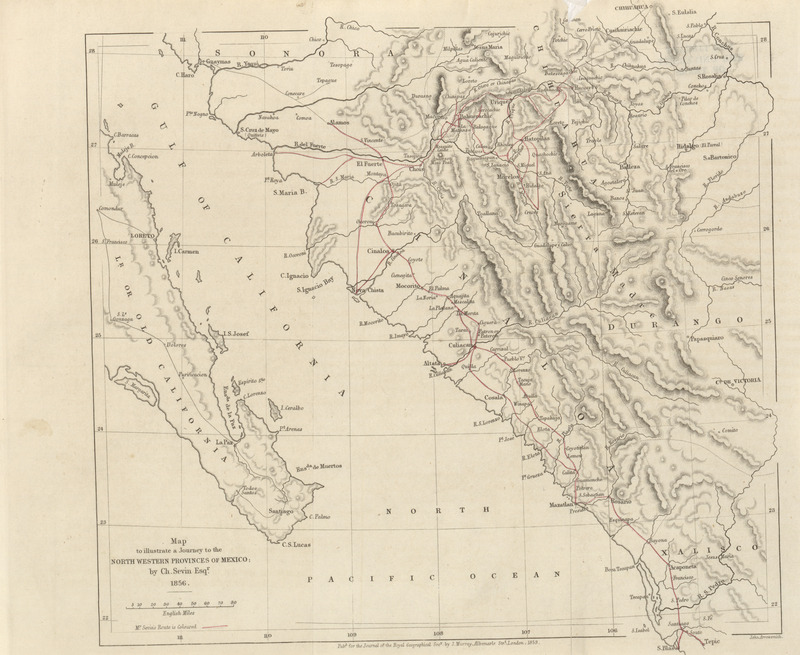 Dr.
Chaldea Susiana, Kennett Loftus, 1856 (4.6MB) Notes of a Journey from Baghdad to Busrah, with descriptions of several Chaldean remains. By W. Kennet Loftus. 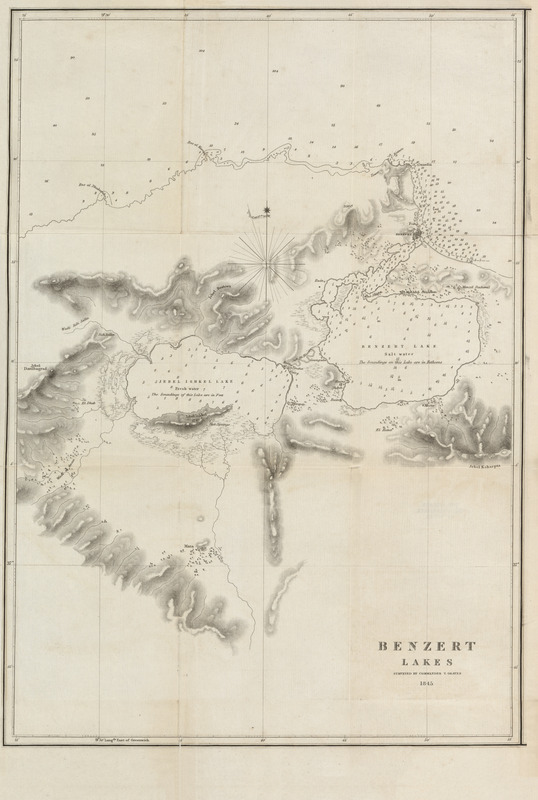 Route between Kustenje and the Danube by the Kara-su and Yeni-Keui Valleys, with observations on the navigation of the Kara-su Lakes and their origin; also on the requirements necessary to render the water and land communication practicable; being the result of an examination made during a recent journey with Lieutenant-Colonel Hon. A. Gordon and Lietuenant-Colonel J. Desaint, de l'Etat Major. 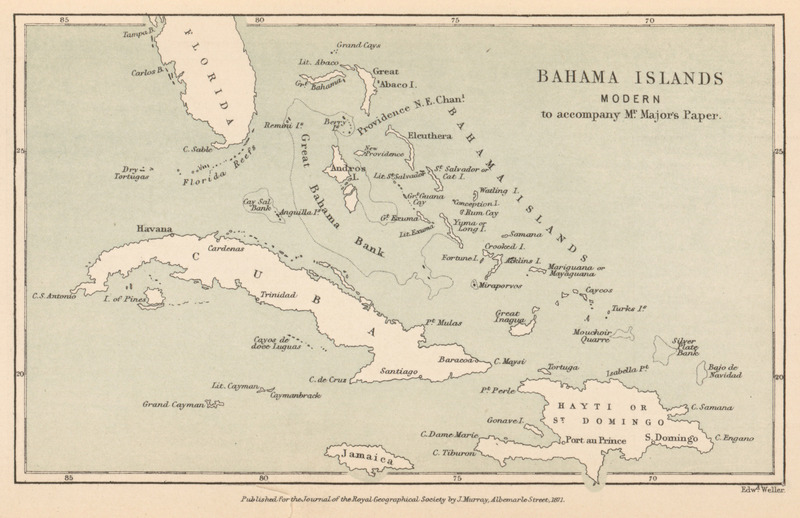 By Captain Spratt, R.N., C.B., of H.M.S., 'Spitfire.' July, 1854. 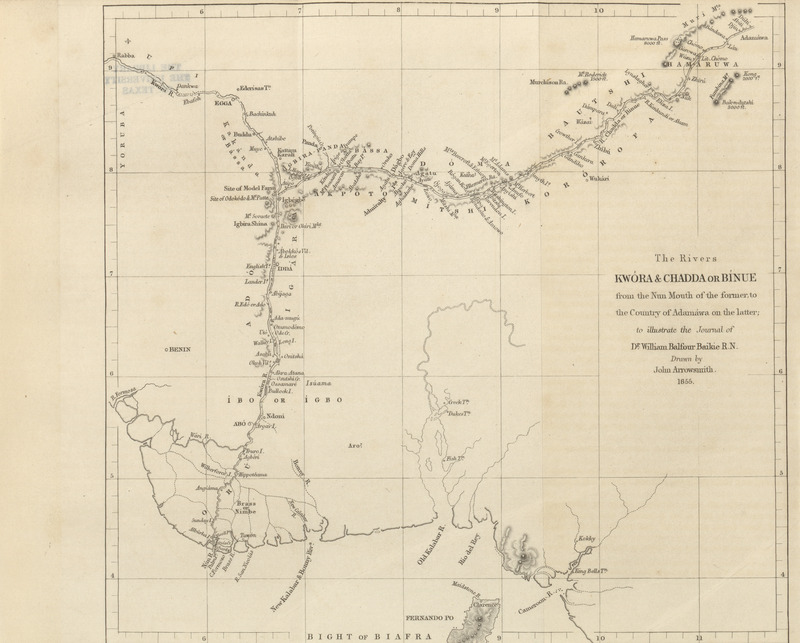 Journal of the North Australian exploring expedition. Under the command of Augustus C. Gregory, Esq. (Gold Medallist R.G.S. ); with report by Mr. Elsey on the health of the party. 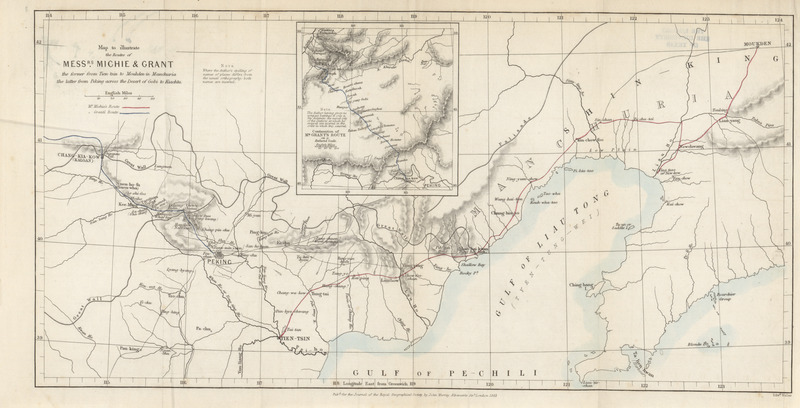 Journey from Colesberg to Steinkopf in 1854-1855. 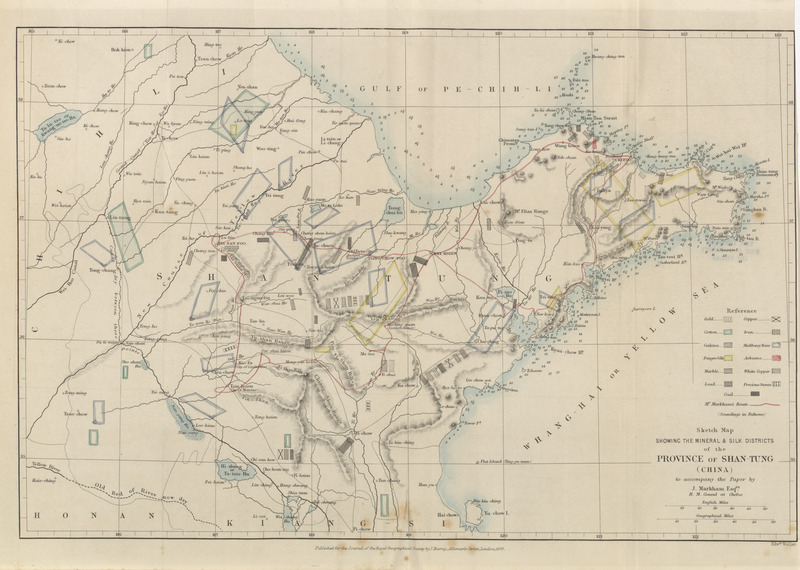 By Robert Moffat, Esq., F.R.G.S., Government Surveyor at the Cape. 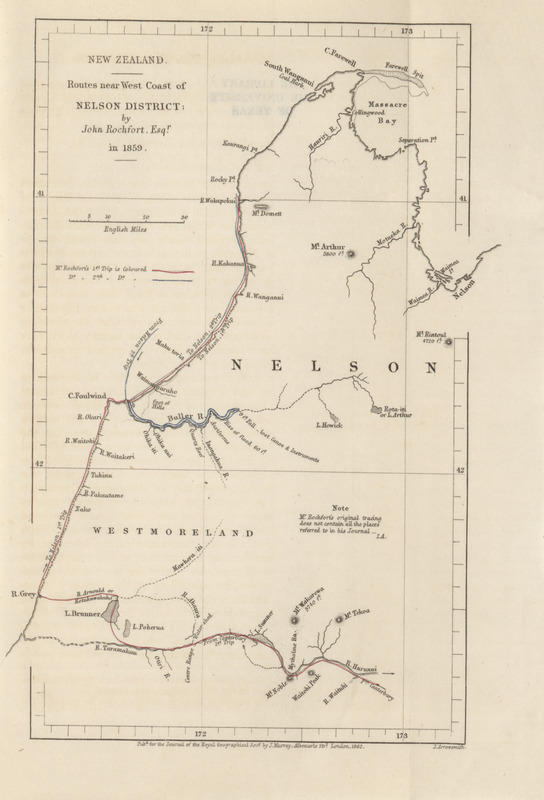 Extracts from a journal kept during a Reconnaissance survey of the Southern Districts of the province of Otago, New Zealand. 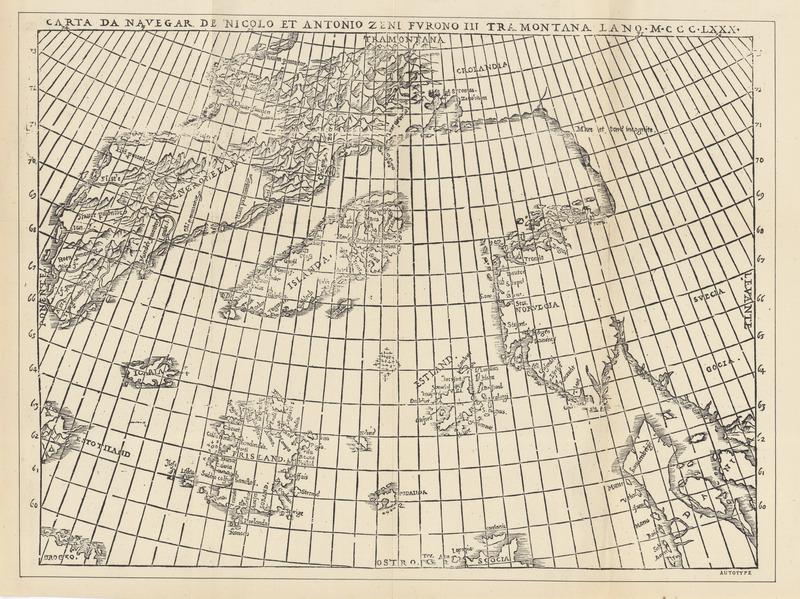 By J. Turnbull Thomson, F.R.G.S., Chief Surveyor. 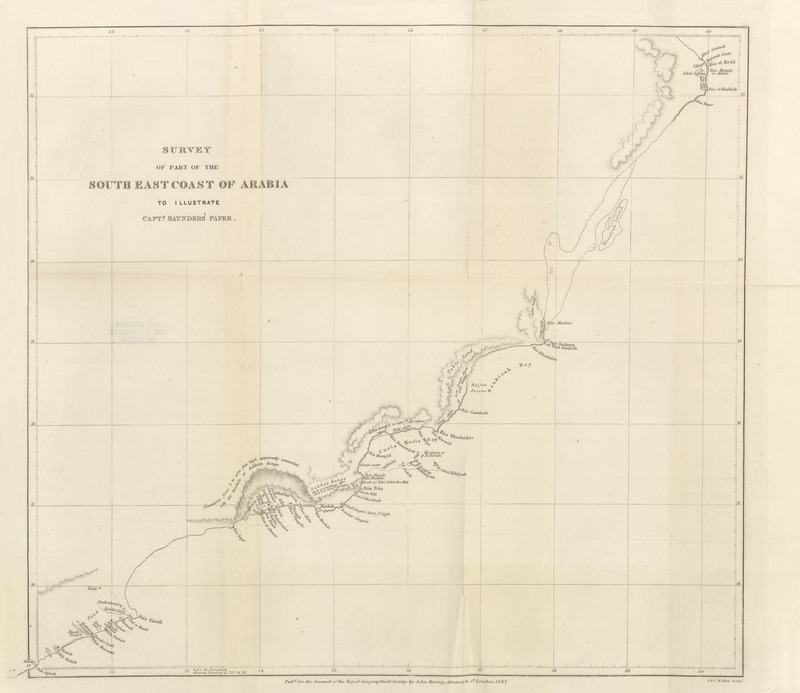 Notes on the River Amur and the adjacent districts. By MM. Peschurof, Permikin, Shenurin, Vasilief, Radde, Usoltzof, and Pargachefski. Journey to Mexico. By Ch. Sevin, Esq., F.R.G.S. 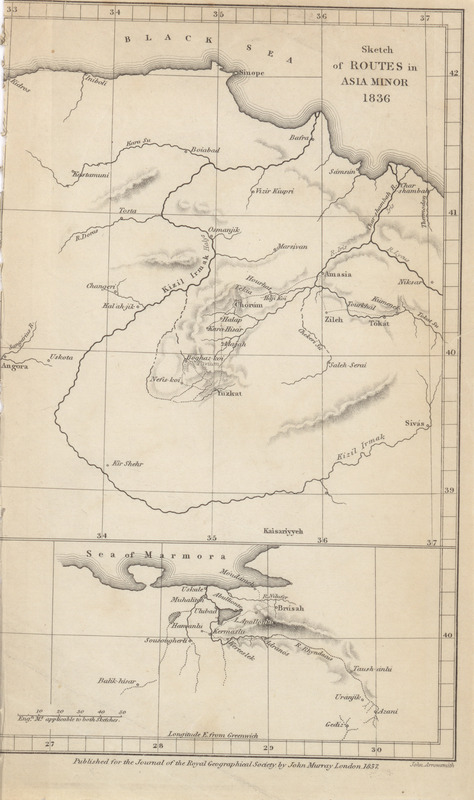 Some account of the Lake of Yojoa or Taulebe, in Honduras, Central America. By E.G. Squier, Esq., of the United States of America. 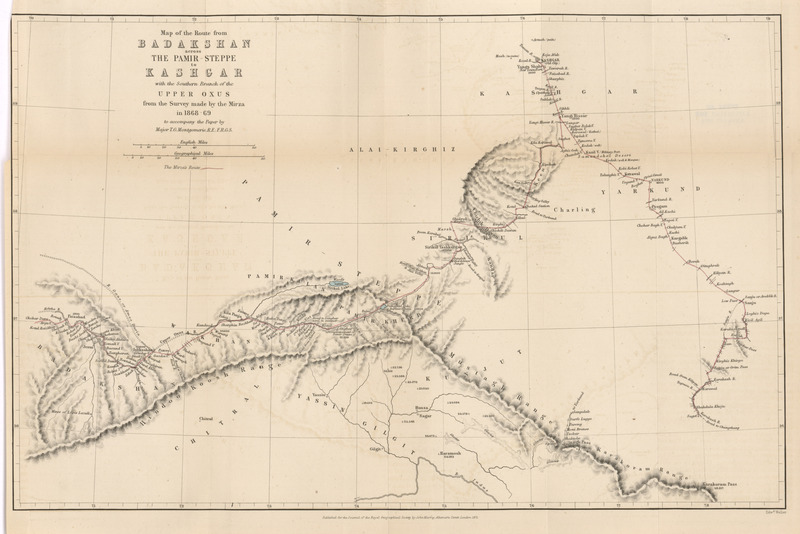 Explorations in Ecuador in the years 1856 and 1857. By george James Pritchett, Esq. 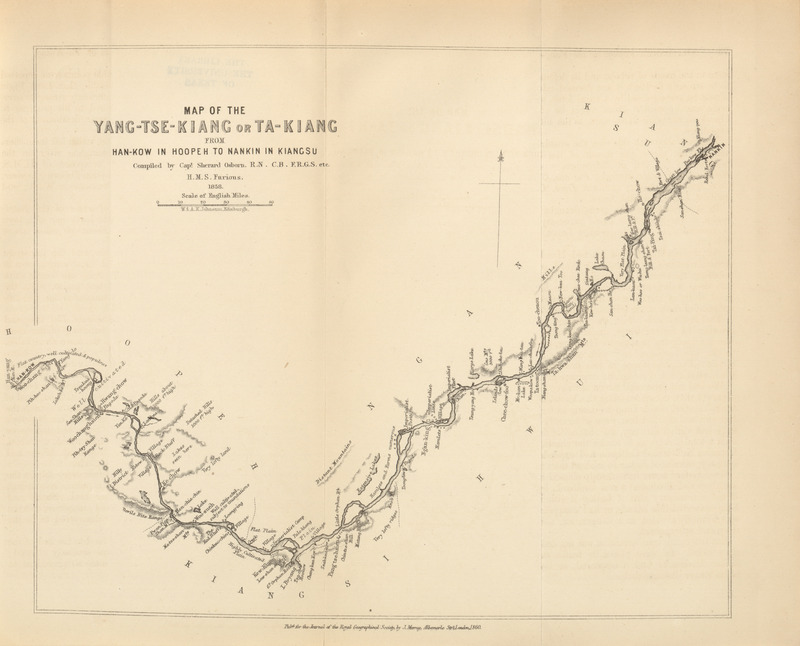 Notes of a voyage up the Yang-tze or Ta-Kiang, from Wusung to Han-kow. By Laurence Oliphant, Esq., F.G.R.S. 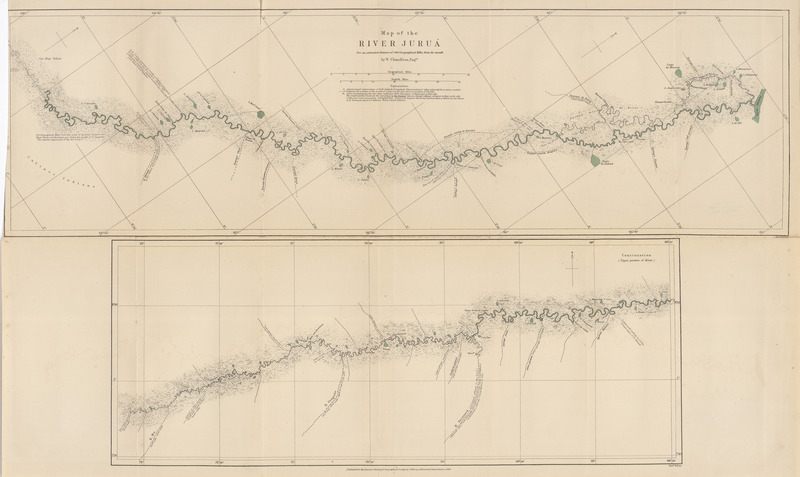 ; with chart of the River by Captain Sherard Osborn, R.N., F.R.G.S. 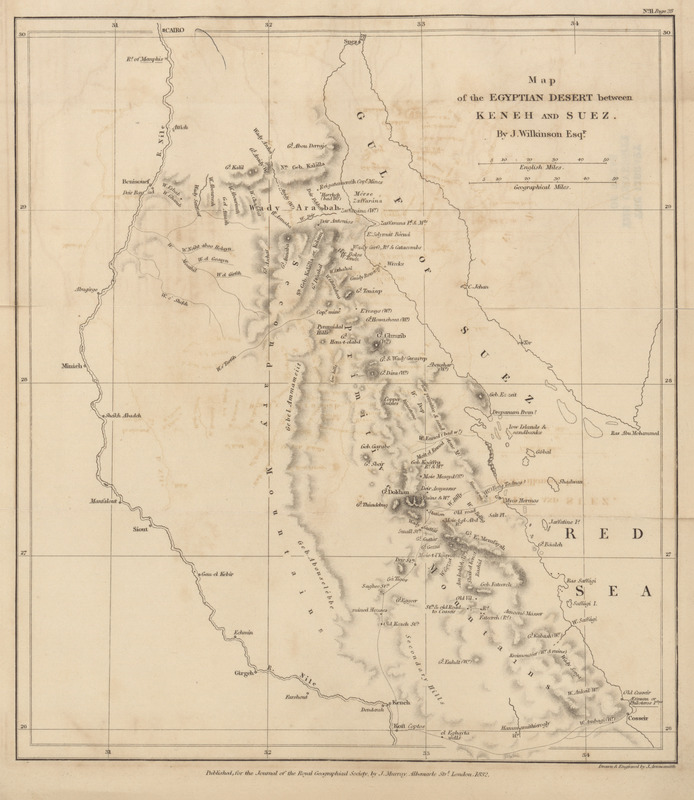 A general historical description of the State of Human Society in Northern Central Africa. By H. Barth, Phil. 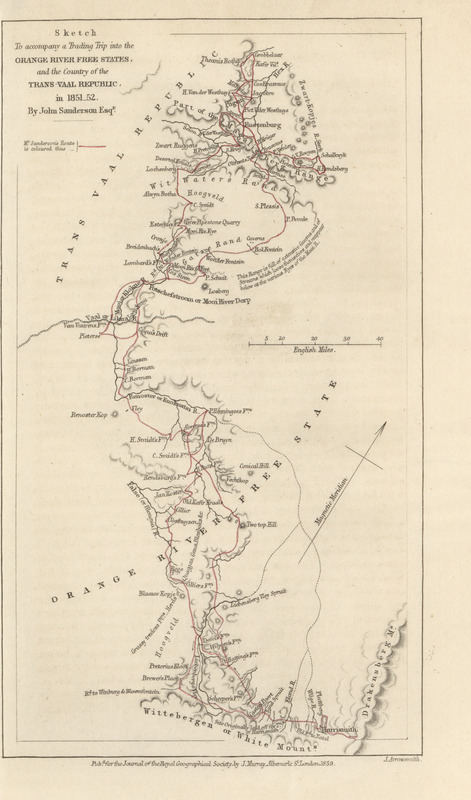 D.
Journeys of Silva Porto with the Arabs from Benguela to Ibo and Mozambique through Africa. November 26th, 1852, to January 22nd, 1853, and from June 9th, 1853, to August, 1854. By James Macqueen, Esq. F.R.G.S. Notes on the Lower Danube. By Major J. Stokes, R.E. 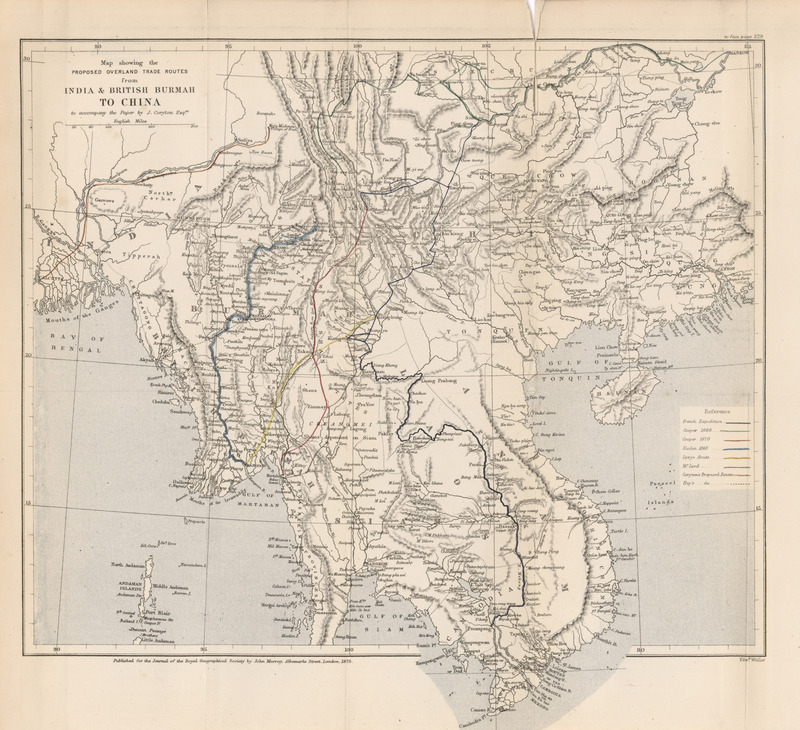 Travels in Siam and Cambodia. By D.O. King, Esq. 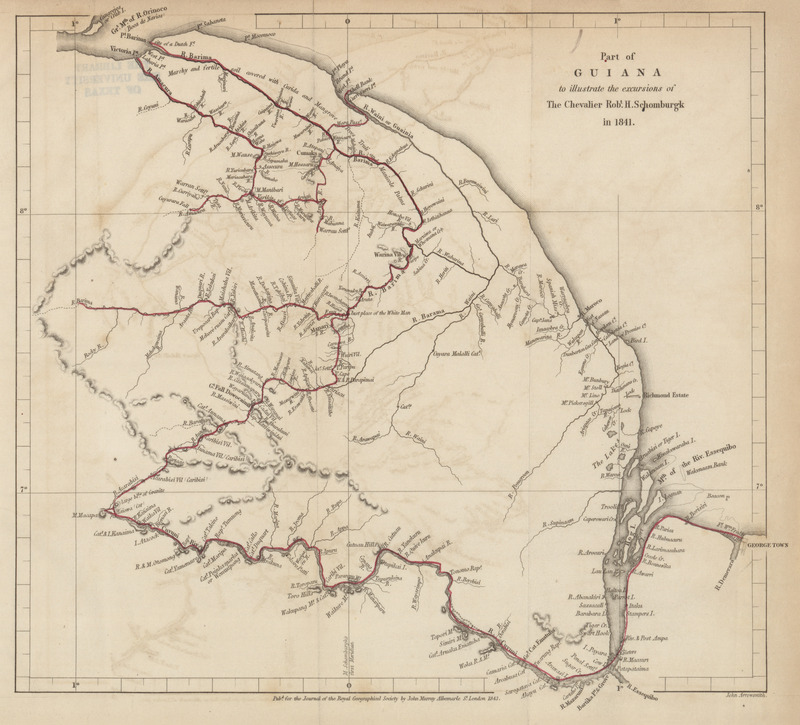 Journey in the Yoruba and Nupe countries in 1858. By Daniel J. May, Esq., F.R.G.S., Second Master R.N. 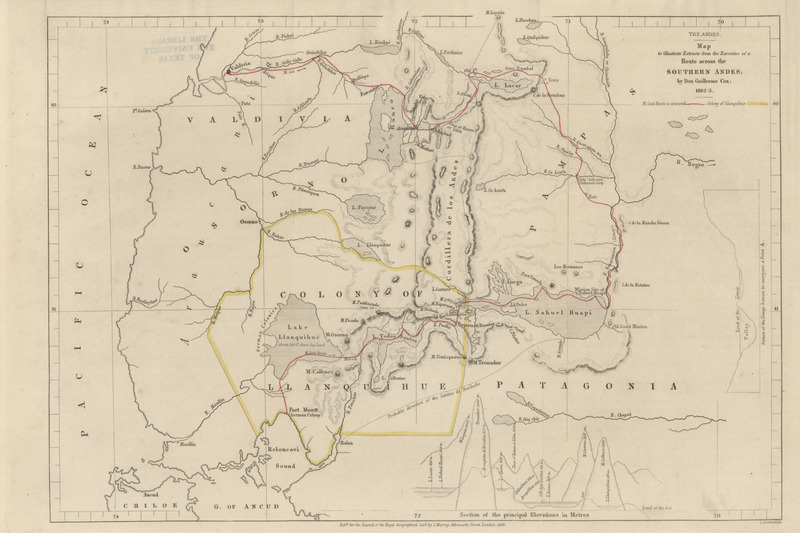 Memoranda of a trading trip into the Orange River (sovereignty) free state, and the country of the Transvaal Boers, 1851-1852. By John Sanderson, Esq. Account of Ghadamis. By C.H. Dickson, Esq., F.R.G.S., H.B.M. Consul at Sukum Kale. 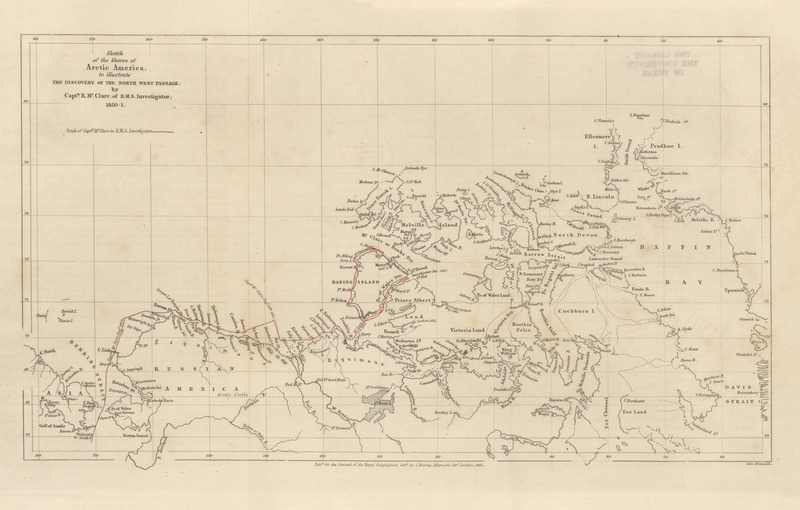 Progress of the British North American exploring expedition. Under the command of Captain John Palliser, F.R.G.S. 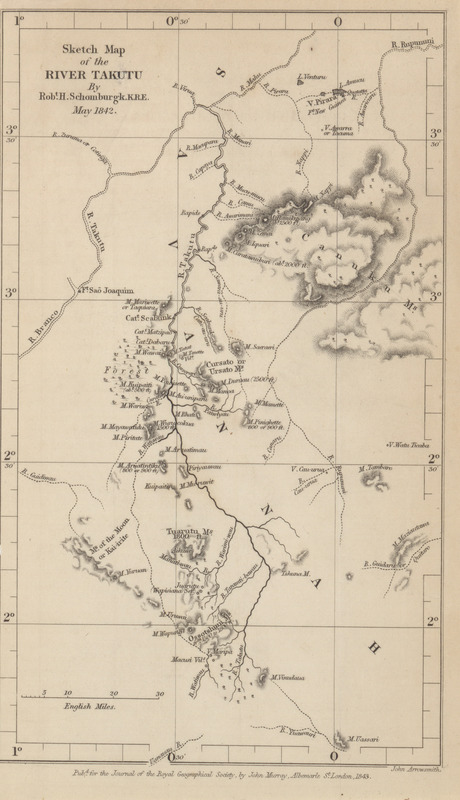 Journey from Inhambane to Zoutpansberg, by Joaquim de Santa Rita Montanha. By James McQueen, Esq., F.R.G.S. Notes on Cambodia, the Lao Country. By M. Henri Mouhot (translated from the original French, by Dr. Thomas Hodgkin, M.D.). 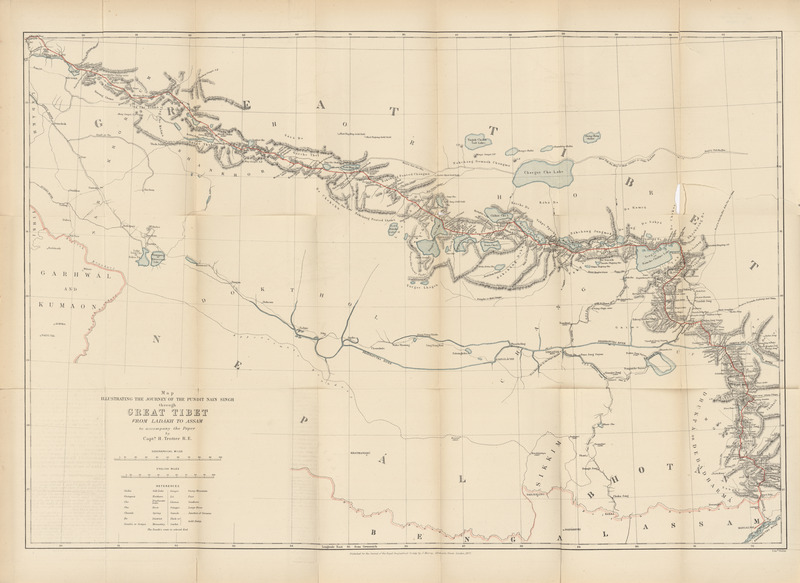 Journal of a tour to Karen-ni, for the purpose of opening a trading road to the Shan Traders from Mobyay and the adjacent Shan States, through that territory, direct to Tungu. By Edward O'Riley, Esq., F.G.S. 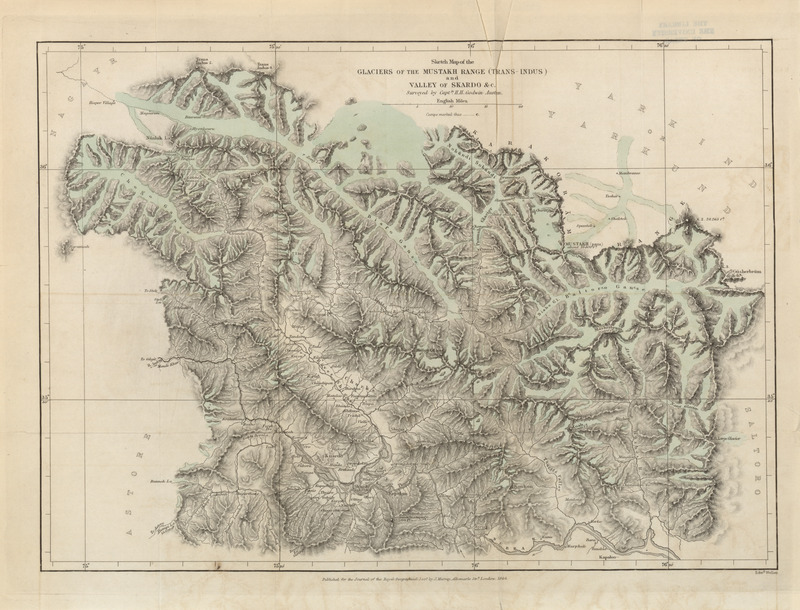 Observations on the North-West coast of Borneo. By Spencer St. John, Esq., F.R.G.S., H.B.M. Consul General for Borneo. 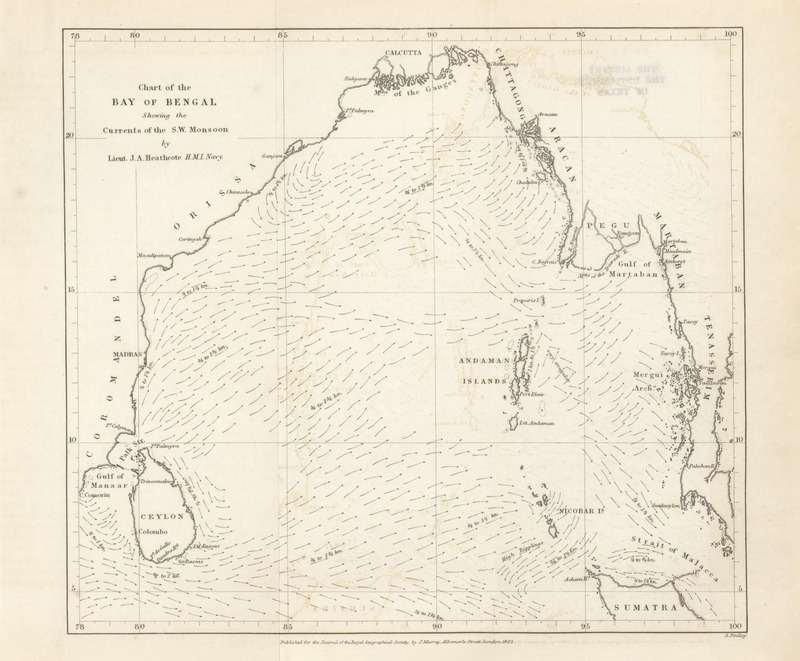 Surface currents of the Bay of Bengal during the South-West Monsoon. By J.A. Heathcote, Esq., L.N. 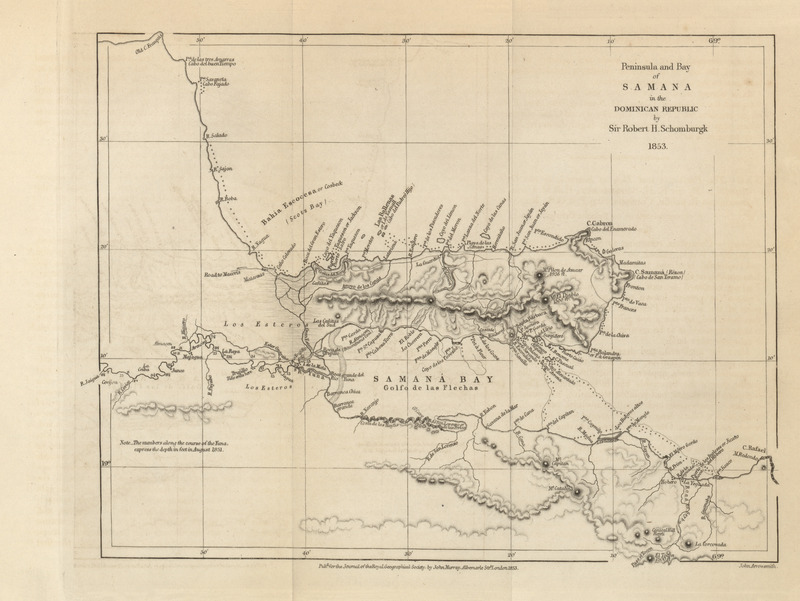 Remarks on the Mosquito Territory, its climate, people, productions, with a map. By Charles N. Bell. 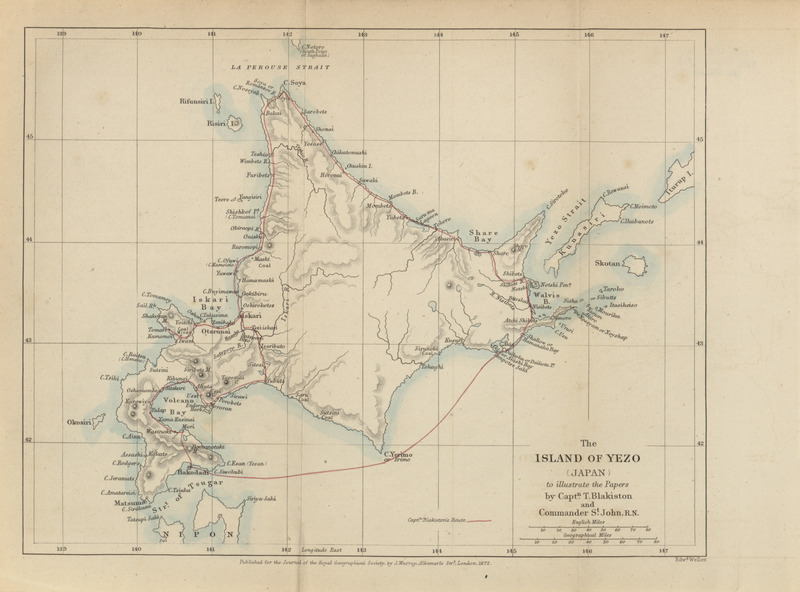 Narrative of a journey through the interior of Japan, from Nagasaki to Yeddo, in 1861. By Sir Rutherford Alcock, K.C.B., F.R.G.S. 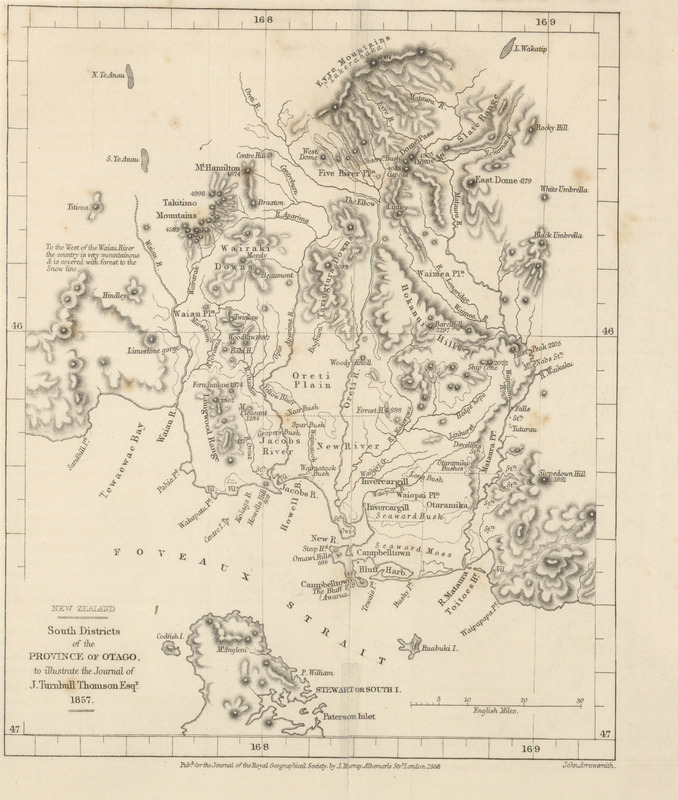 Journal of two expeditions to the West Coast of the Middle Island of New Zealand in the year 1859. By John Rochfort, Esq., of Nelson, Surveyor. 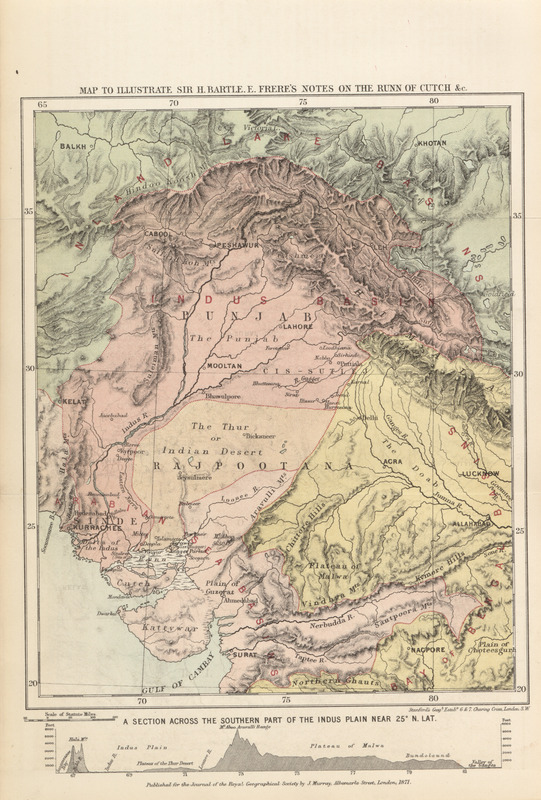 On the Highland Region adjacent to the Trans-Indus Frontier of British India. By Major James Walker, of the Boumbay Engineers. 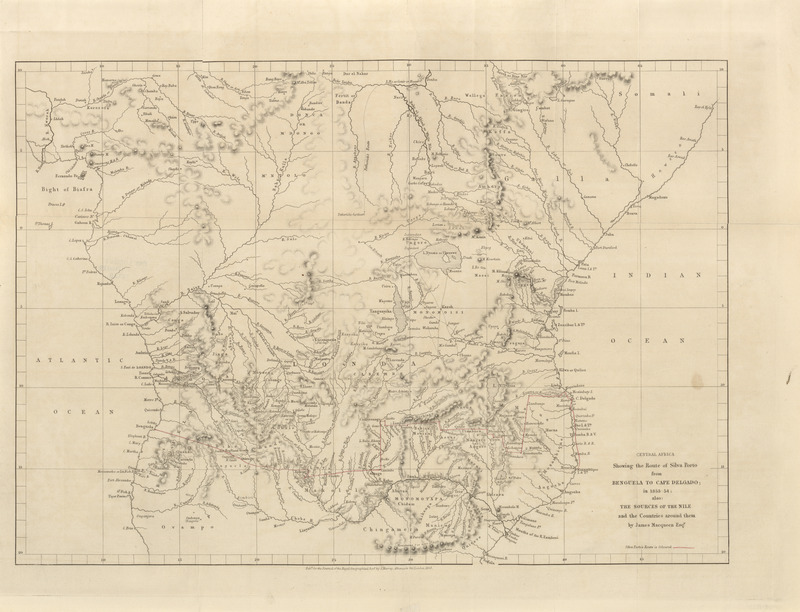 Notes to accompany sketch-maps of the Zulu and Amatonga countries, and of the country between Aliwal, North, and Natal. By John Sanderson, Esq. 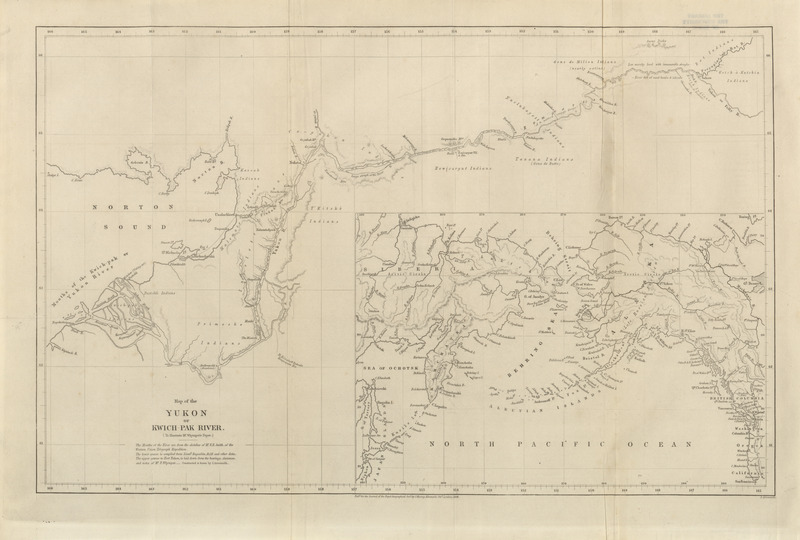 Expedition to the North-West coast of Australia. By F.T. Gregory, Esq., F.R.G.S. 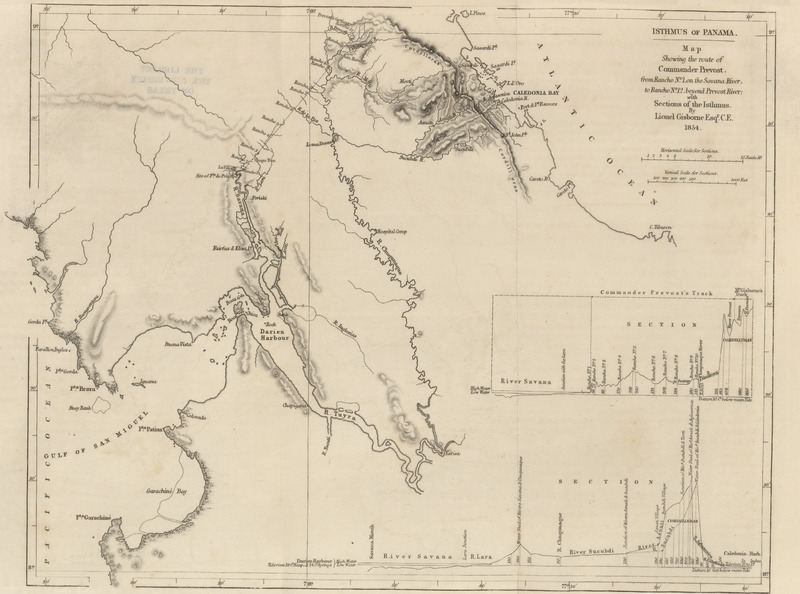 Exploring expedition from Victoria to the Gulf of Carpentaria, under the command of Robert O'Hara Burke, Esq. 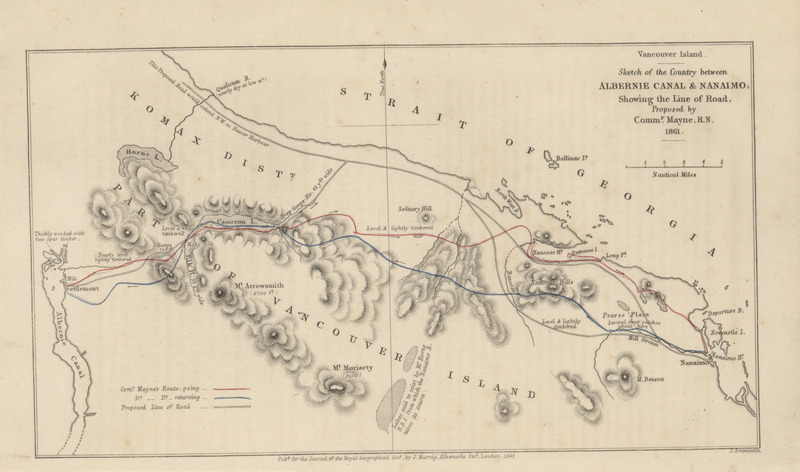 Route in exploring a road from Albernie Canal to Nanaimo, in Vancouver Island, in May 1861, with a track chart. By Commander Richard C. Mayne, R.N., F.R.G.S. 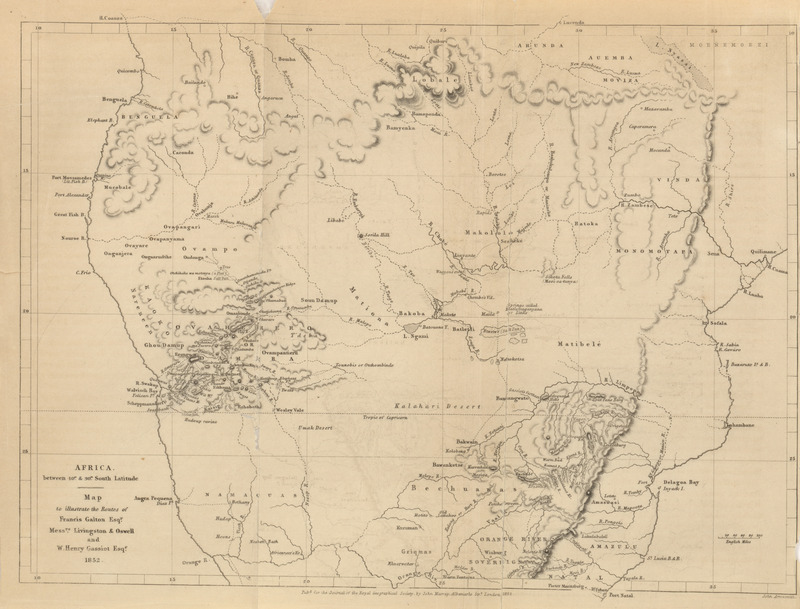 Eastern Australia; on which are delineated, the routes of Messrs. Burke and Wills, McKinlay-Landsborough, and Walker, 1863 (7.2MB) Exploration of the lower course of the River Burdekin, in Queensland, and its identification with the River Wickham. 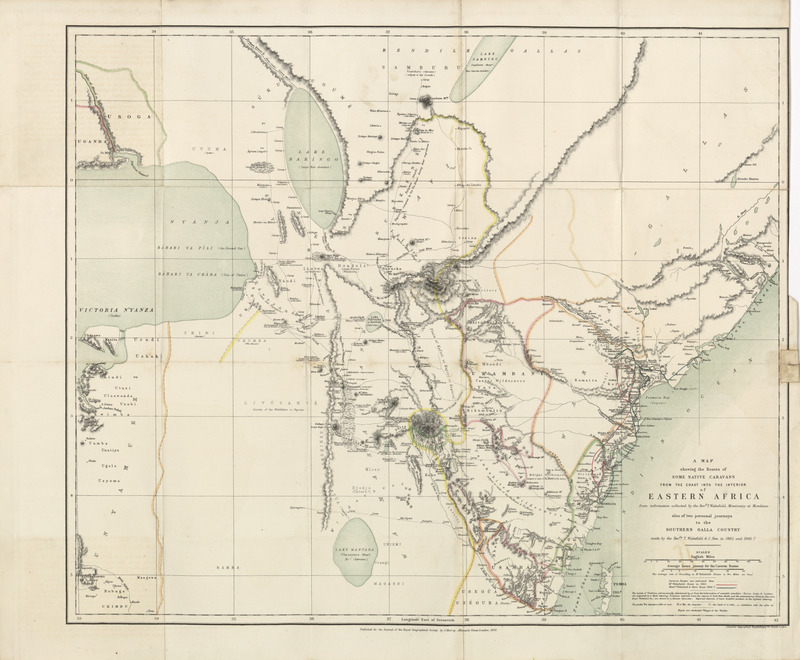 By George Elphinstone Dalrymple, Esq., Commissioner of Crownlands in the Kennedy District of that colony. Preceded by an extract from a despatch to his Grace the Duke of Newcastle, H.M Secretary of State for the colonies, from his excellency Sir George F. Bowen, Governor of queensland, dated "Brisbane, 5th March, 1862". 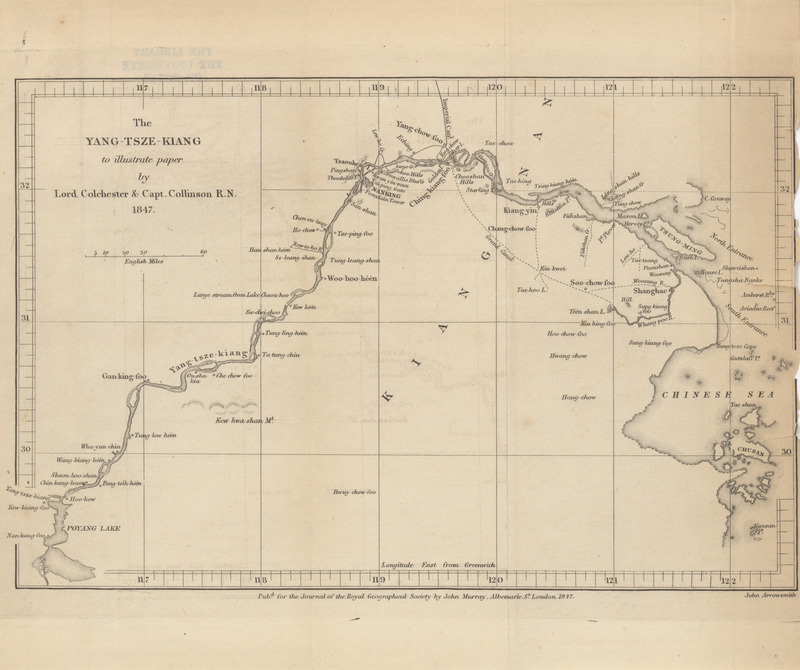 Narrative of a journey from Tientsin to Moukden in Manchuria in July, 1861. By A. Michie, Esq., F.R.G.S. 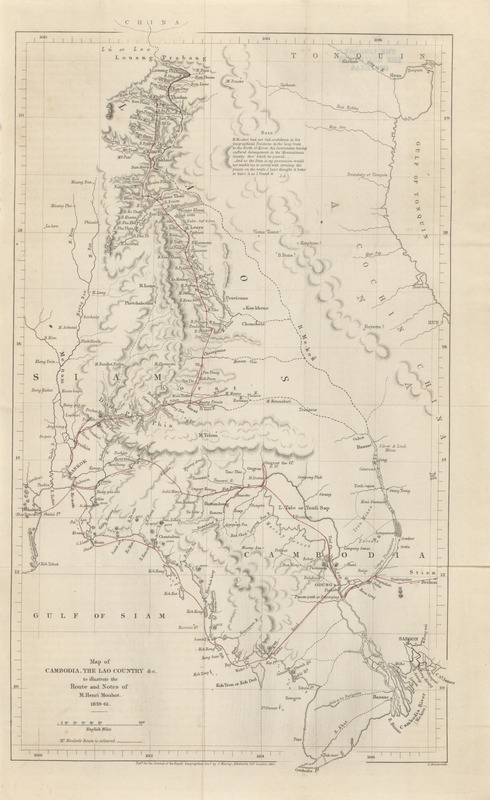 Diary of proceedings of the mission into Mekran from political and survey purposes, from the 12th to the 19th December, 1861. By Major F.J. Goldsmind, F.R.G.S. 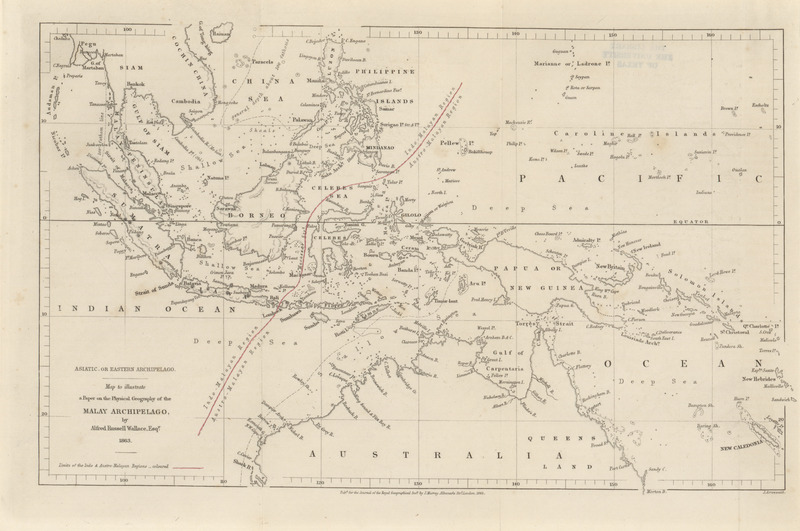 On the physical geography of the Malay Archipelago. By Alfred Russell Wallace, Esq., F.R.G.S. Diary of Mr. John M'Douall Stuart's (Gold Medallist, R.G.S.) 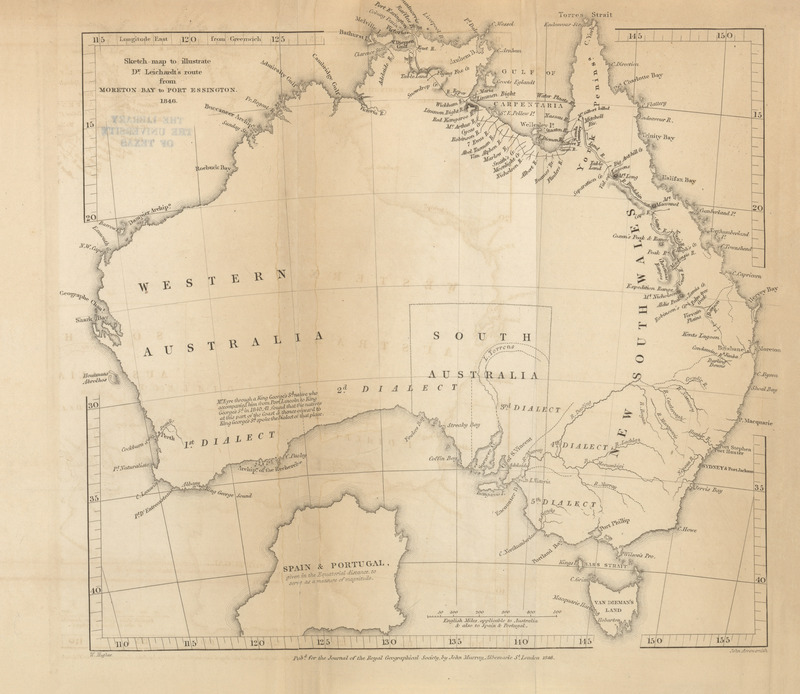 explorations from Adelaide across the continent of Australia, 1861-1862. 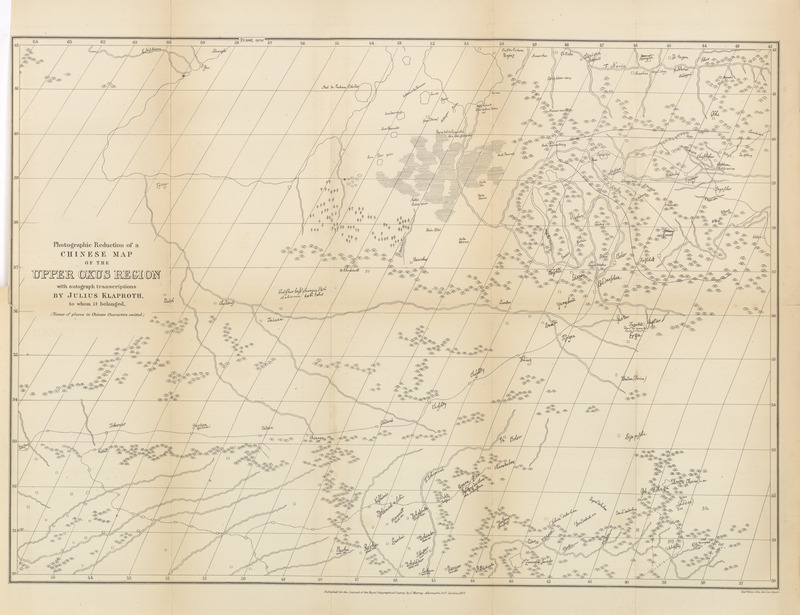 Upper basin of the Nile, by inspection and information. By Captain J. H. Speke, F.R.G.S. 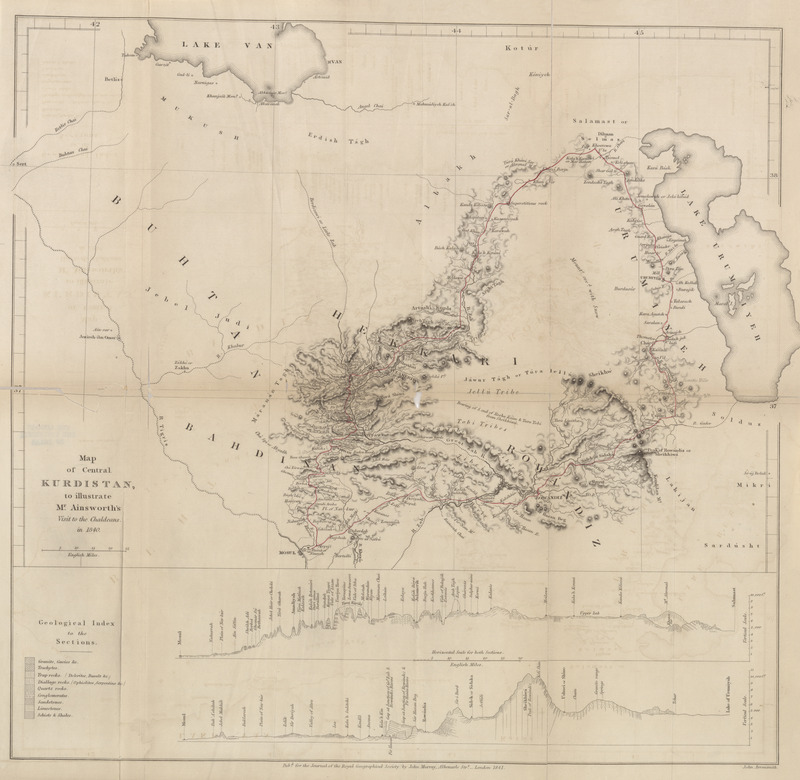 Geographical notes of an expedition to Mount Kilima-ndjaro in 1862-1863. By the Baron Charles von der Decken, honorary corresponding member R.G.S. 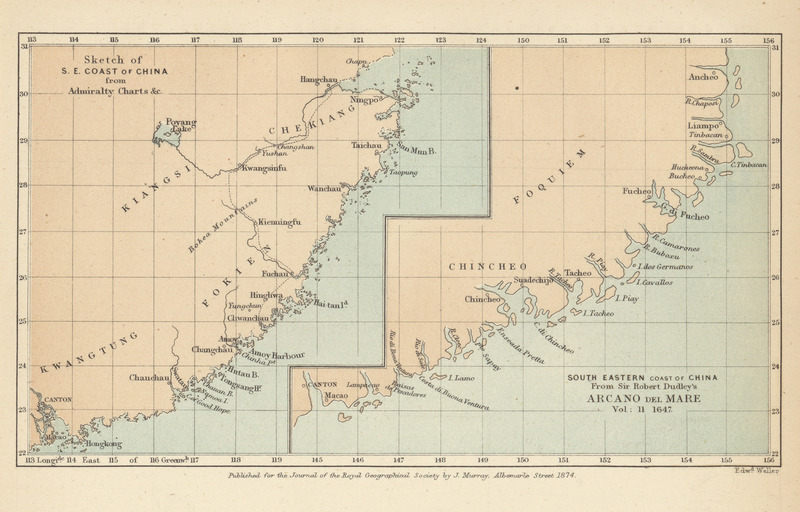 Notes on the Island of Formosa. By Robert Swinhoe, F.R.G.S., H.B.M. Vice-Consul at Formosa. On the Glaciers of the Mustakh Range. By Captain H.H. 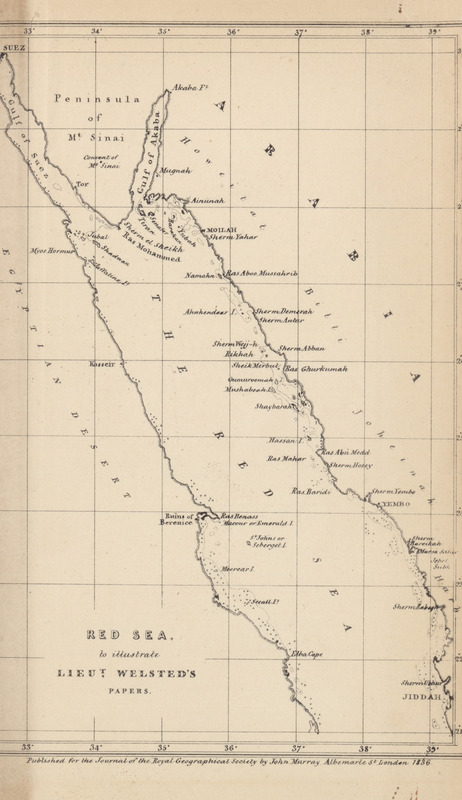 Godwin-Austen, F.R.G.S., Bengal S.C., late H.M. 24th Regt., assistant in the Great Trigonometrical Survey of India. 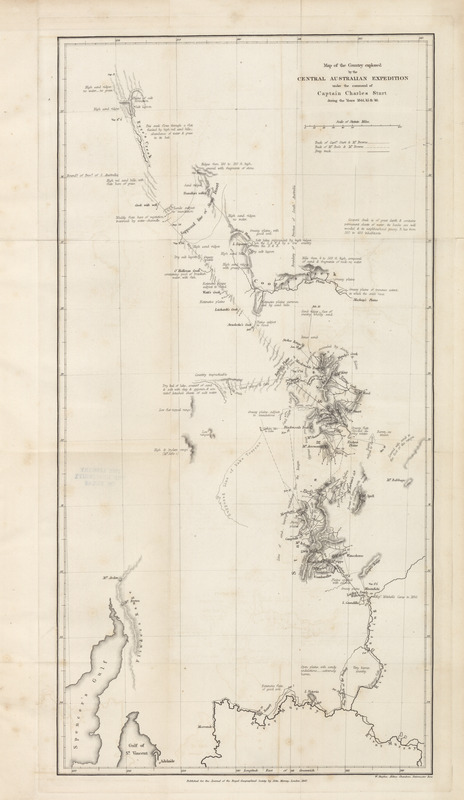 Reconnaissance survey of the Lake Districts of Otago and Southland, New Zealand. By James M'Kerrow, Esq. 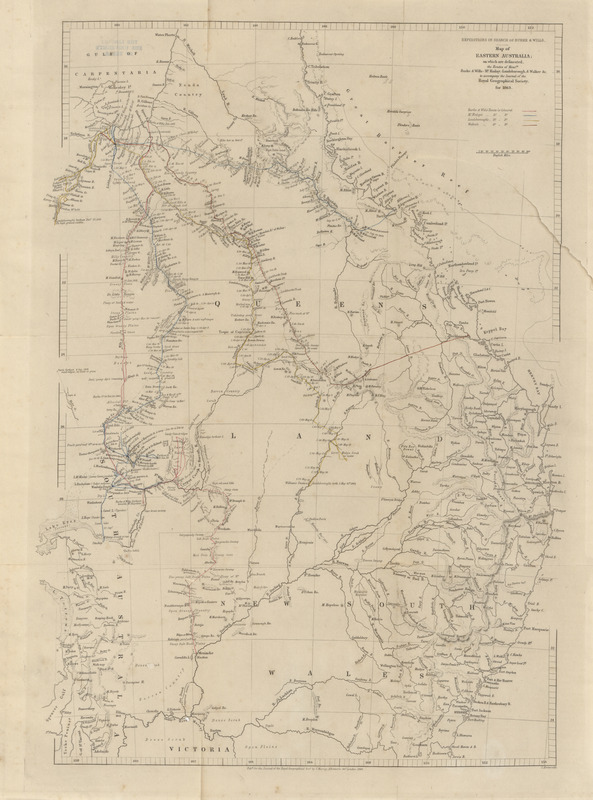 District surveyor to the province of Otago. An exploration up the Mosie River, to the edge of the table-land of the Labrador Peninsula. By Henry Youle Hind, M.A., F.r.G.S., Trinity College Toronto. 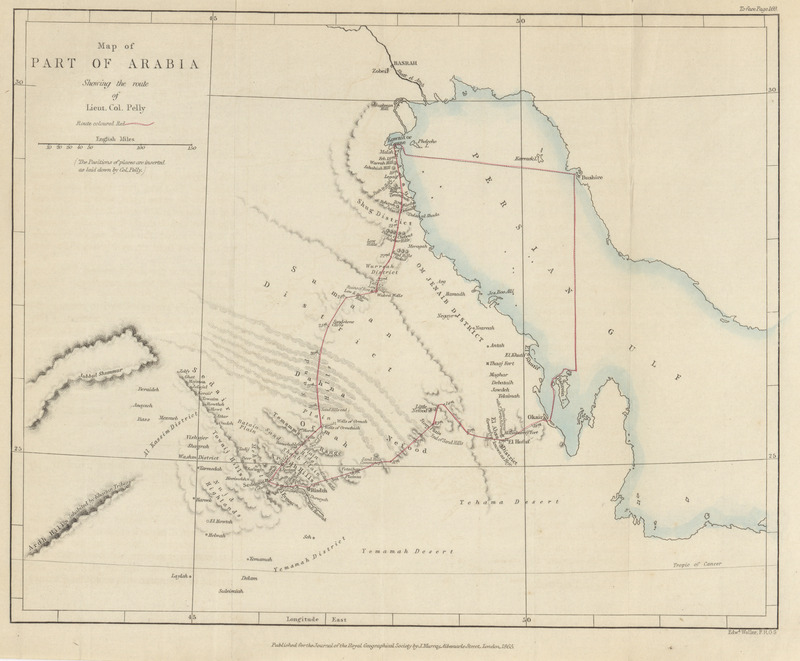 Arabia showing the routes of W.G. 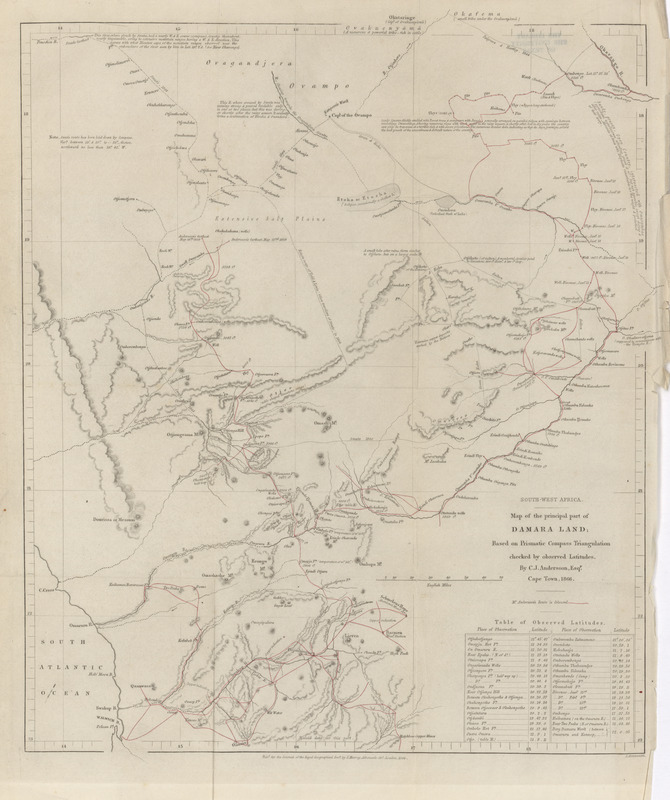 Palgrave Esq., 1862-1863 (2.5MB) Observations made in Central, Eastern, and Southern Arabia during a journey through that country in 1862 and 1863. By W.G. Palgrave, Esq. 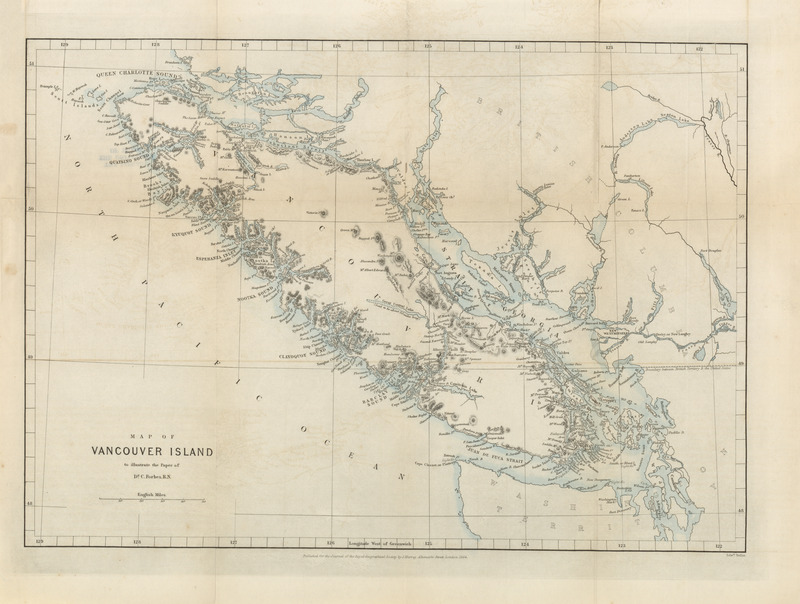 Notes on the physical geography of Vancouver Island. By C. Forbes, esq., M.D. 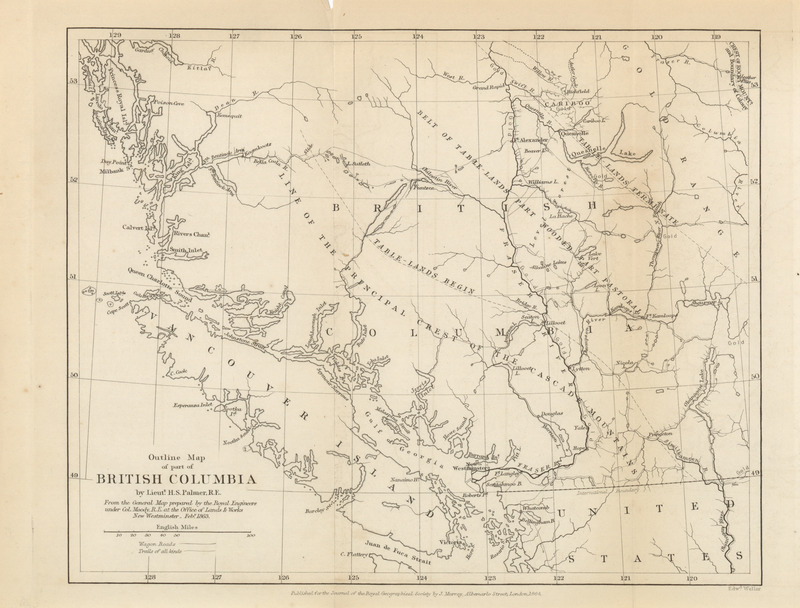 Remarks upon the geography and natural capabilities of British Columbia, and the condition of its principal Gold-Fields. By Lieutenant H.S. Palmer, R.E. 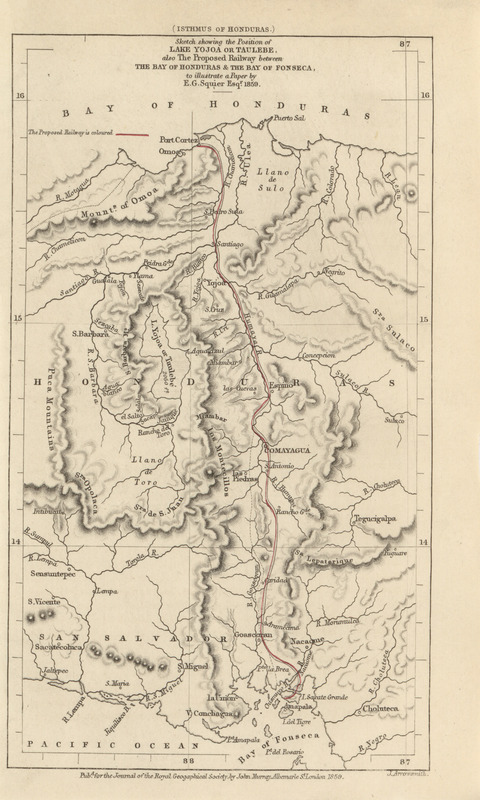 Details of a journey through part of the Salado Valley, and across some of the Argentine provinces. By Thomas J. Hutchinson, F.R.G.S. 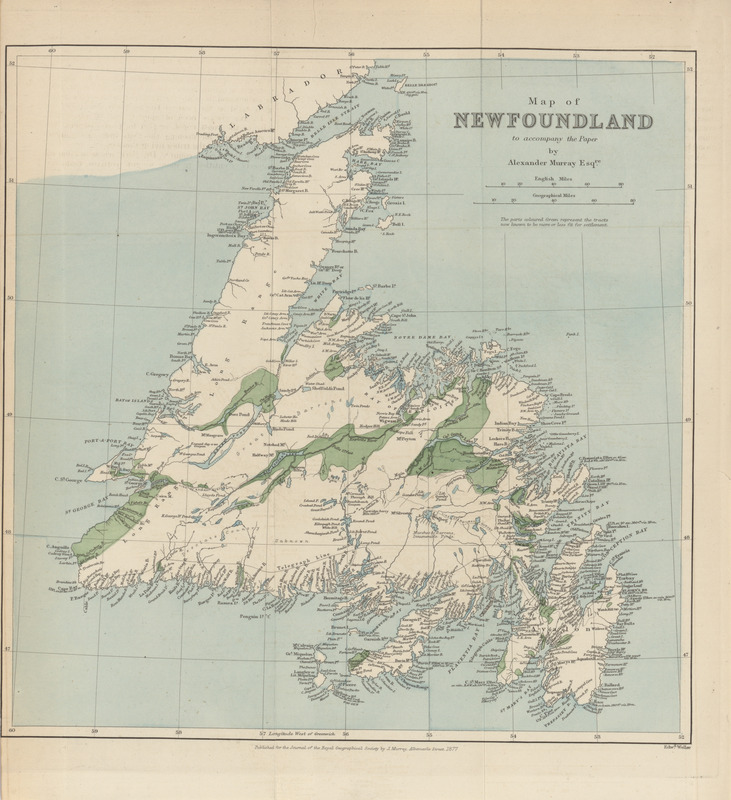 Newfoundland to accompany the paper by the Rev. 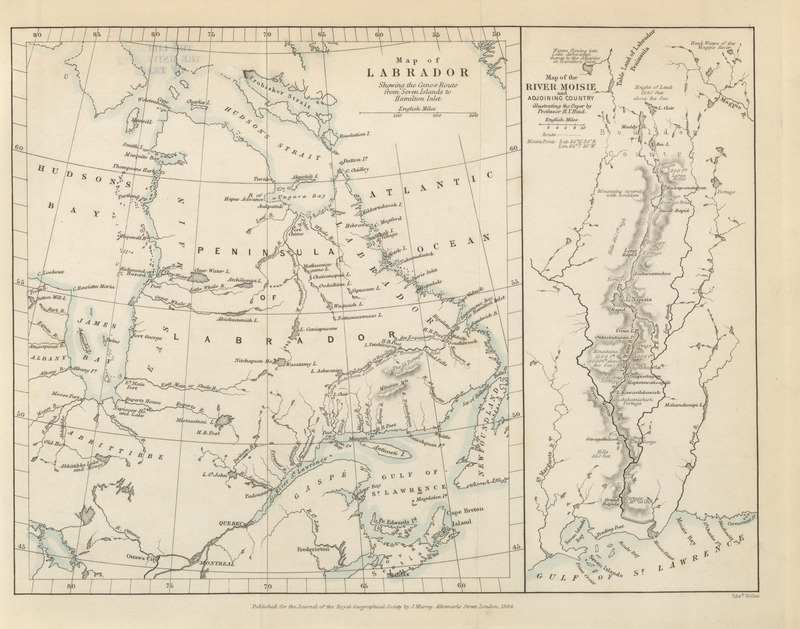 J. Moreton, 1864 (3.2MB) Some account of the physical geography of Newfoundland. By Julian Moreton, colonial Chaplain, Labuan. Water supply in the basin of the River Orange, or 'Gariep, South Africa. By James Fox Wilson, Esq. On the Bayanos River, Isthmus of Panama. By Laurence Oliphant, Esq., Secretary R.G.S. 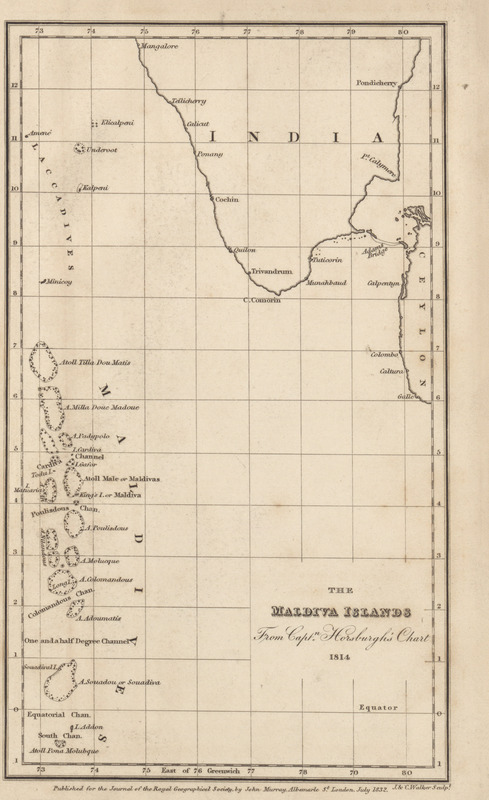 On the specific gravity, temperature, and currents of the seas passed through during voyages from England to India. By Henry Toynbee. 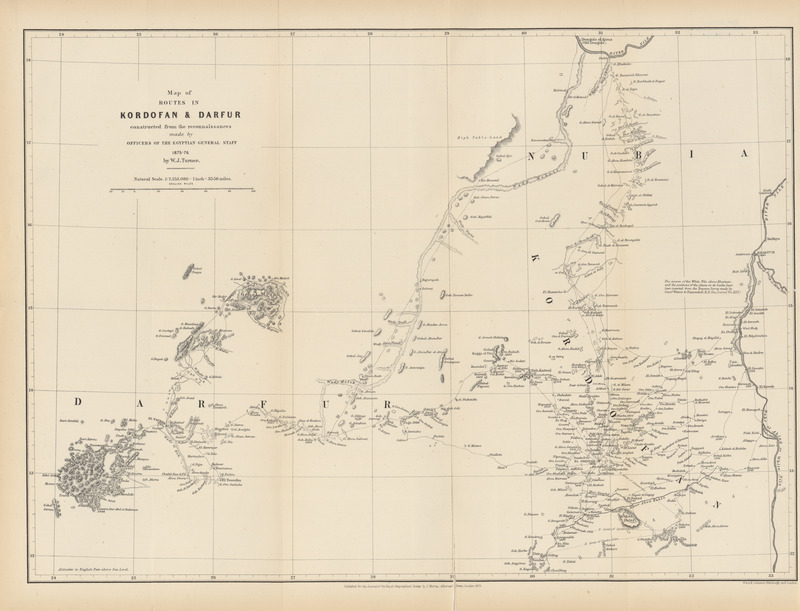 F.R.A.S., and F.R.G.S., Master Mariner. A visit to the Wahabee Capital, Central Arabia. By Lieut.-Colonel Lewis Pelly, H.M. Political Resident, Persian Gulf. 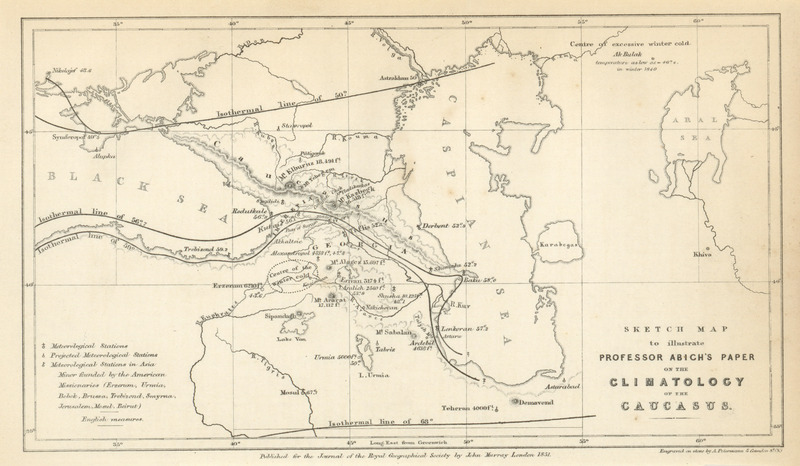 Account of the discovery of the second Great Lake of the Nile, Albert Nyanza. By Samuel White Baker. 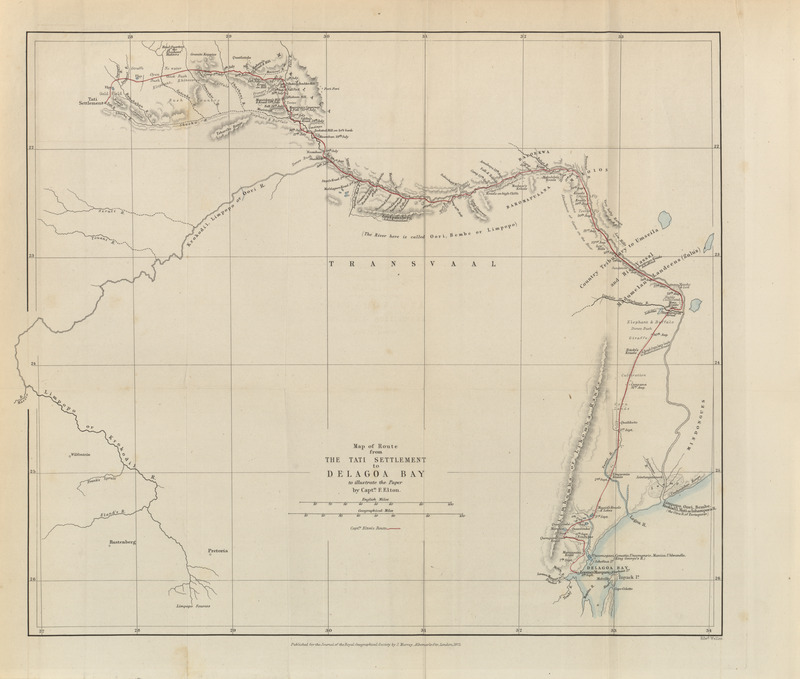 Second journey into Equatorial Western Africa. By M.P.B. Du Chaillu. Ascent of the River Purus. By W. Chandless, Esq., MA., Gold Medallist R.G.S. Notes on the River Aquiry, the principal affluent of the River Purus. By W. Chandless, Esq., M.A., Gold Medallist R.G.S. 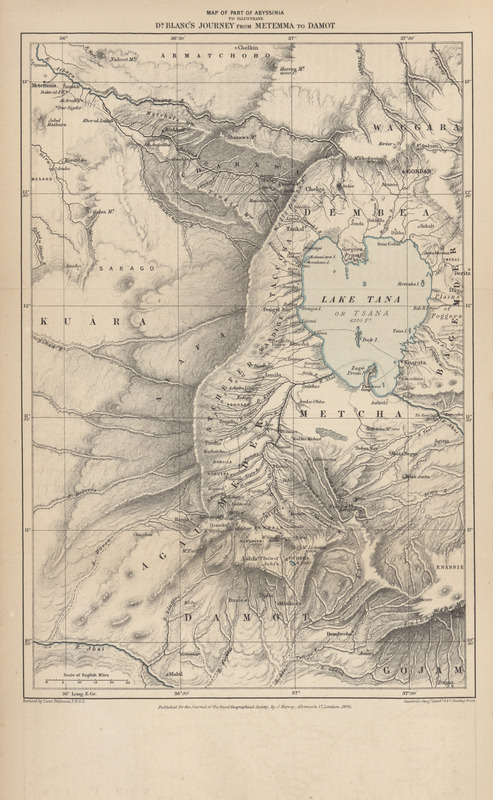 On the geographical position of Yarkund, and some other places in Central Asia. By Captain T.G. 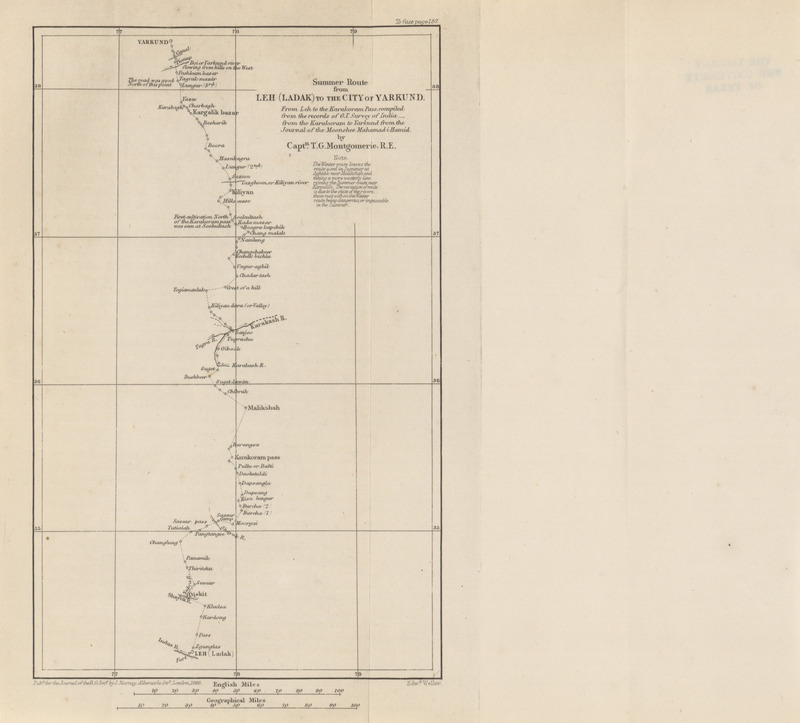 Montgomerie, R.E., Astronomical Assistant Great Trigonometrical Survey of India. 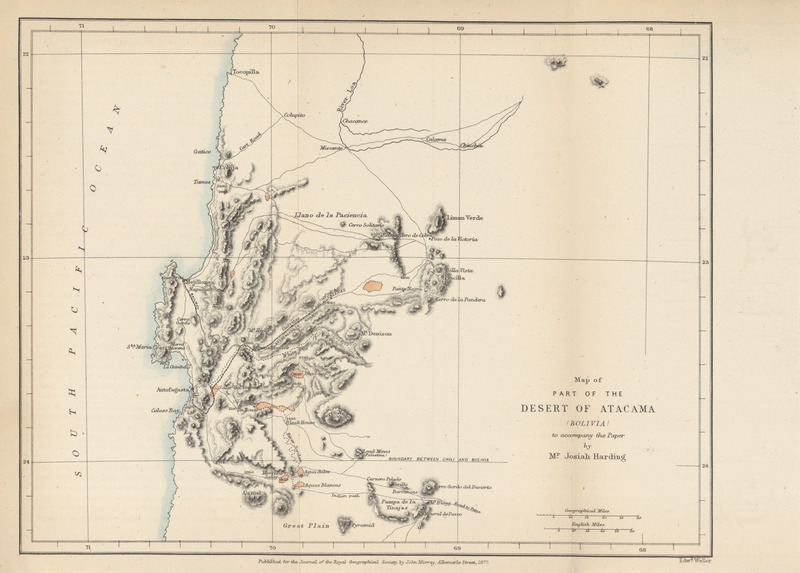 An account of the levelling from the Mediterranean to the Dead Sea, by Captain C. W. Wilson, R.E., and a party of Royal Engineers from the Ordnance Survey. By Colonel Sir Henry James, R.E., F.R.S. Notes to accompany Mr. C.J. 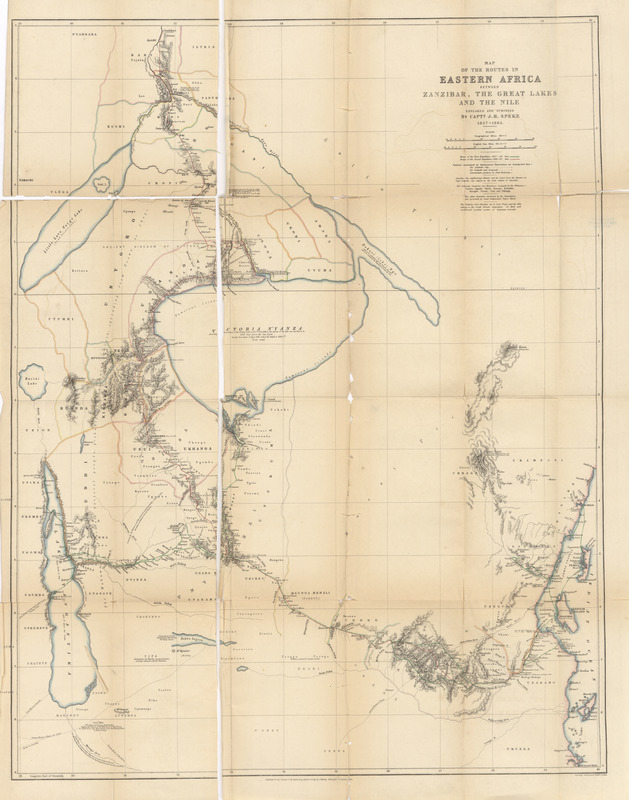 Andersson's map of Damara Land. Thomas Baines, Esq. 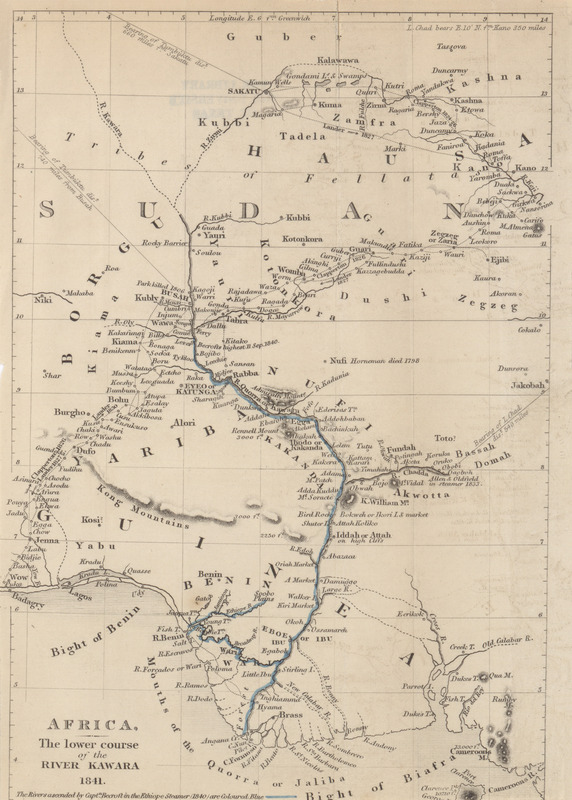 On Dr. Livingston's last journey, and the probable ultimate sources of the Nile. By Alex. Geo. Findlay, F.R.G.S. 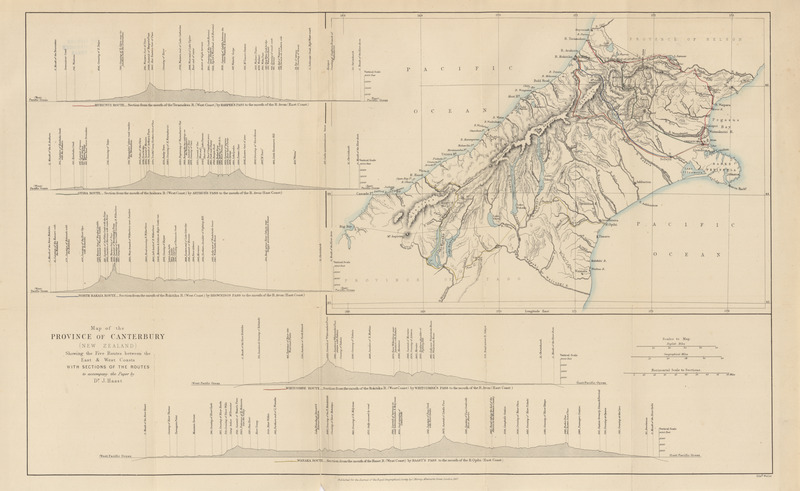 Altitude sections of the principal routes between the East and West coasts of the province of Canterbury, New Zealand, across the Southern Alps. By Julius Haast, PH. 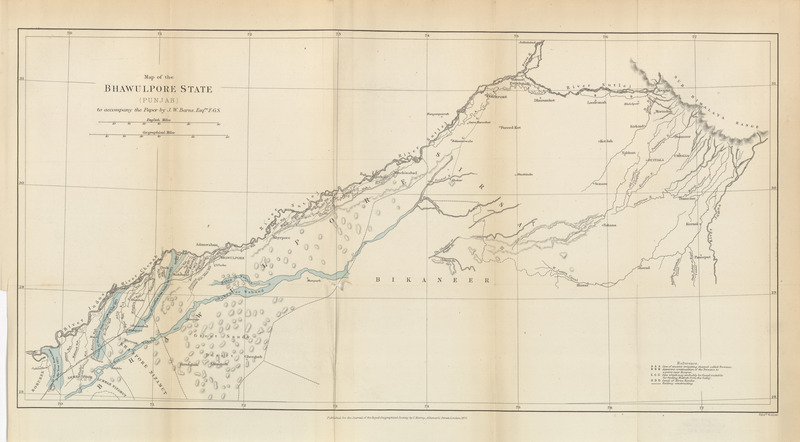 D., F.G.S., F.L.S..
Geographical results of the Abyssinian expedition. By C.R. 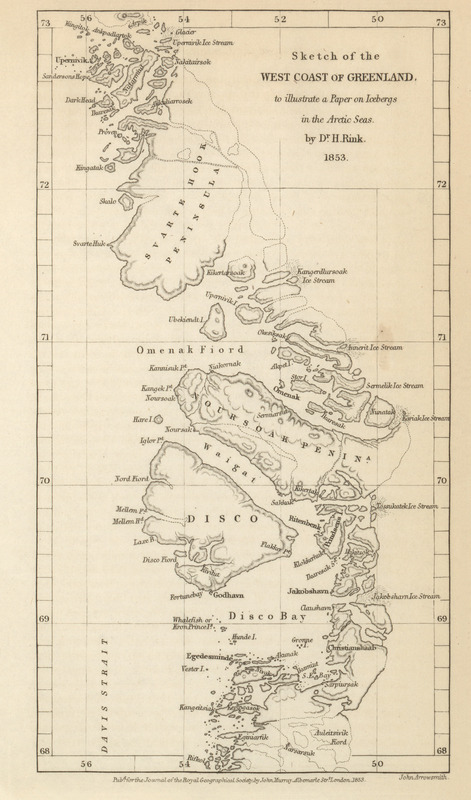 Markham, Esq., Secretary, Royal Geographical Society. 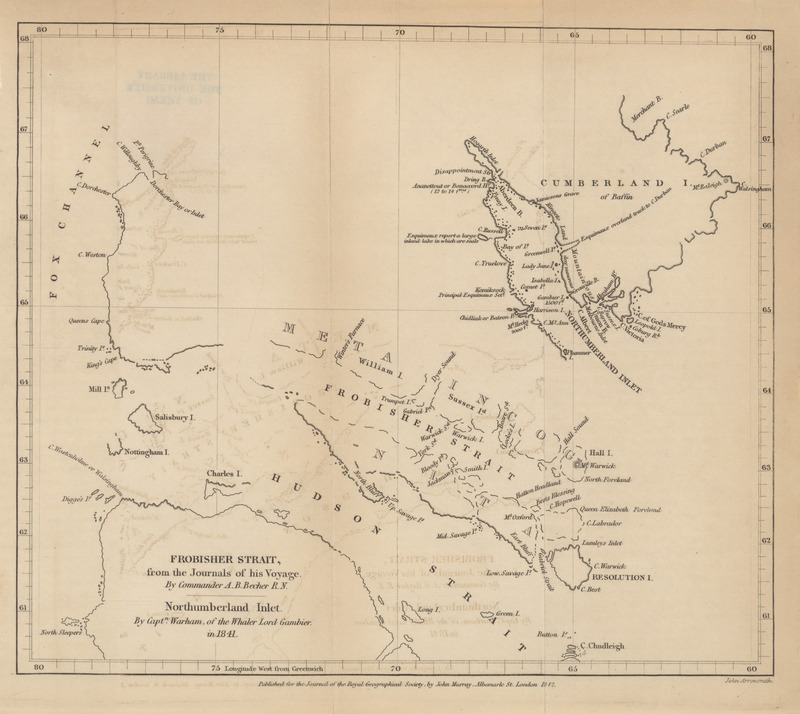 A journey from Norton Sound, Behring Sea, to Fort Youkon (Junction of Porcupine and Youkon Rivers). By Frederick Whymper, Esq. 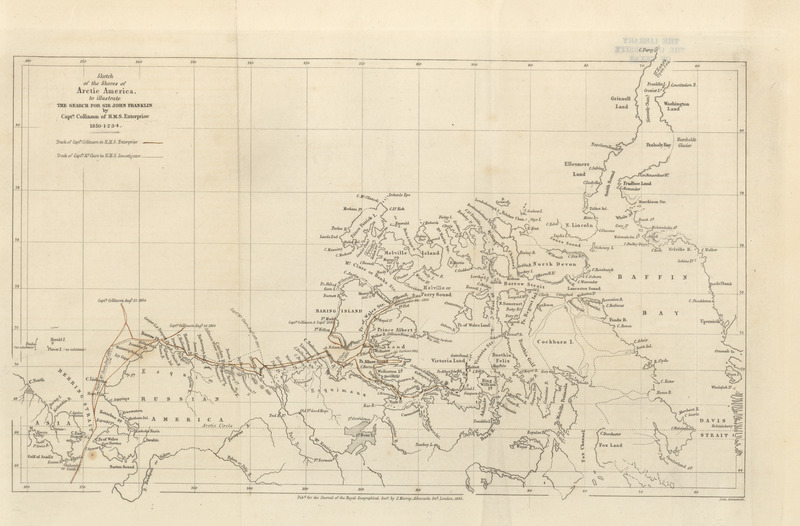 A visit to the North-East coast of Labrador, during the Autumn of 1867, by H.M.S. Gannet, Commander W. Chimmo, R.N. 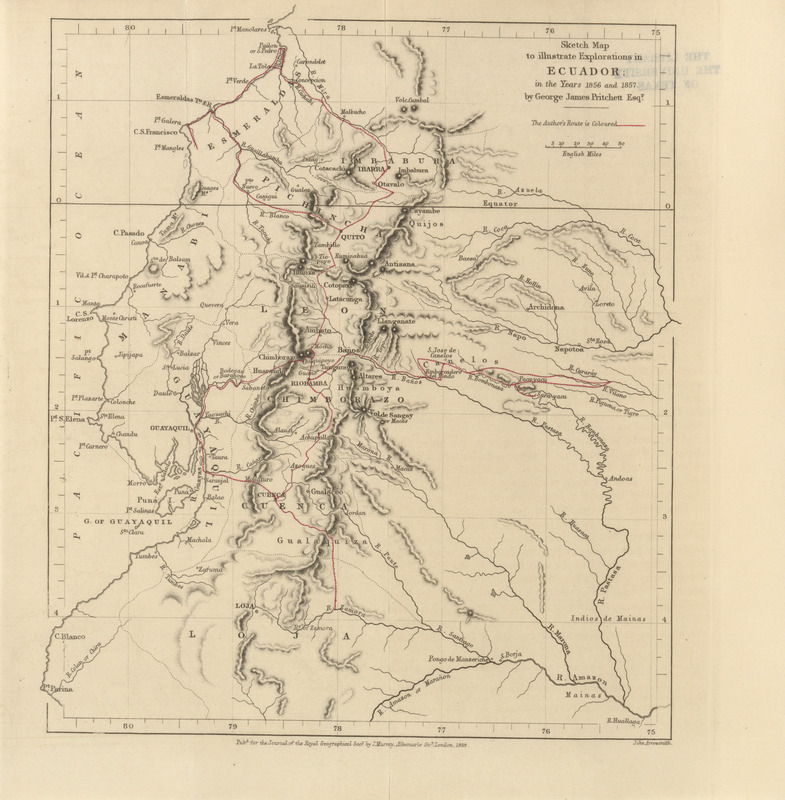 Journal of a tour in Armenia, Kurdistan, and Upper Mesopotamia, with notes on researches in the Deyrsim Dagh, in 1866. By J.G. Taylor, H.M. Consul for Kurdistan. 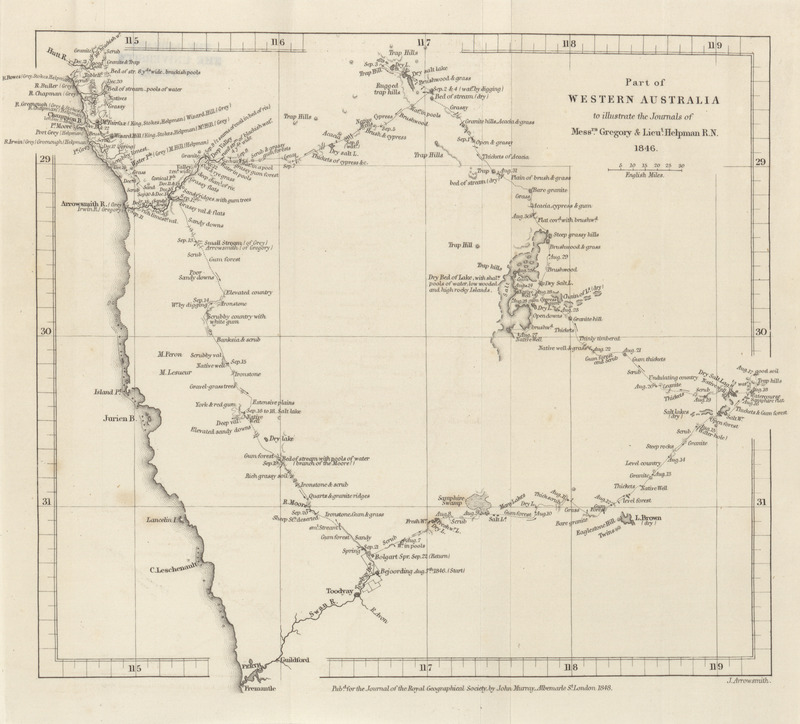 Notes on the physical geography, climate, and capabilities of Somerset and the Cape York Peninsula, Australia. By Dr. Alexander Rattray, M.D. (Edin. ), R.N. Notes on Manchuria. By the Rev. Alexander Williamson, B.A. 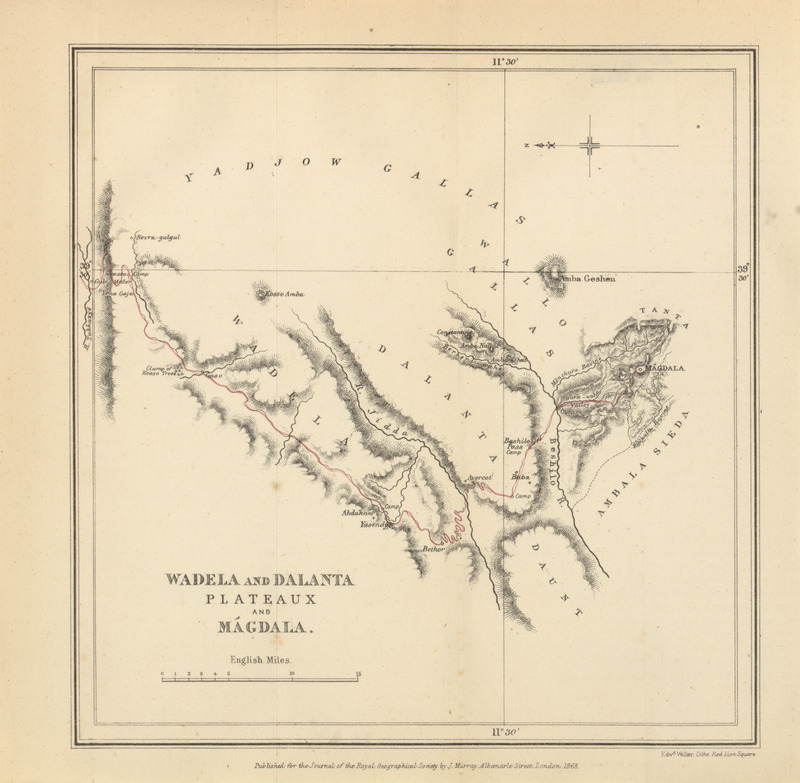 From Metemma to Damot, along the Western Shores of the Tana Sea. 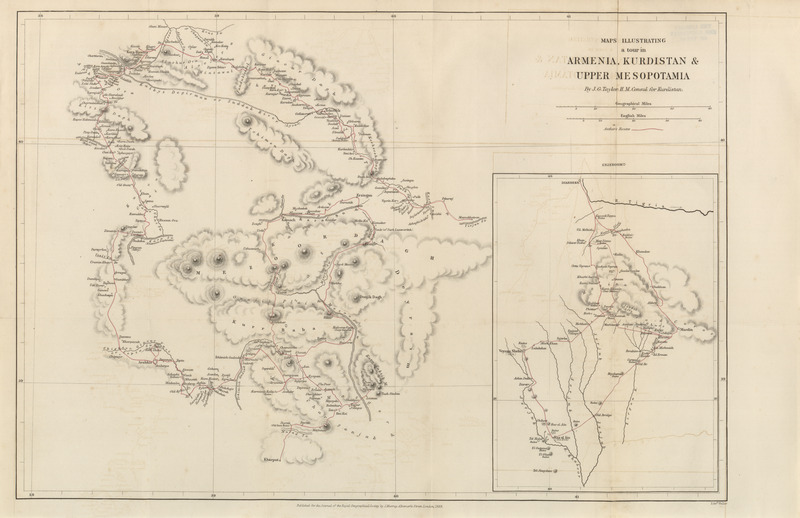 By Henry Blanc, M.D., M.R.C.S.E., Staff Assistant Surgeon, H.M. Bombay Medical Staff, lately on special duty in Abyssinia. Effects of forest destruction in Coorg. By George Bidie, M.B. 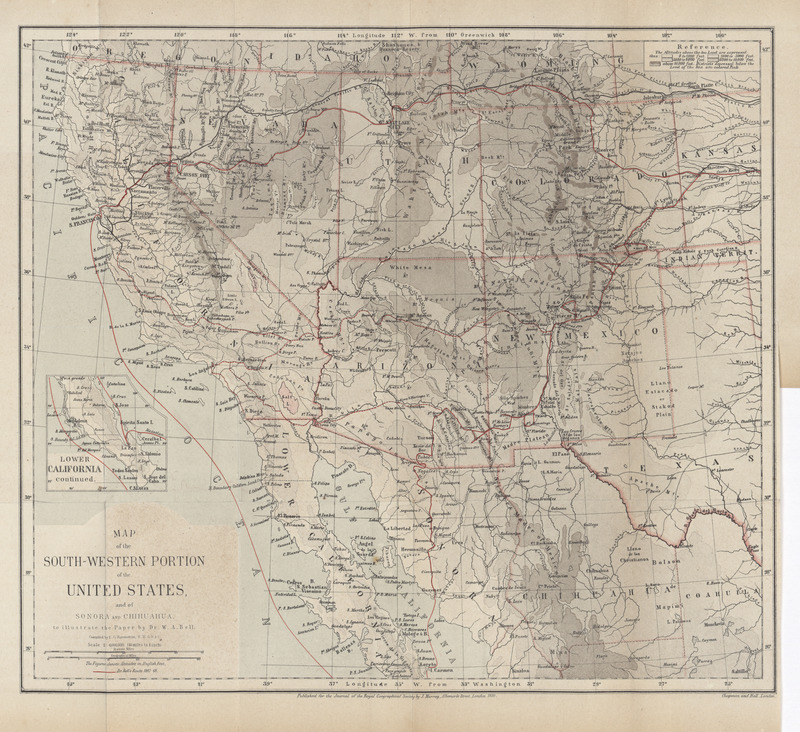 On the basin of the Colorado and the Great Basin of North america. By W.A. Bell, M.A., M.B. 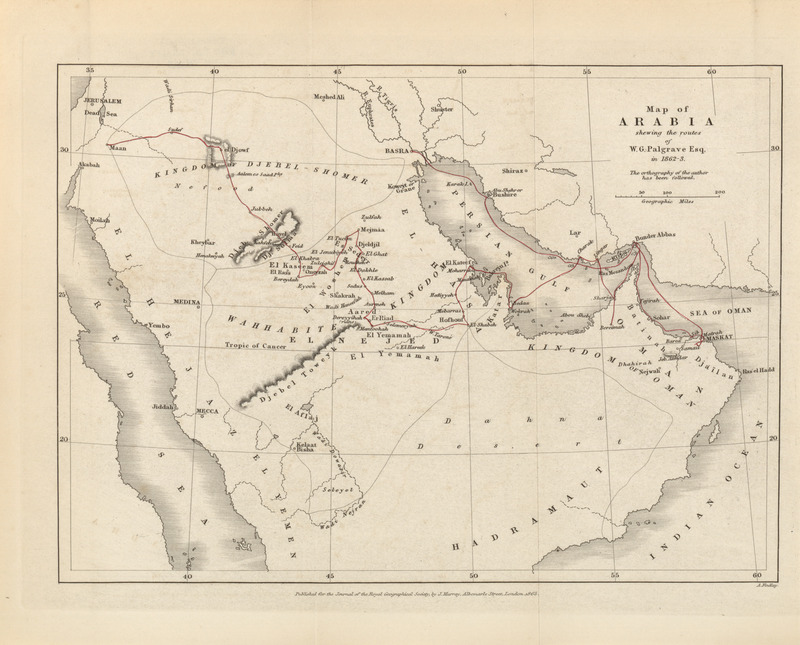 Narrative of a journey through the Afar country. By W. Munzinger, Esq. Hon. corresponding member R.G.S. 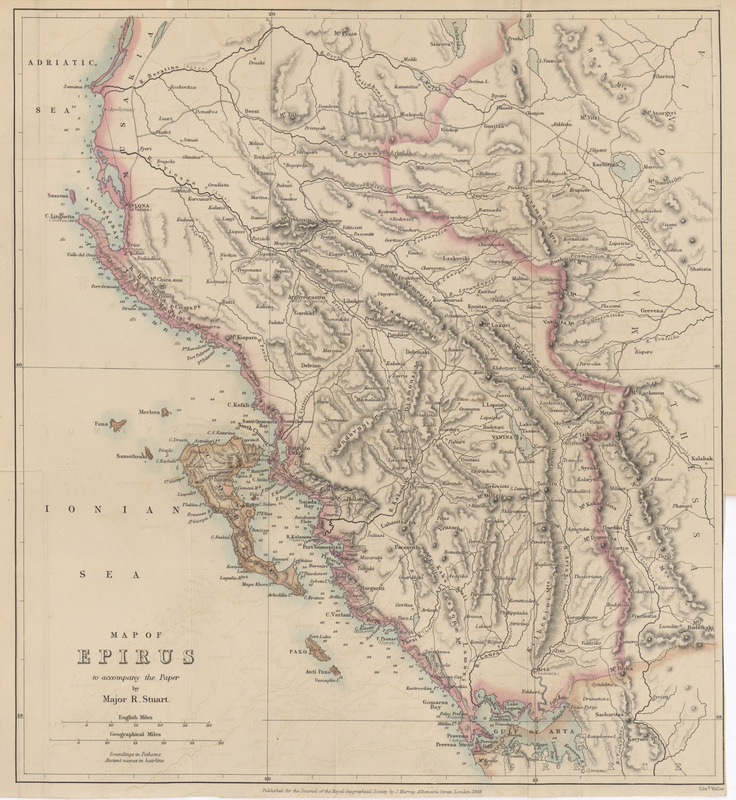 On the physical geography and natural resources of Epirus. 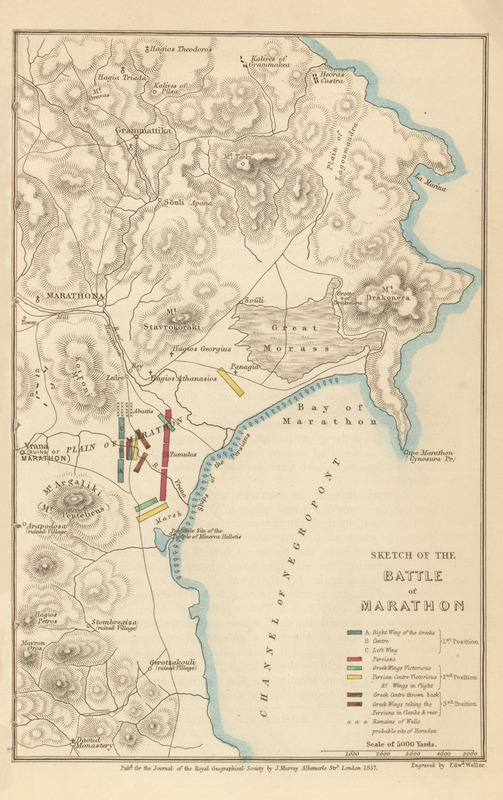 By Major R. Stuart, H.M. Consul at Yaniua. Notes on a journey up the River Jurua. By W. Chandless, Gold Medallist R.G.S. 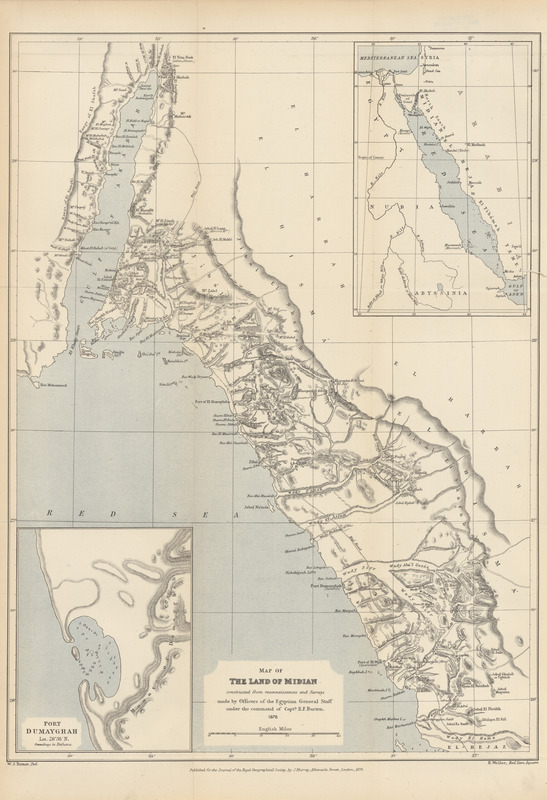 Notes on the map of the Peninsula of Sinai. By Rev. W. Holland. 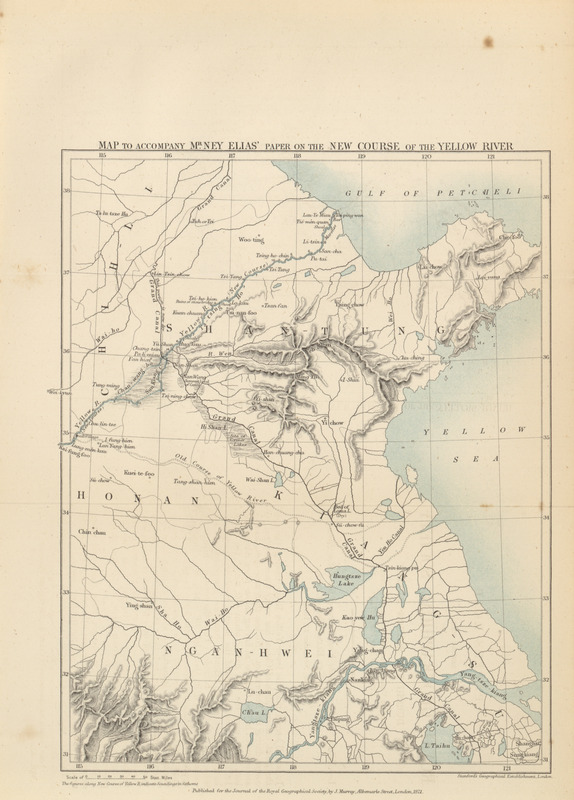 Notes of a journey to the new course of the Yellow River, in 1868. By Ney Elias, Esq., F.R.G.S. 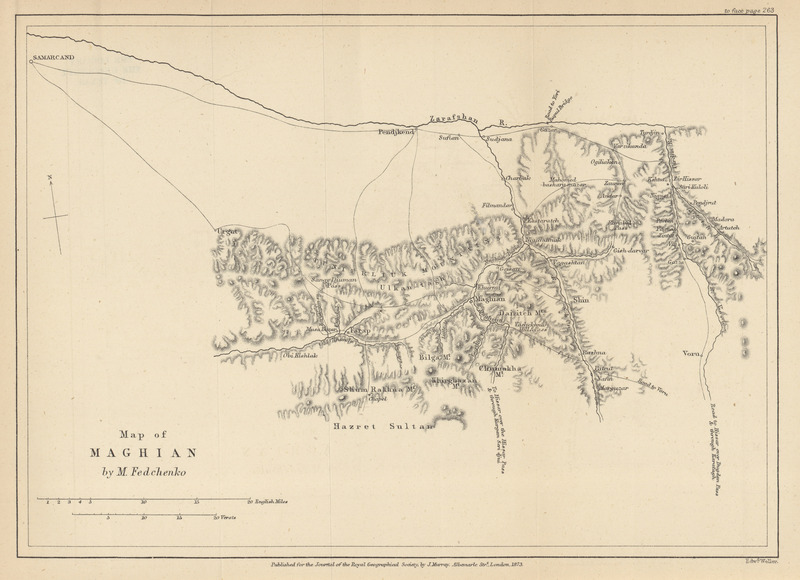 Journey from Leh to Yarkand and Kashgar, and exploration of the sources of the Yarkand River. By G.W. Hayward. 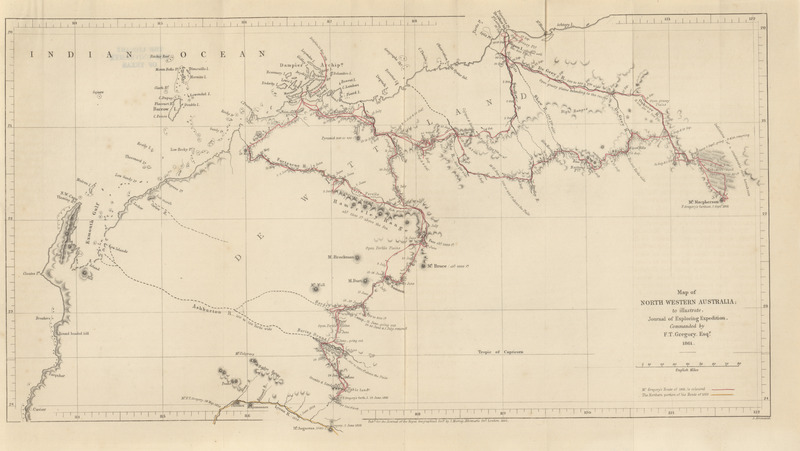 A visit to Easter Island, or Rapa Nui, in 1868. By J. Linton Palmer, F.R.C.S., Surgeon of H.M.S. Topaze. 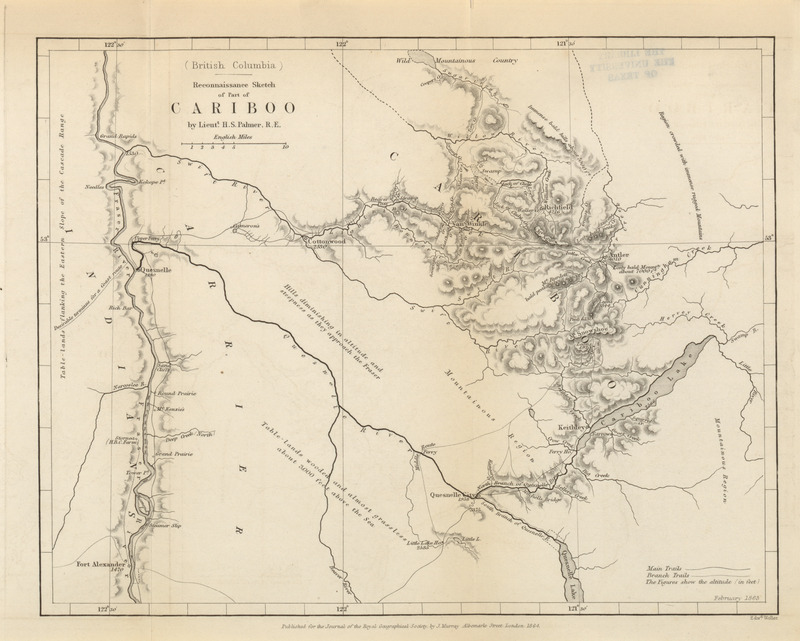 Notes on the Runn of Cutch and neighbouring region. By Sir H. Bartle E. Frere, K.C.B. Notes on a journey through Shantung. By J. Markham. 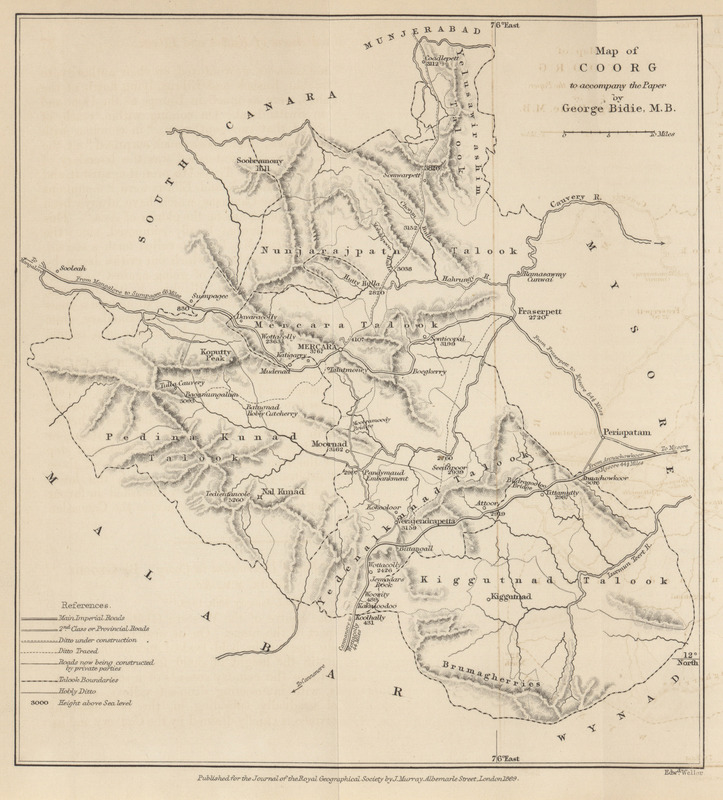 Expedition to the Trans-Naryn country in 1867. By Baron P. R. Osten-Sacken. Translated from Russian, and communicated by E. Delmar Morgan, F.R.G.S. Special mission up the Yang-tsze-kiang. By R. Swinhoe, H.M. Consul. 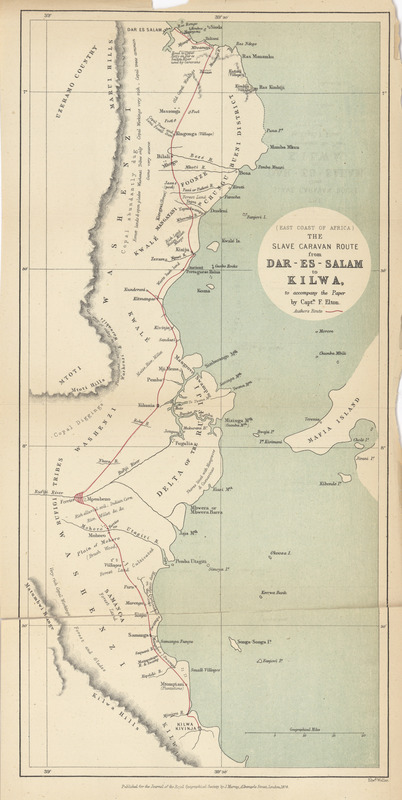 Routes of Native Caravans from the coast to the interior of Eastern Africa, chiefly from information given by Sadi Bin Ahedi, a native of a district near Gazi, in Udigo, a little north of Zanzibar. By T. Wakefield, Missionary at Mobasa. 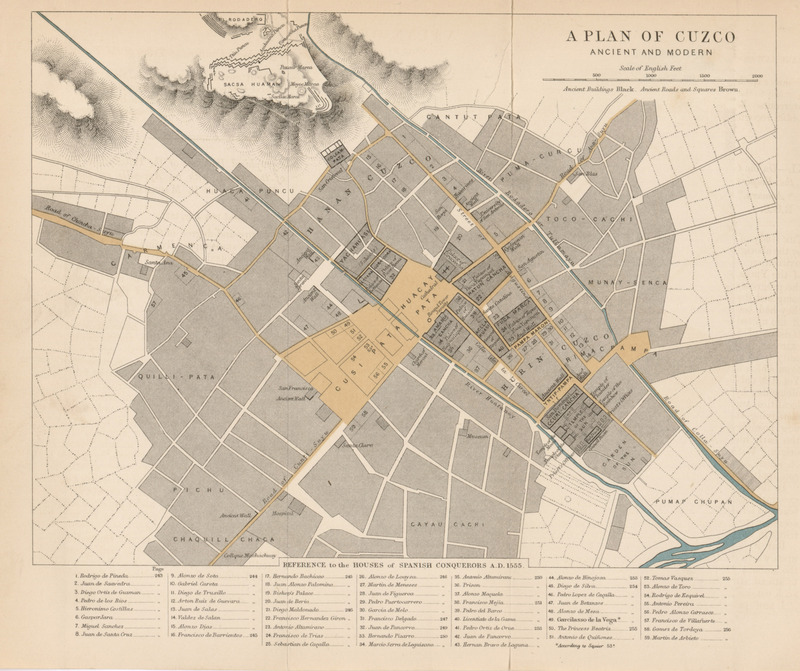 Report on the Central Silk Districts of Japan. 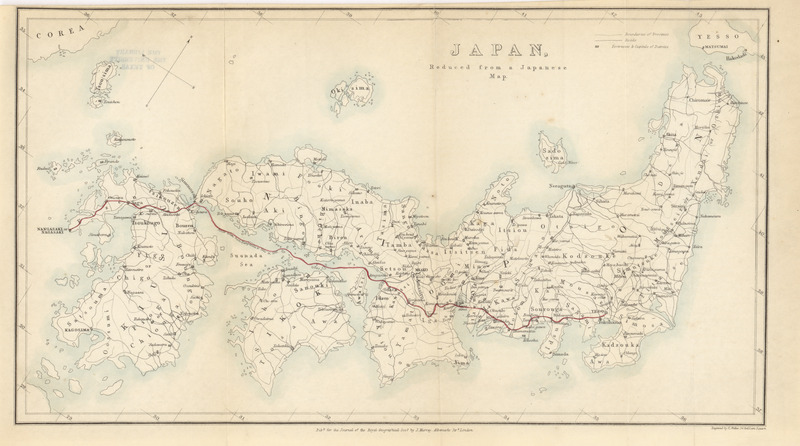 by Mr. Adams, Secretary to H.M. Legation in Japan. On surface temperatures in the North Atlantic. By Admiral Irminger, Copenhagen, Corr. Member R.G.S. 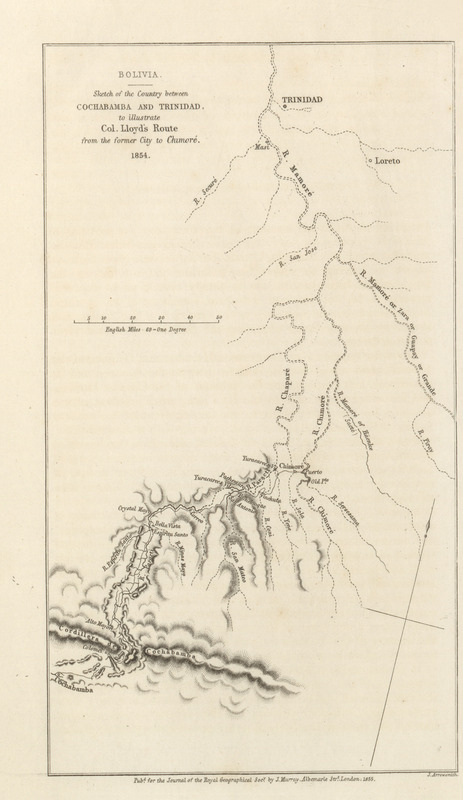 Topographical sketch of the Zarafshan Valley. By Mr. A. Fedchenko, Professor in Moscow University. 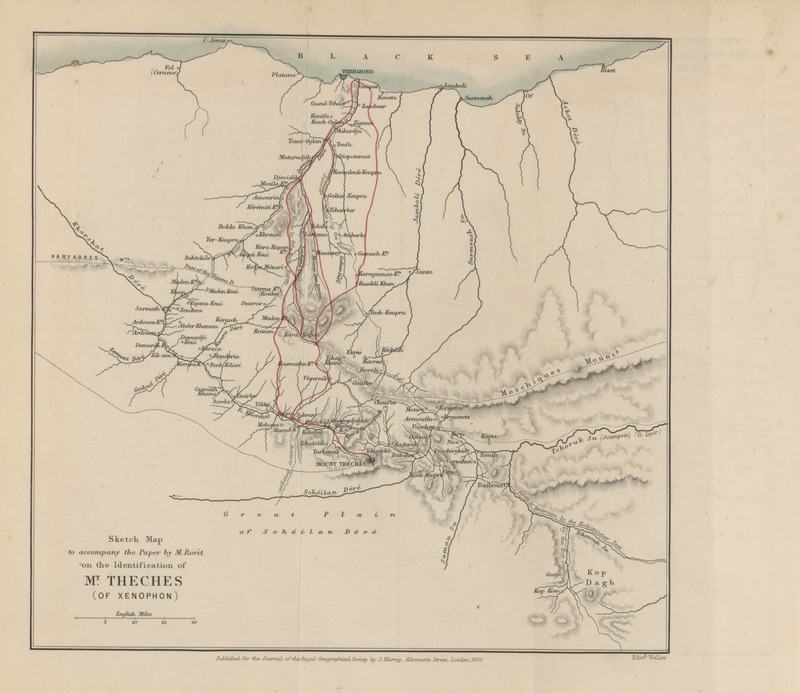 Identification of the Mount Theches of Xenophon. By M. P. Rorit. 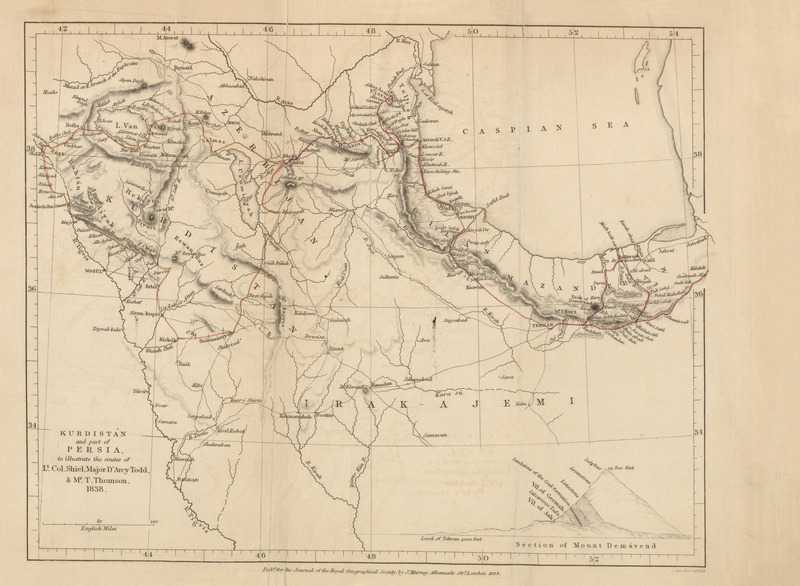 Letters from Mr. G. W. Hayward, on his expeditions in Gilgit and Yassin. A year in Patagonia. By Lieutenant Musters, R.N. Report on the Kaieteur Waterfall in British guiana. By Charles B. Brown. 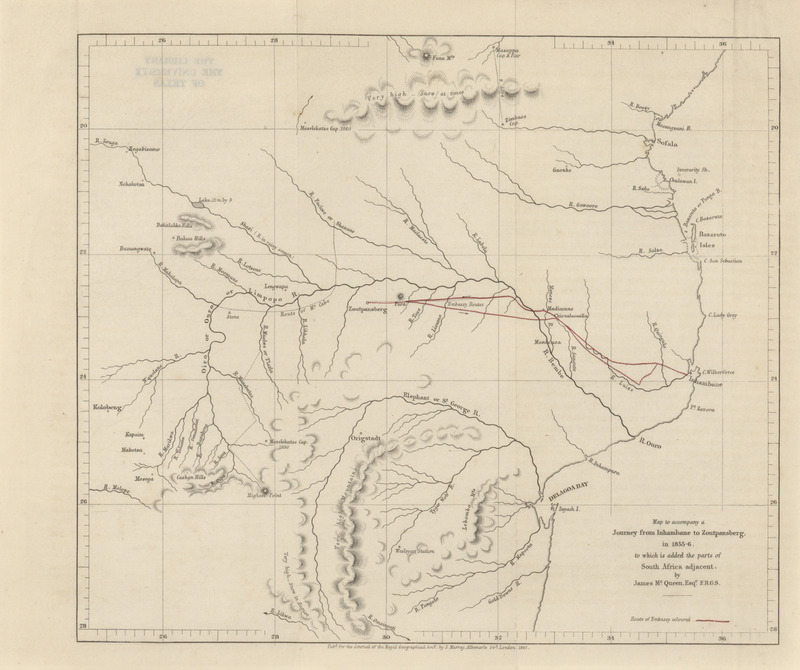 Account of Mr. Baines' exploration of the Gold-bearing region between the Limpopo and Zambesi Rivers. Prepared from Mr. Baines' journals, by Robert J. Mann, M.D., F.R.G.S., F.R.A.S. 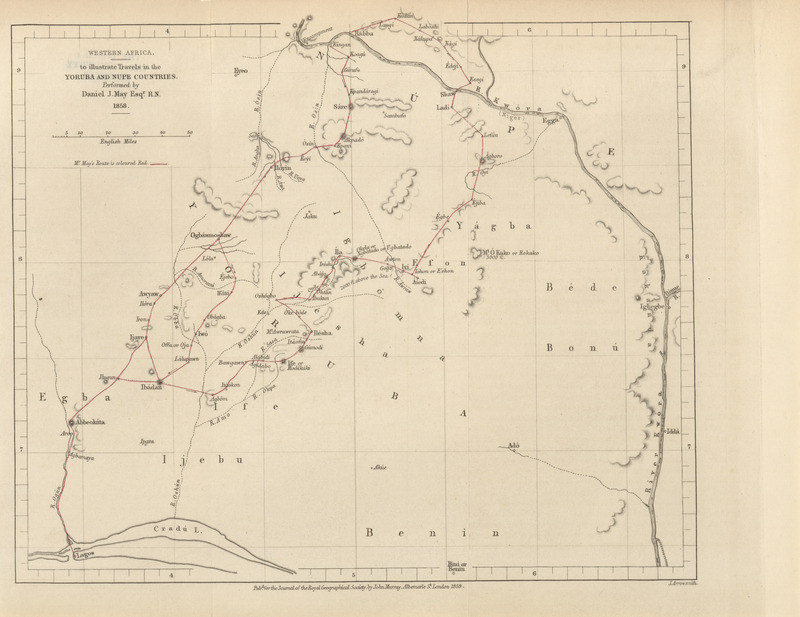 Report of "The Mirza's" exploration from Canbul to Kashgar. By Major T.G. 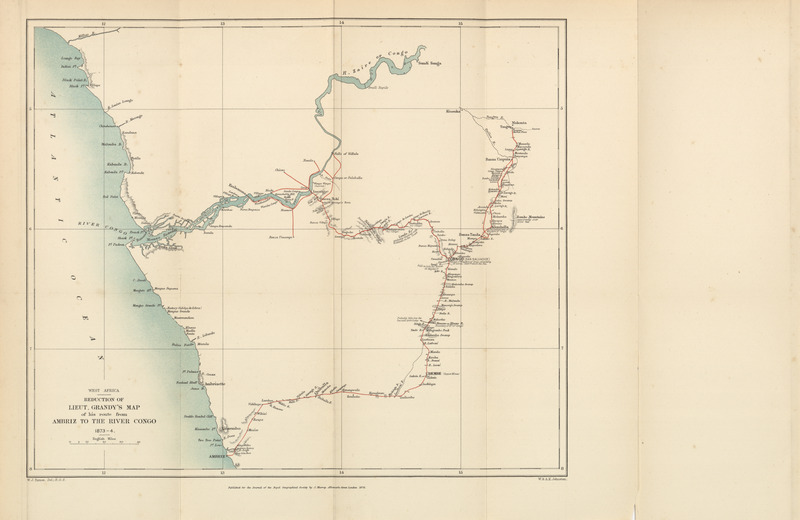 Montgomerie, R.E., Gold Medallist R.G.S., Deputy Superintendent Great Trigonometrical Survey of India. 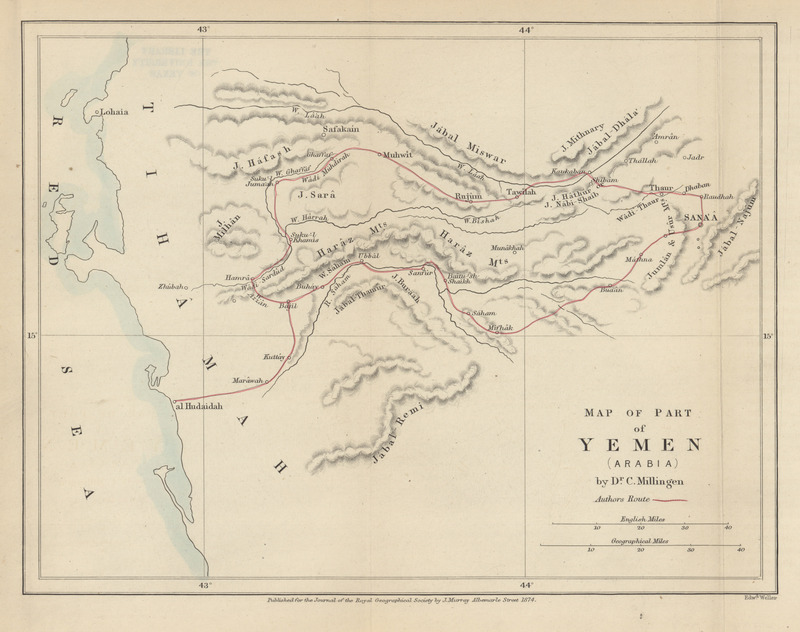 Account of an excursion into the interior of Southern Arabia. By Captain S.B. Miles, Bombay Staff Corps, F.R.G.S. 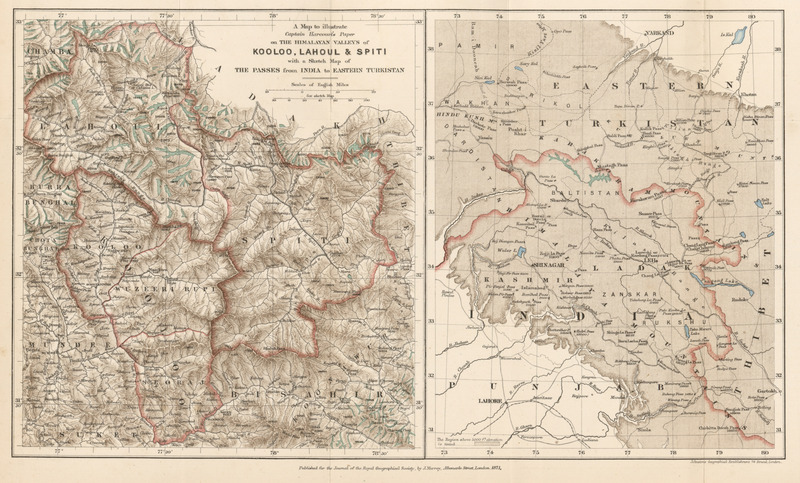 On the Himalayan Valleys: Kooloo, Lahoul, and Spiti. By Captain A.F.P. Harcourt, Bengal Staff Corps, F.R.G.S. Exploration via the Irrawaddy and Bhamo to South-Western China. By Major E.B. Sladen, F.R.G.S. 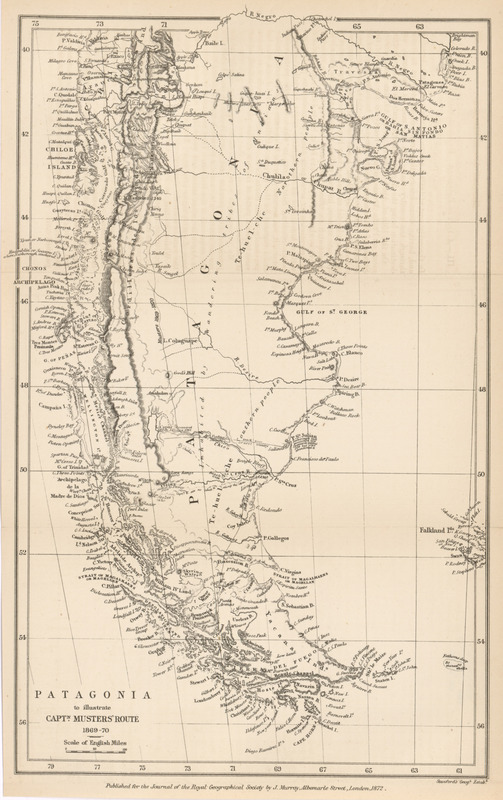 On the geographical positions of the tribes which formed the Empires of the Yncas, with an appendix on the name "Aymara." By Clements R. Markham, C.B., Secretary R.G.S. 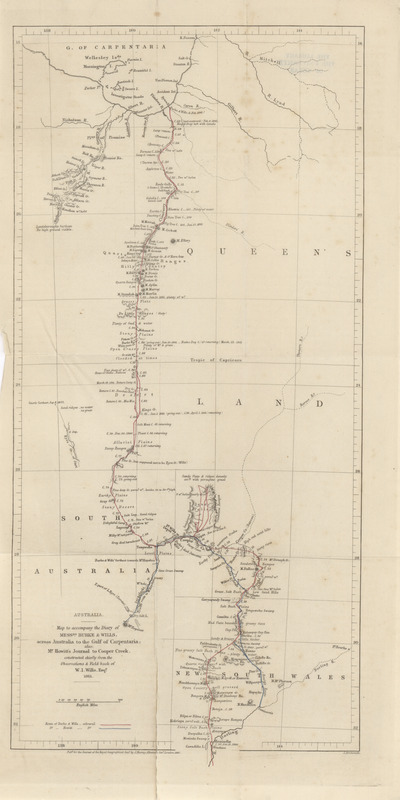 Journal of an expedition to explore the country from West Australia to Port Eucla, and thence to Adelaide, South Australia. By John Forrest, Government Surveyor. 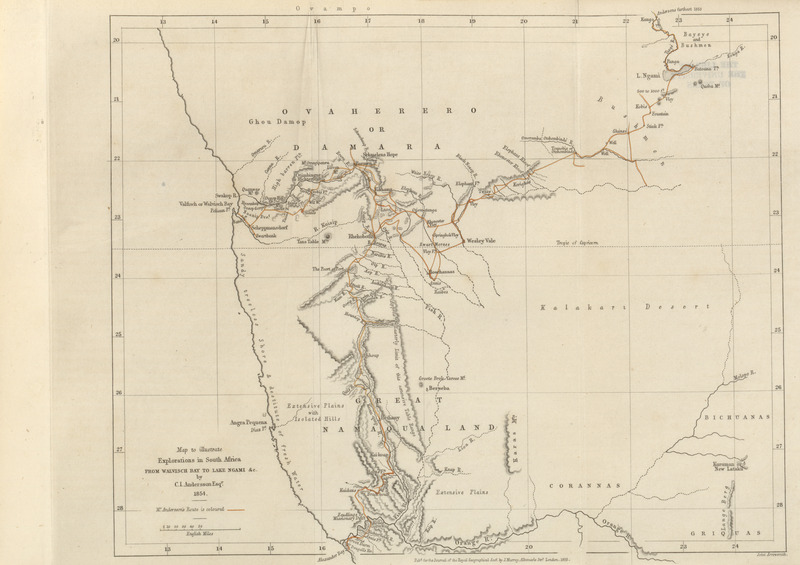 Journal of an expedition of the Limpopo River. By Captain Frederick Elton. A journey in Yezo. By Captain T. Blakiston, F.R.G.S. 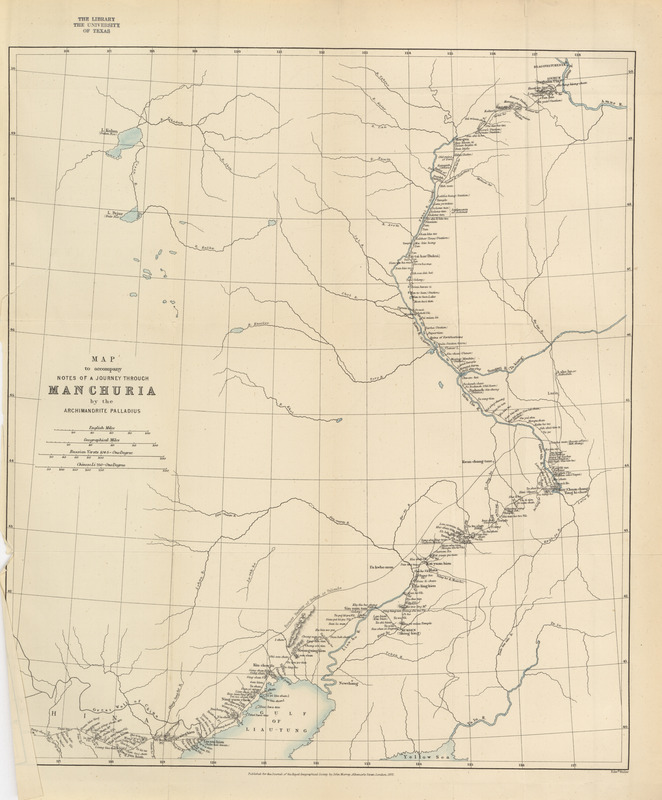 An expedition through Manchuria, from Pekin to Blagovetchensk, in 1870. By the Archimadrite Palladius, Chief of the Russo-Greek Church Mission at Pekin. Compiled from the journal of the Archimandrite, and translated by E. Delmar Morgan, F.R.G.S. 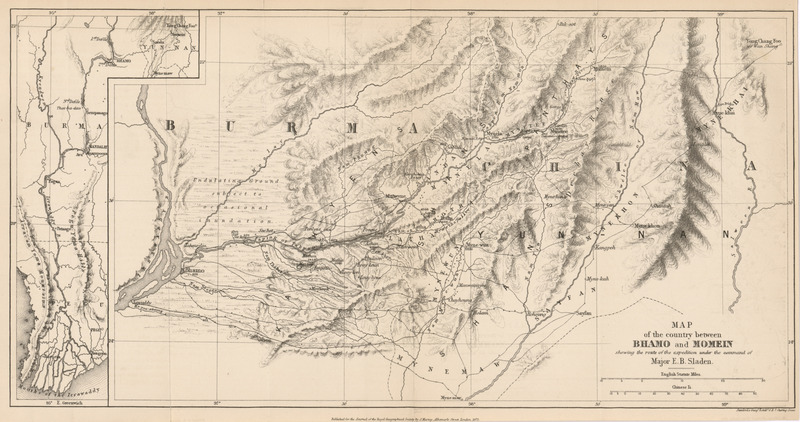 A Havildar's journey through Chitral to Faizabad, in 1870. By Major T.G. Montgomerie, R.E., F.R.G.S., officiating superintendent G.T. 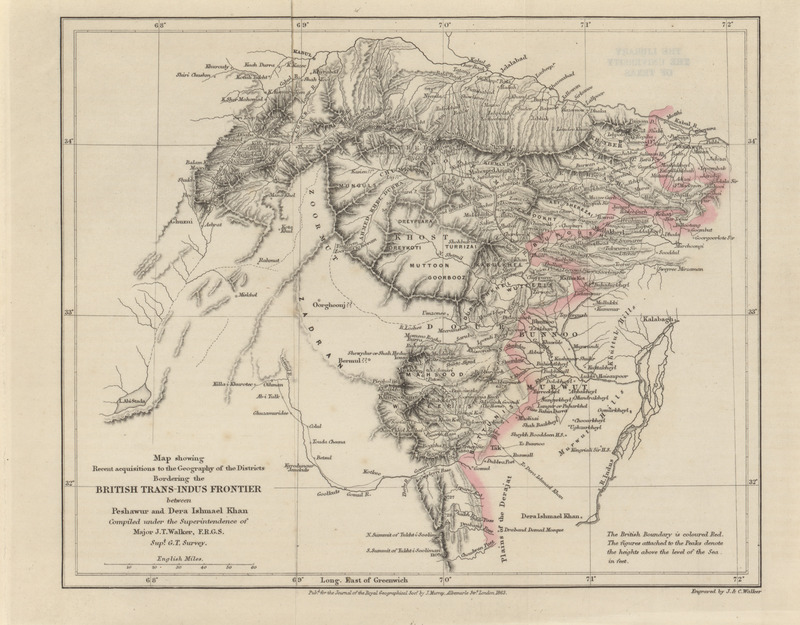 survey of India, in charge of the Trans-Himalayan exploring parties. 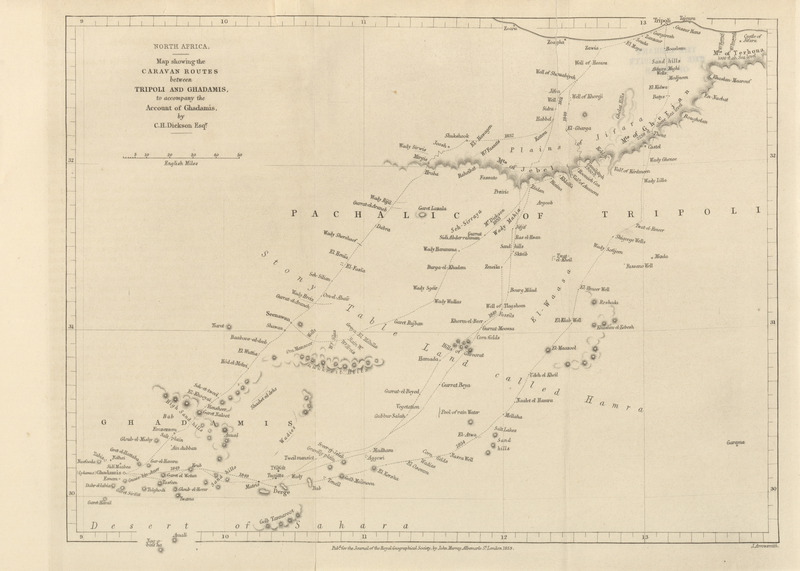 The New Hebrides and Santa Cruz groups. By Lieutenant A.H. Markham, R.N. On the island of Saghalin. By Colonel Veniukof. Translated from the Russian "Voyenni Sbornik." By Captain Spalding, 104th Regiment. 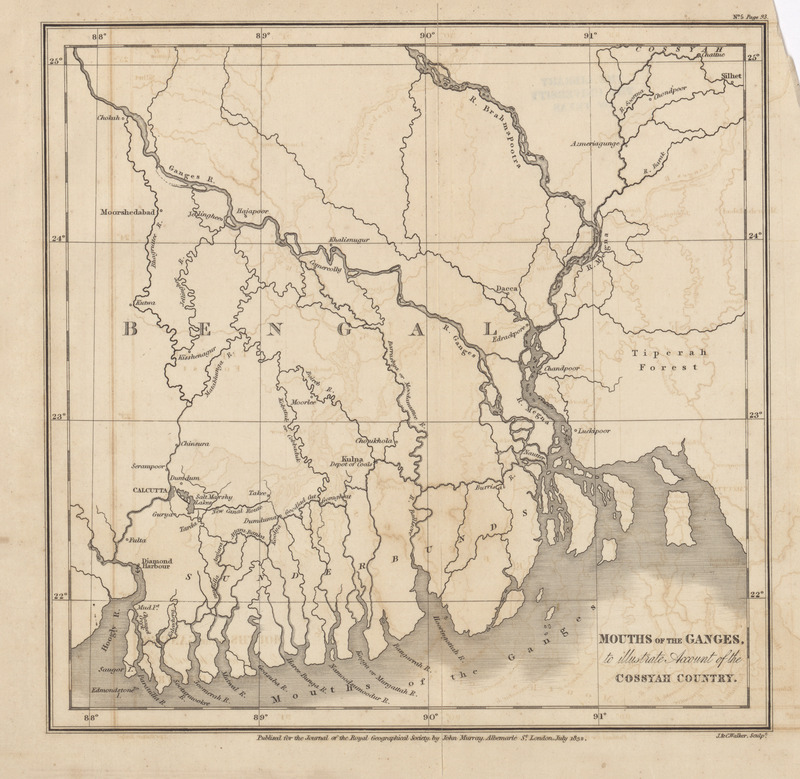 Notes on the physical geography of the Bhawulpore State. By J.W. Barns, F.R.G.S., Superintendent of Irrigation, 1872. 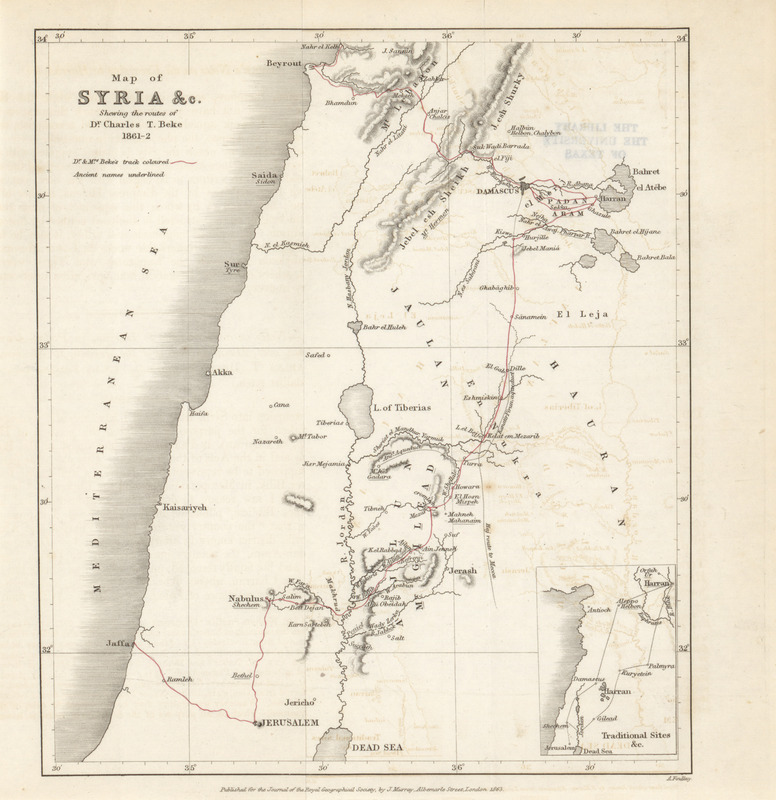 Notes of a reconnaissance of the Anti-Libanus. By Richard F. Burton, F.R.G.S., and Charles F. Tyrwhitt Drake, F.R.G.S. 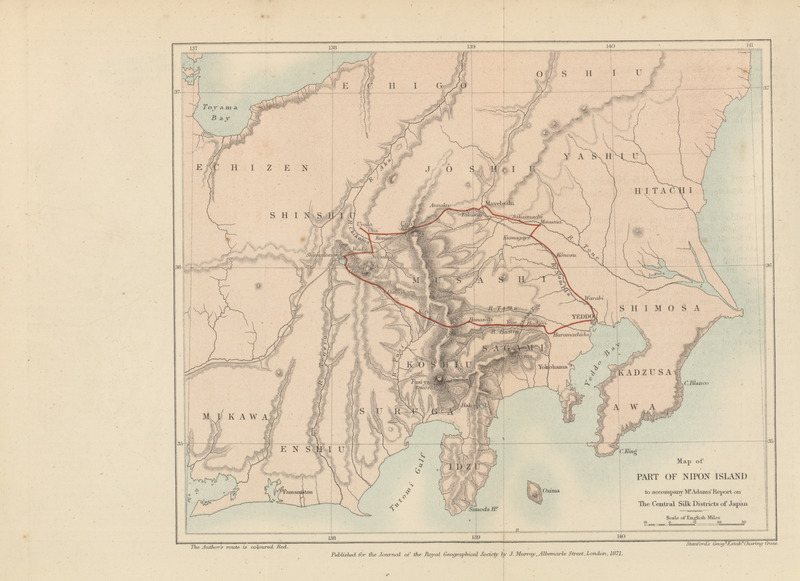 Journal of a tour through parts of the provinces of Echigo, Echiu, Kaga, and Noto, Japan. 1871. By J. Troup, Esq. On a projected railway route over the Andes, from the Argentine Rpublic. By r. Crawford, M.A., C.E. 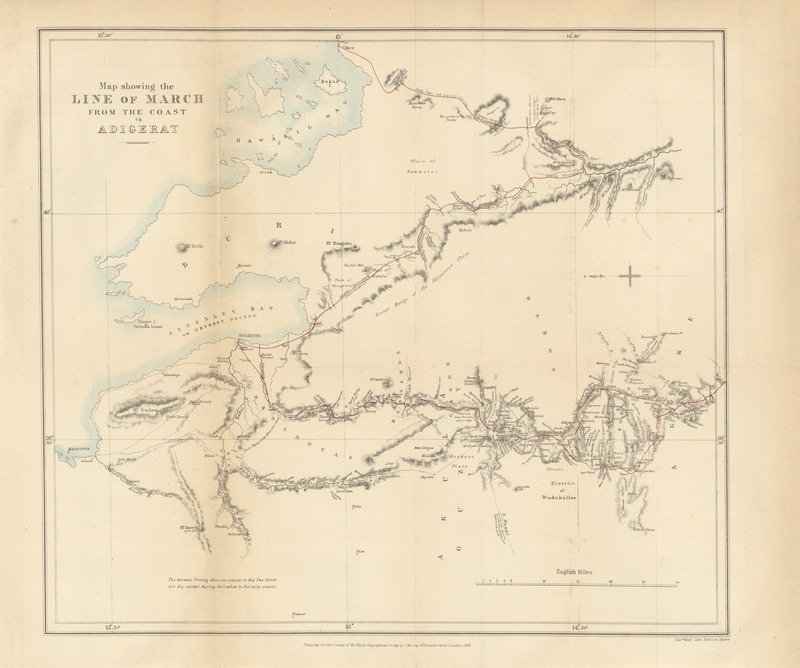 On discoveries East of Spitzbergen and approaches toward the North Pole on the Spitzbergen Meridian. By C.R. Markham, Esq., C.B., F.R.S., Secretary R.G.S. 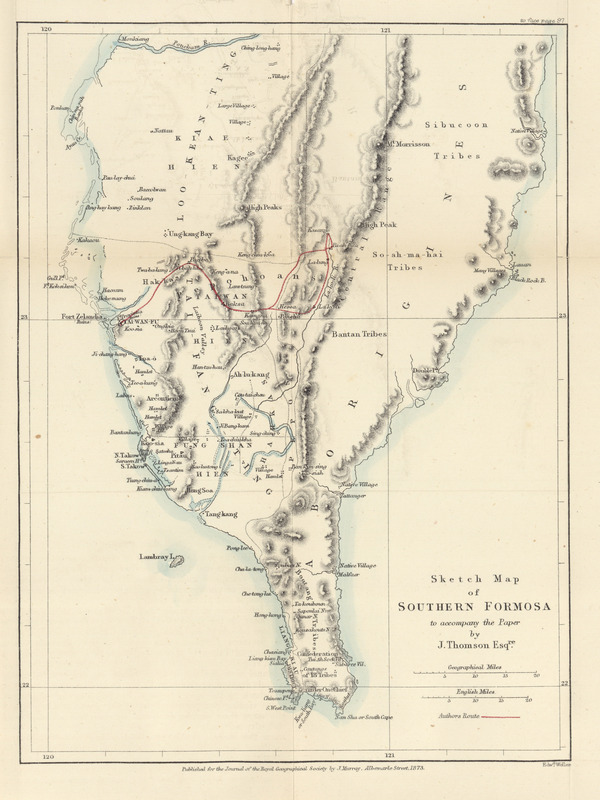 Notes on a journey in Southern Formosa. By J. Thomson, F.R.G.S. 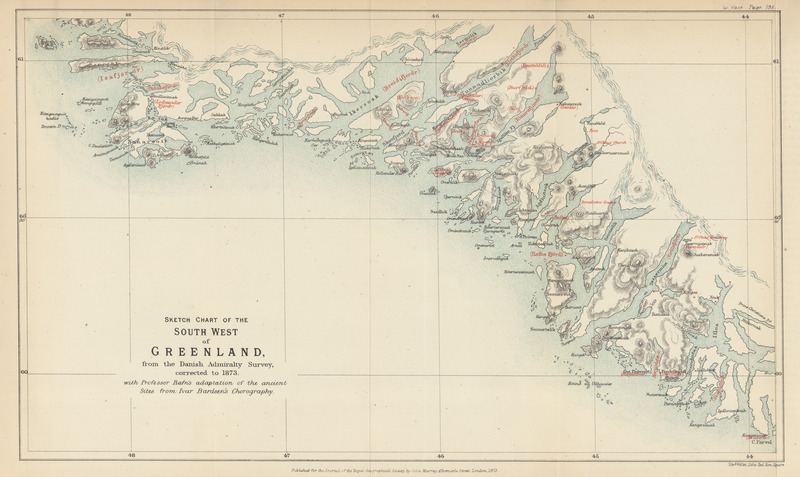 The site of the lost Colony of Greenland determined, and Pre-Columbian discoveries of America confirmed from 14th Century Documents. By R.H. Major, F.S.A., Secretary R.G.S. 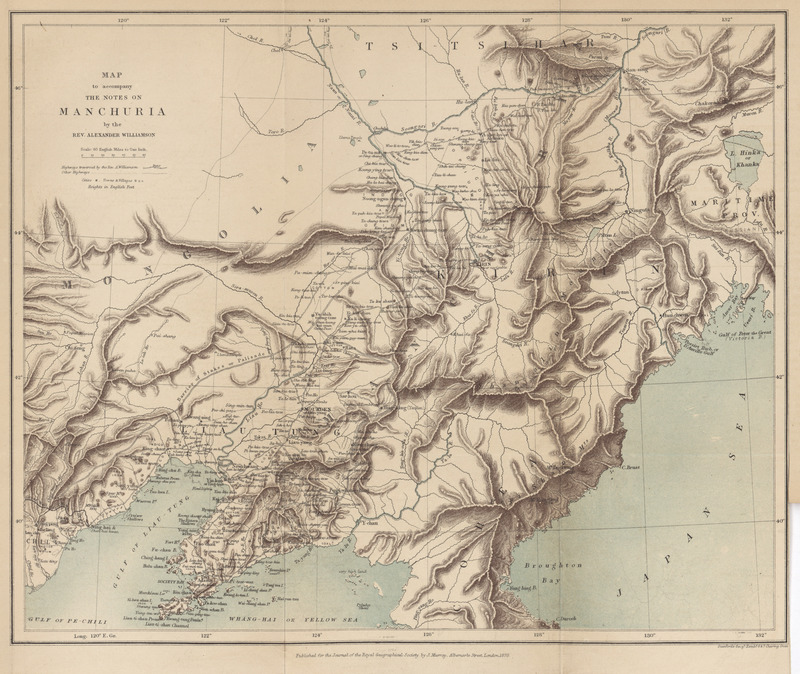 Notes on M. Fedchenko's map of Maghian. By R. Michell, Esq. Notes on Seistan. 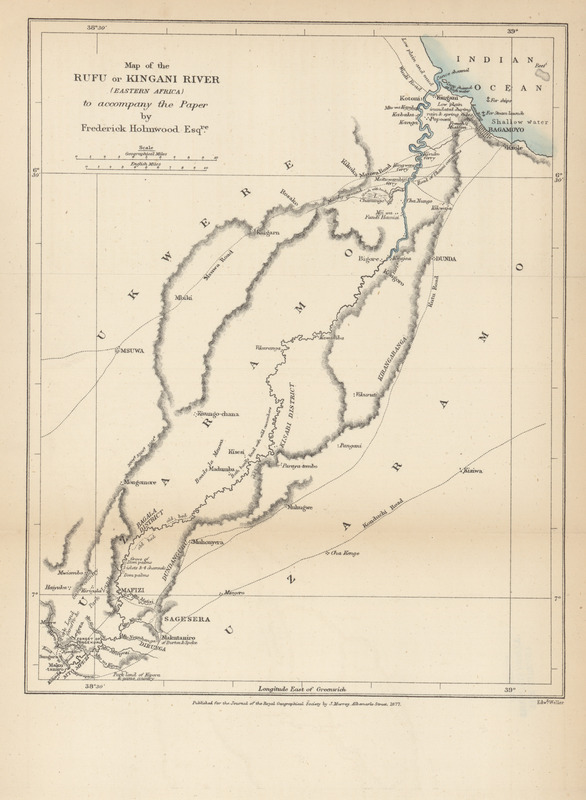 By Major-General Sir H.C. Rawlinson, K.C.B., President R.G.S. 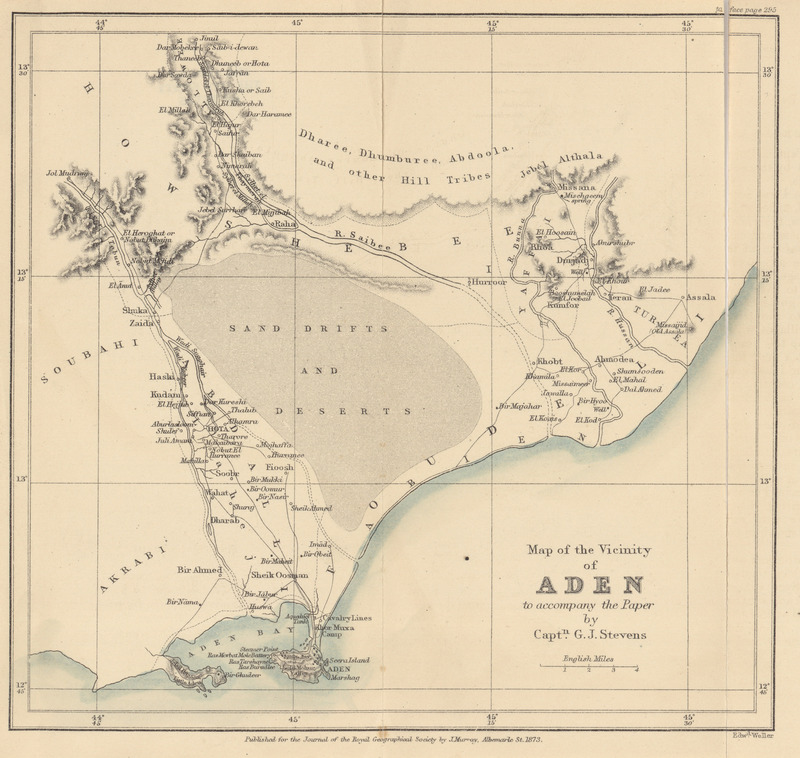 Report on the country around Aden. By Captain G.J. Stevens. 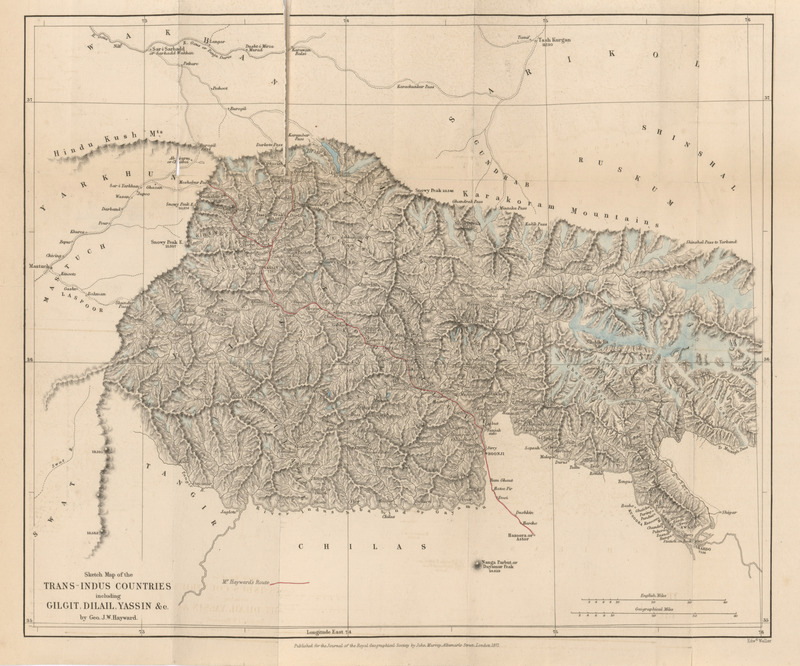 Recent discoveries at the Eastern End of New Guinea. By Captain J. Moresby, R.N. 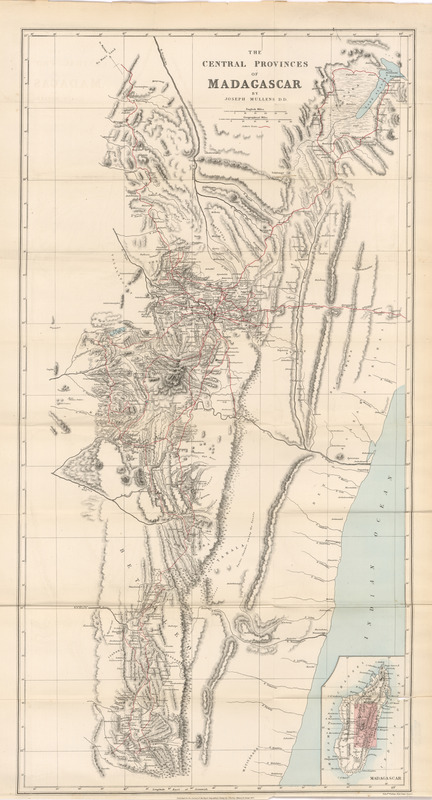 Notes on Southern Mangi. By George Phillips, H.M. Consular Service, China. With notes and remarks by Colonel Henry Yule, C.B. 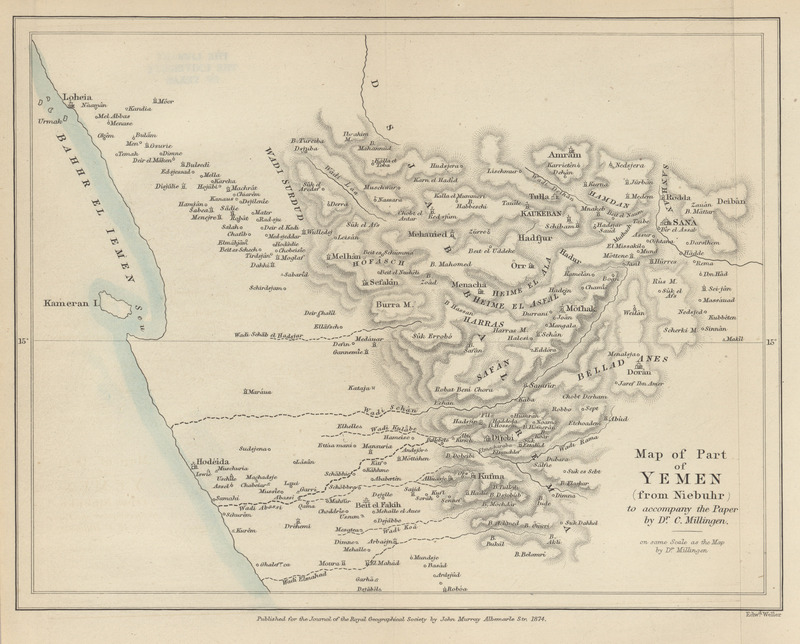 Notes on a journey in Yemen. By Charles Millingen, M.D. Edinburgh. On the coast country of East Africa South of Zanzibar. By Captain Elton. 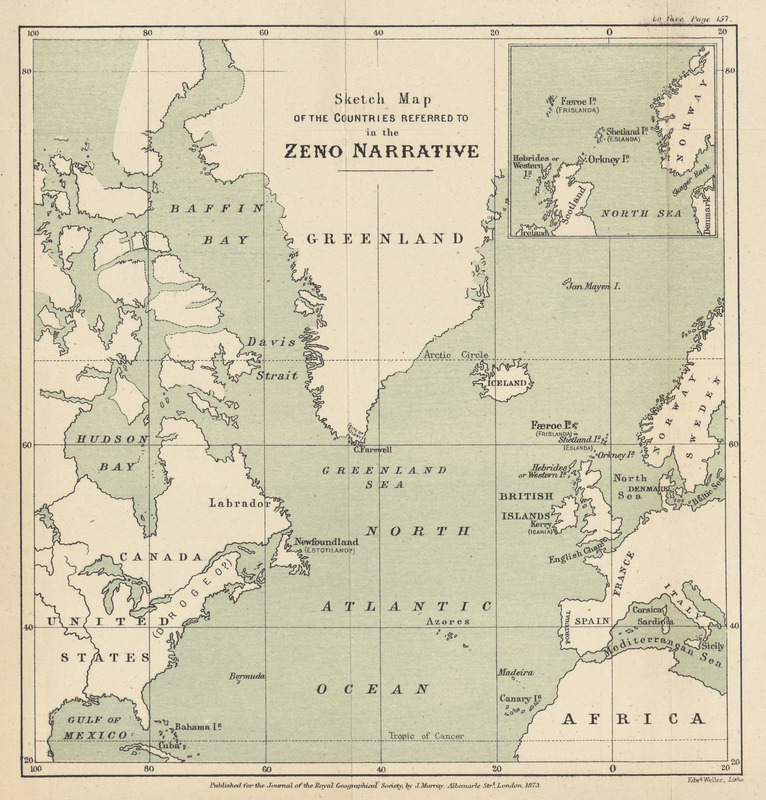 Inference applied to geography, with special reference to ocean currents and the Arctic regions. By General Hauslab, Vienna, Honorary Corresponding Member R.G.S. 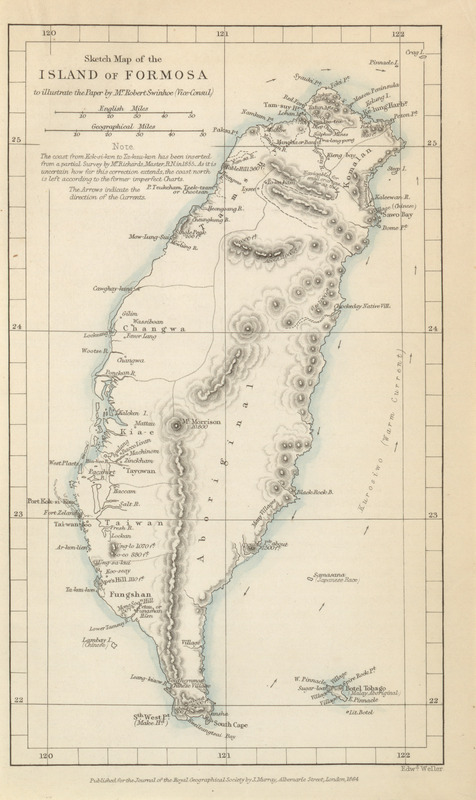 On the central provinces of Madagascar. By Joseph Mullens, D.D., Foreign Secretary of the London Missionary Society. 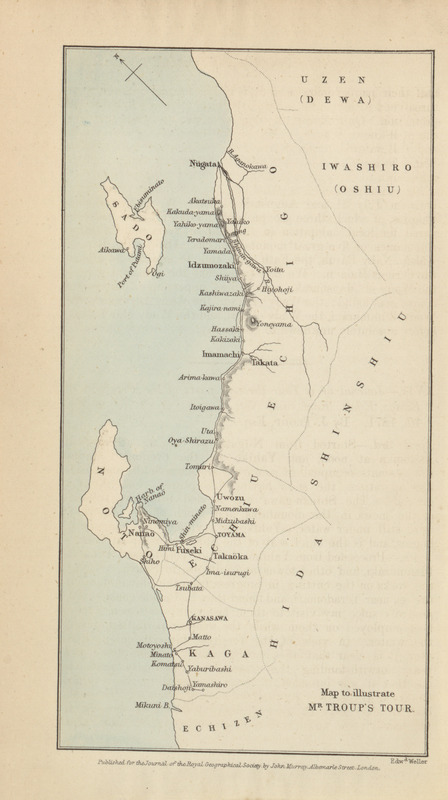 Examination of the Southern half of Lake Tanganyika. By Lieut. V.L. Cameron, R.N. ; compiled chiefly from Lieut. Cameron's Diary, by C.R. Markham, Esq., C.B., F.R.S., Secretary R.G.S. 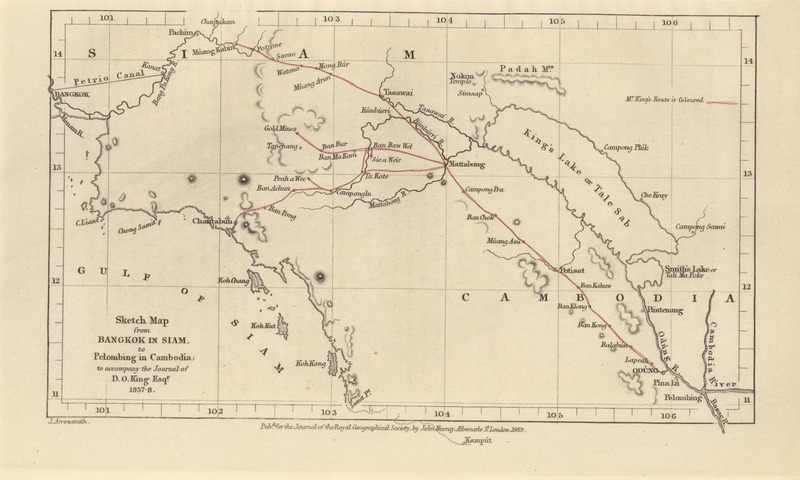 Trade routes between British Burmah and Western China. By J. Coryton. 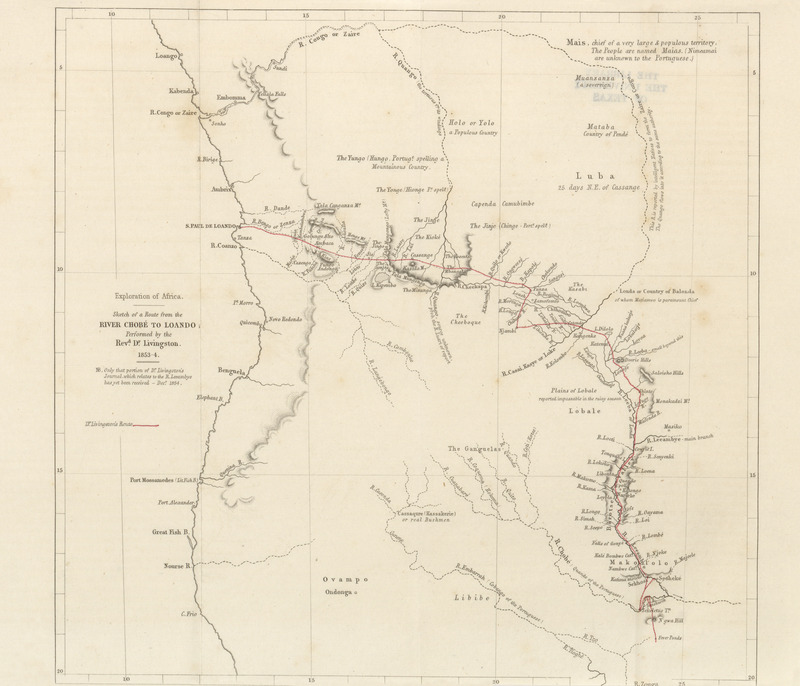 Journal of the Western Australian exploring expedition through the centre of Australia, from Champion Bay to the Overland Telegraph Line between Adelaide and Port Darwin. By John Forrest, F.R.G.S. 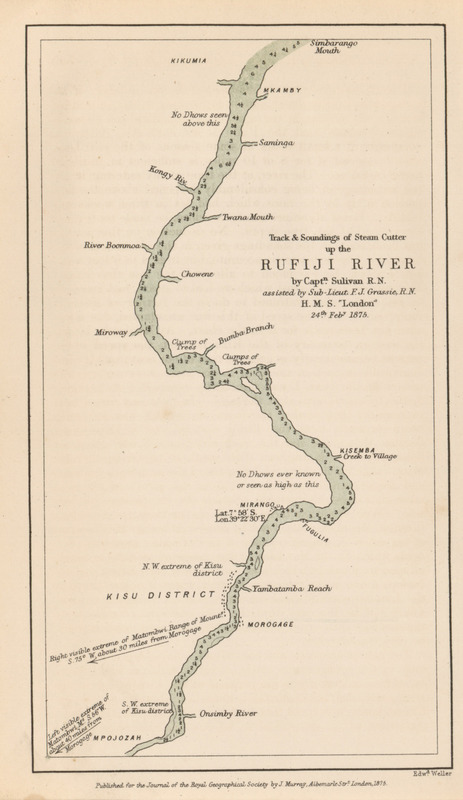 Survey of the lower course of the Rufiji River. By Captain G.L. Sullivan, R.N. Communicated by the Lords Commissioners of the Admiralty. 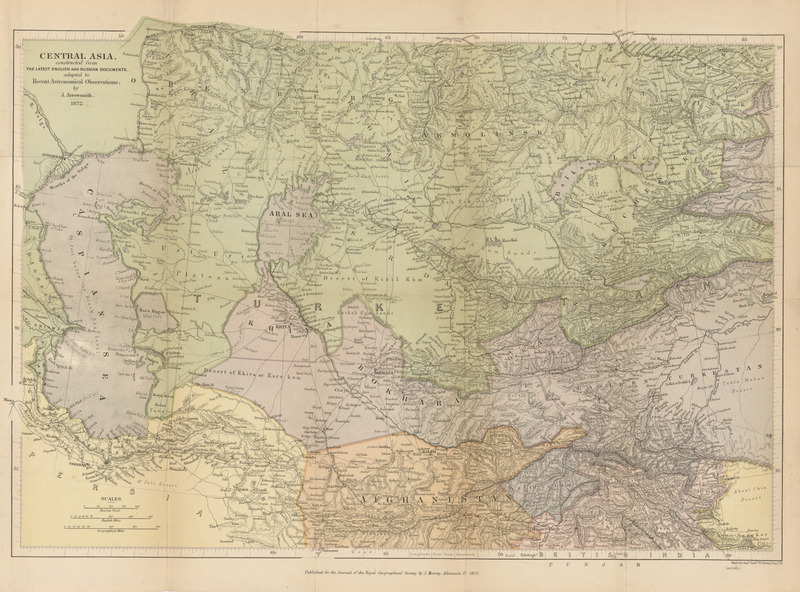 Note to Arrowsmith's map of Central Asia. 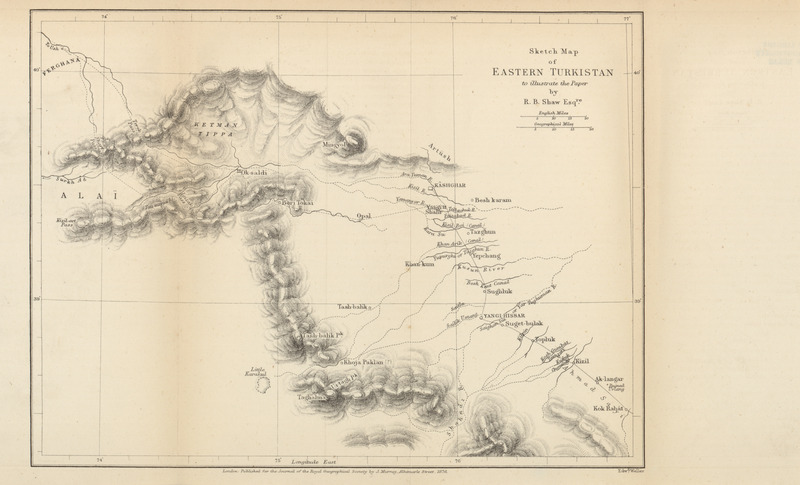 A Prince of Kashghar on the geography of Eastern Turkistan. By R.B. Shaw. 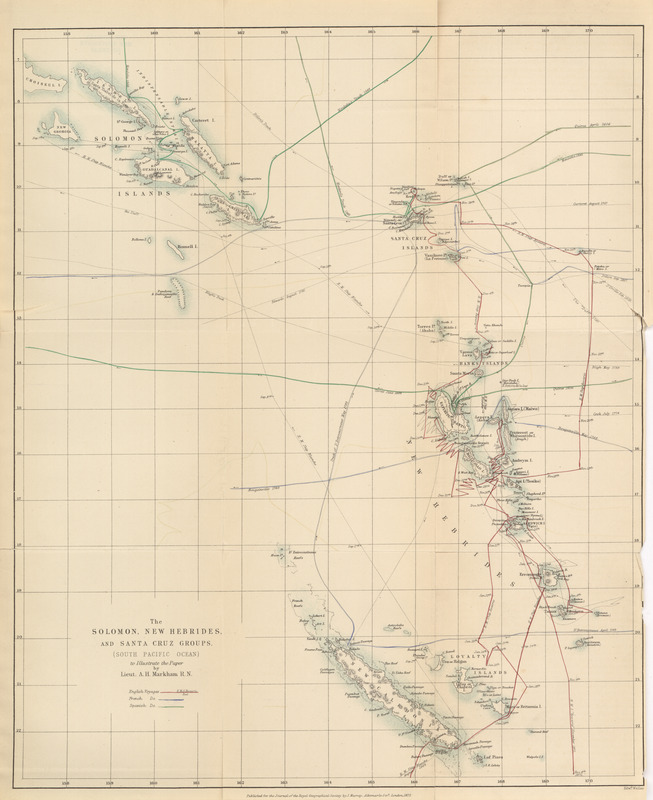 Notes accompanying a chart of a portion of the Niger Delta. By Richard Doubleday Boler and Robert Knight. 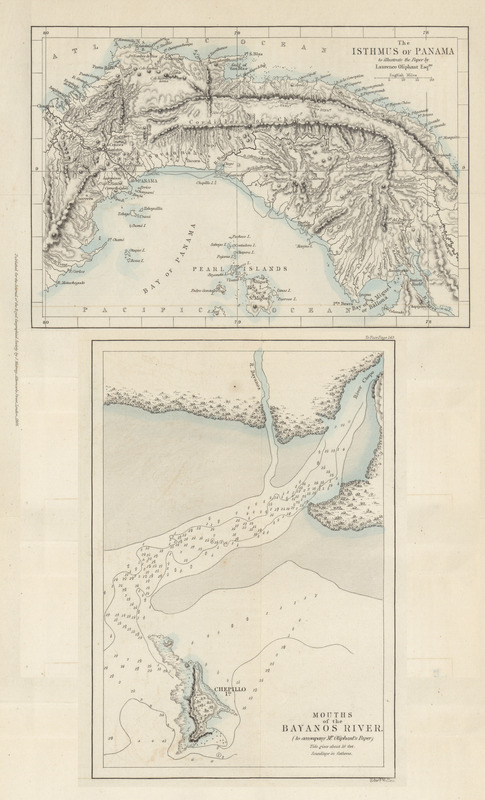 Meteorological observations taken on the White Nile, between Khartum and Rigaf, 1874. By Lieut. Watson, R.E. Note on Lieut. 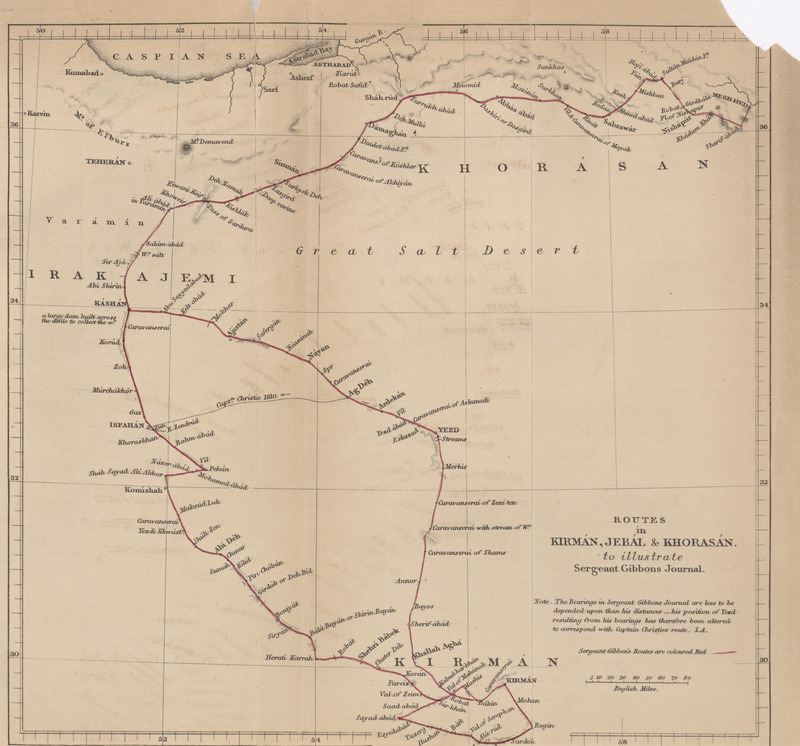 Grandy's map of his journey from Ambriz to San Salvador and the Congo. By W.J. 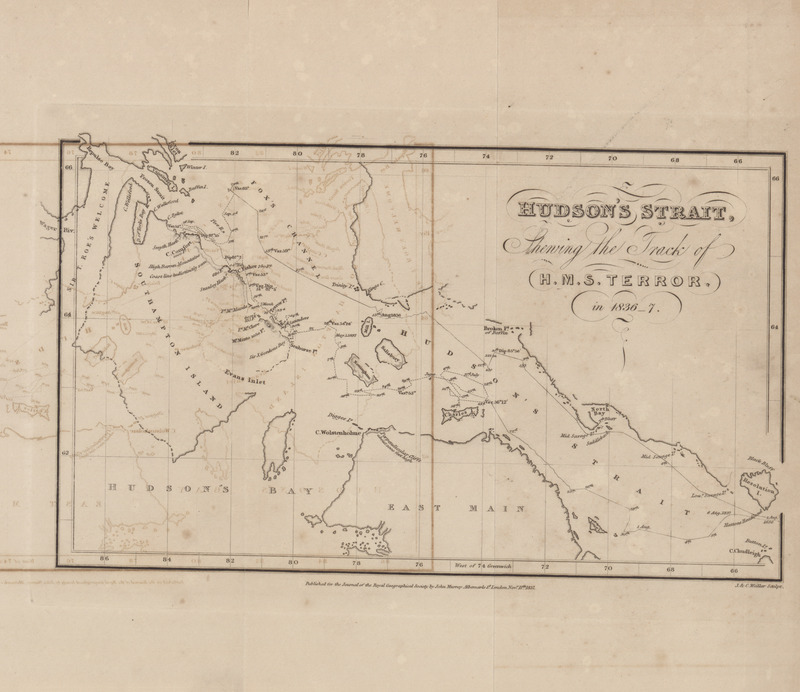 Turner, assistant map curator R.G.S. 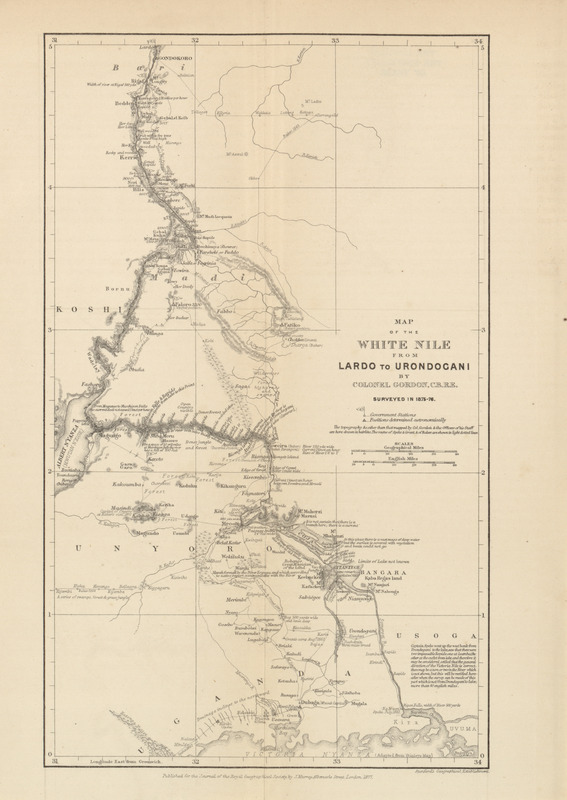 Notes to accompany a survey of the White Nile, from Lardo to Nyamyungo. By Col. C.G. Gordon, R.E., C.B. 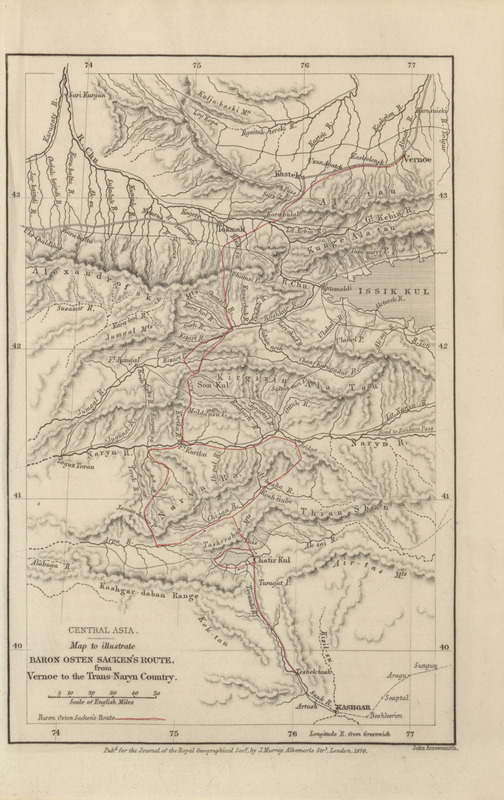 Account of the Pundit's journey in Great Tibet from Lef in Ladakh to Lhasa, and of his return to India via Assam. By Captain H. Trotter, R.E. 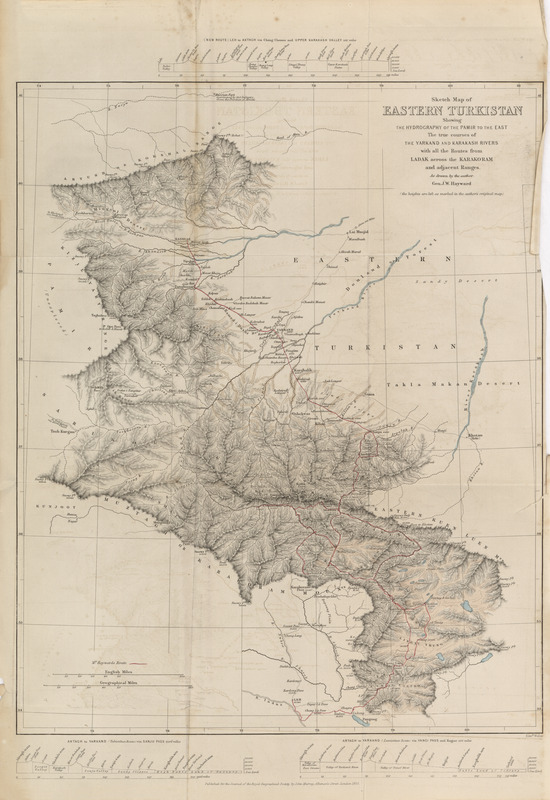 Notes on Bolivia, to accompany original maps. By George Chaworth Musters, retired commander, R.N. 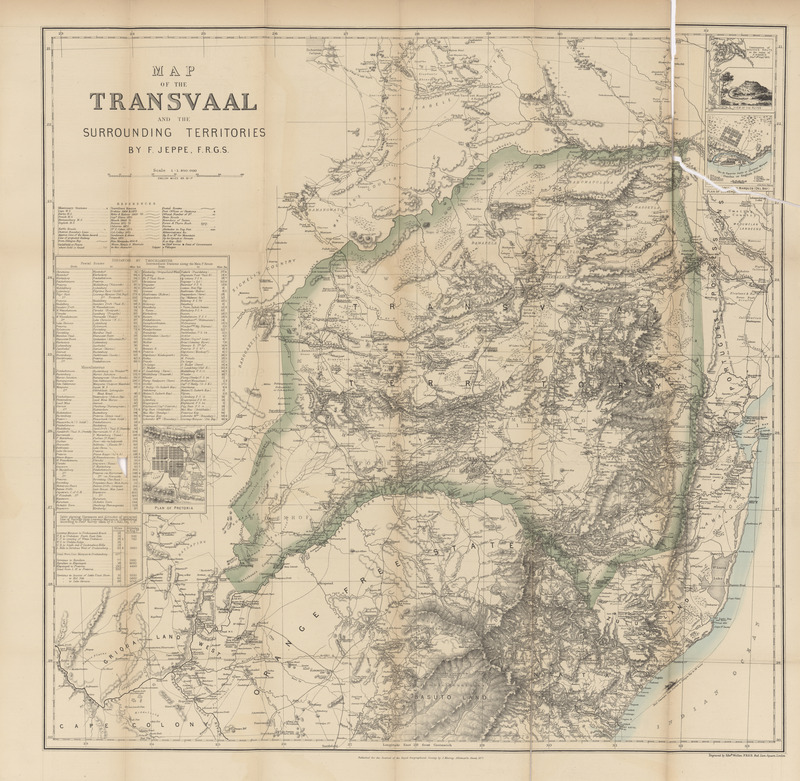 Notes on some of the physical and geological features of the Transvaal, to accompany his new map of the Transvaal and surrounding territories. By Frederick Jeppe, F.R.G.S. The Desert of Atacama (Bolivia). By Josiah Harding, A.I.C.E. The Kingani River, East Africa. By Frederick Holmwood, Assistant-Political Agent, Zanzibar. 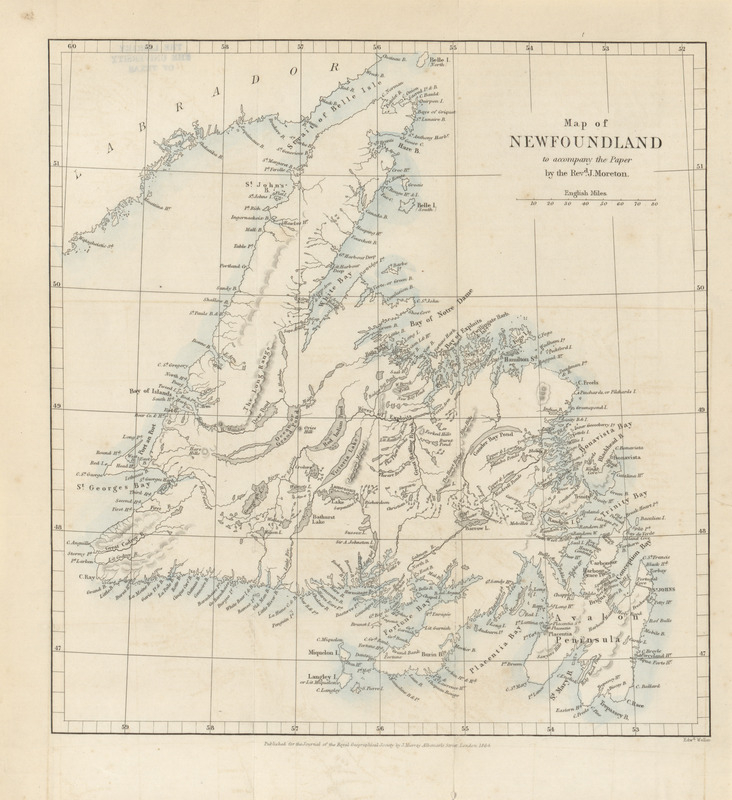 Geography and resources of Newfoundland. By Alexander Murray. 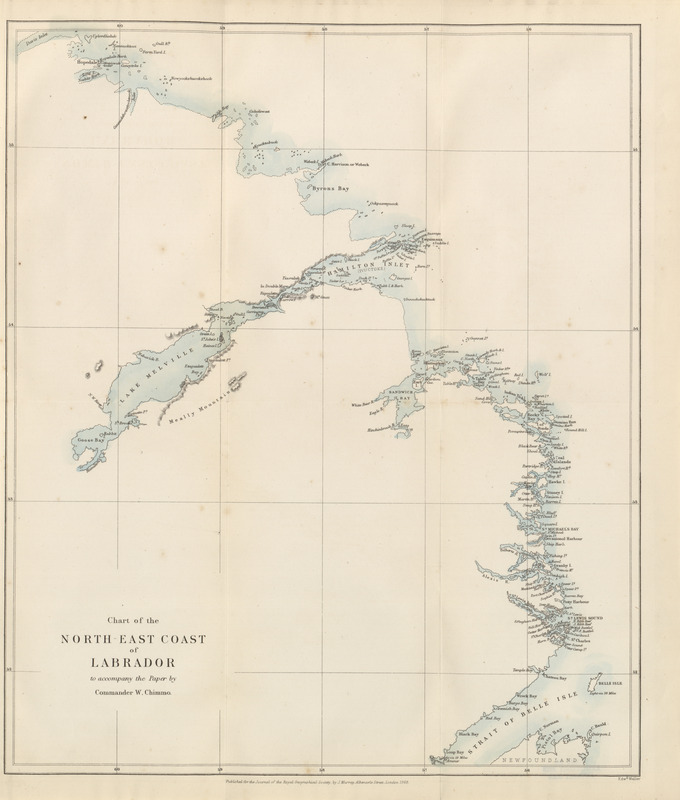 Report on a journey across the Island of Newfoundland, undertaken at the instance of his excellency Sir J. H. Glover, from the southwest arm of Green Bay, via Gold Cove in White Bay, to the east arm of Bonne Bay. By Staff-Commander George Robinson, R.N. 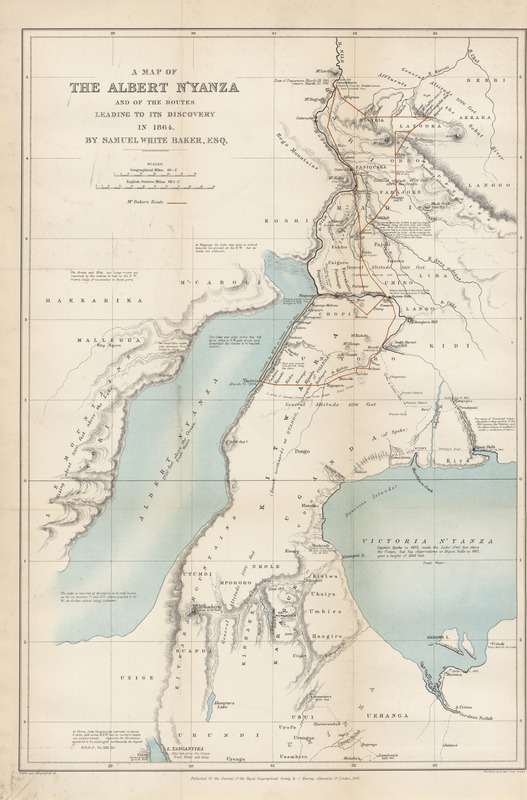 On the geographical results of the mission to Kashghar, under Sir T. Douglas Forsyth in 1873-1874. By Captain H. Trotter, R.E. 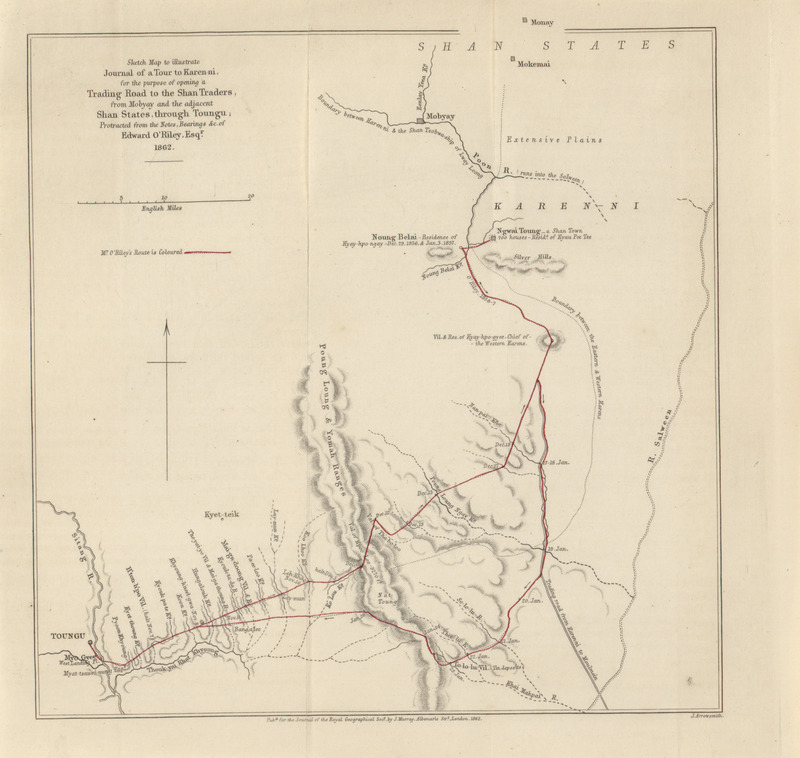 Report on the general features of the interior of South Africa, between Barkly and Gubuluwayo; to accompany map of the route. By Alex C. Bailie, Government Land Surveyor. 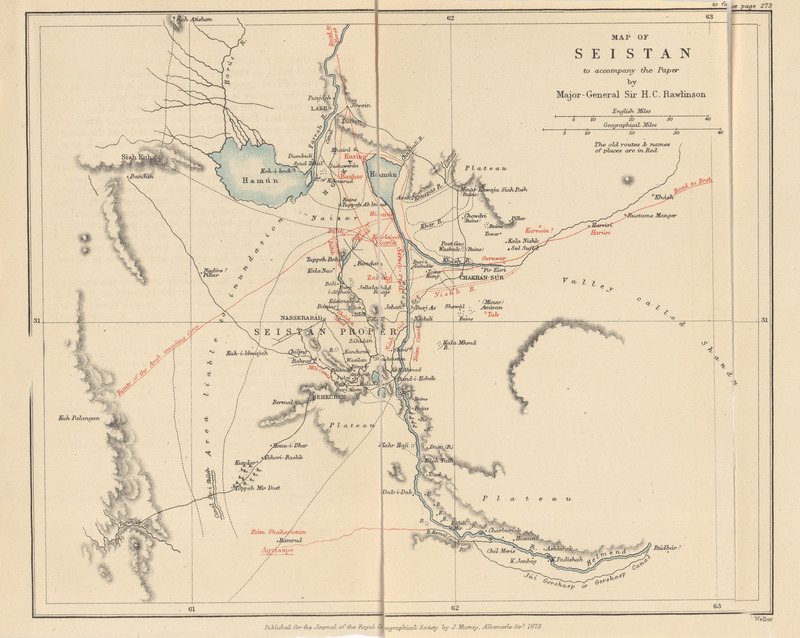 Itineraries of the Second Khedivial Expedition: Memoir explaining the new map of Midian made by the Egyptian staff officers. By Richard F. Burton. 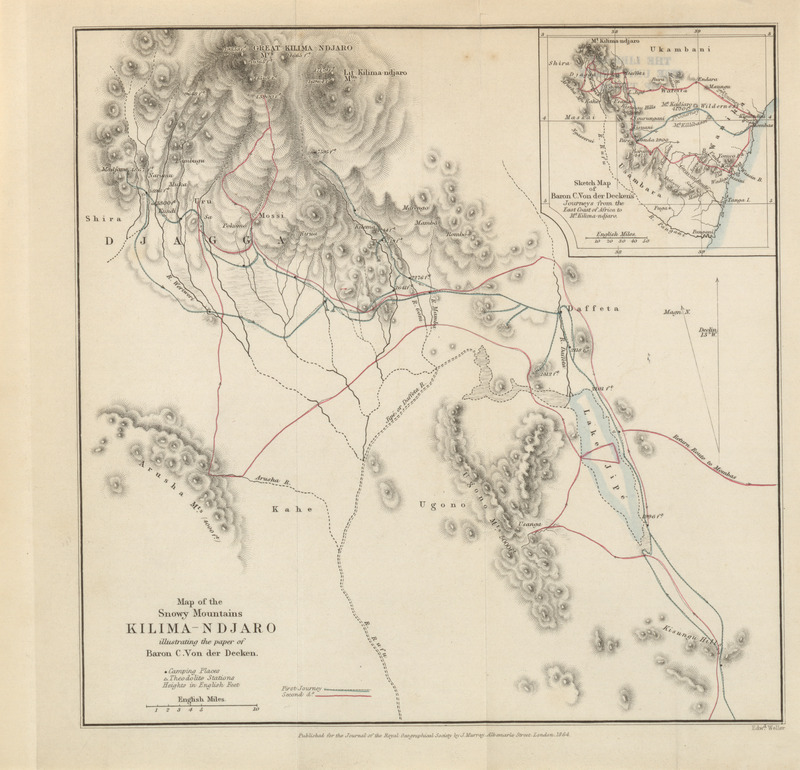 An account of the country traversed by the second column of the Tal-Cho'tia'li Field Force in the Spring of 1879. By Lieut. R.C. Temple, F.R.G.S., M.R.A.S., Bengal Staff Corps; lately attached to the 1st Goorkha Light Infantry. 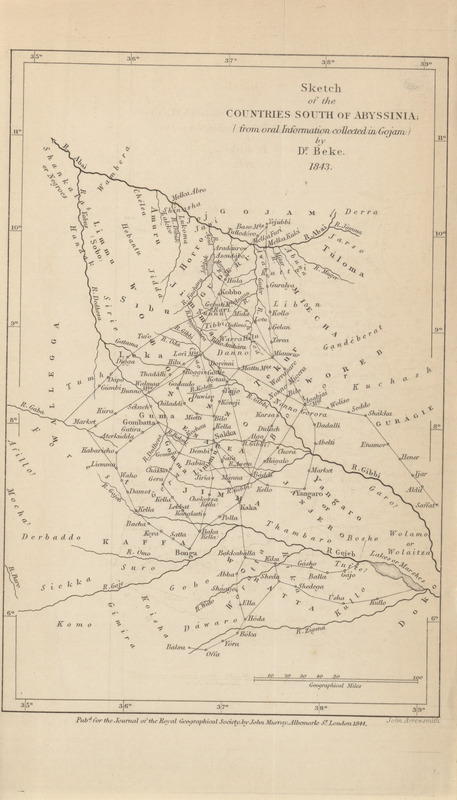 Notes upon some astronomical observations made in Kordofan and Darfur. By Major H.G. Prout, Corps of Engineers, Egyptian General Staff. 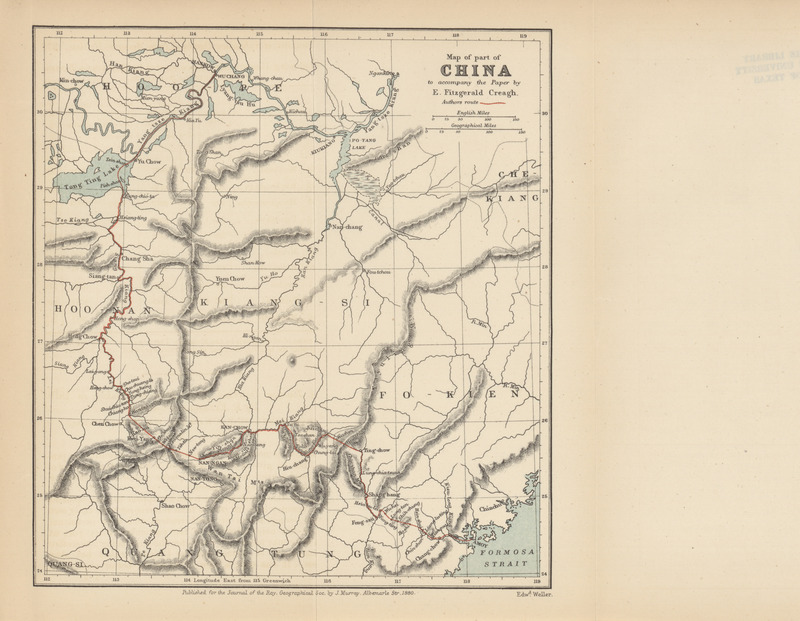 A journey overland from Amoy to Hankow in 1879. By E. Fitzgerald Creagh.